Musician Eric Clapton is shown performing on stage during a “live” concert appearance. JR’s interest in photography was sparked when he won a Yashica 35mm camera at a Stanley Works Foreman’s Club picnic. He and his friends were into developing their own photos of road rallies, picnics and river cruises in his boat. Jeanne is publicist and adult program coordinator for the Southington Public Library. As a child, she photographed family with her Brownie camera. Later, she attempted painting, but found digital photography more satisfying. 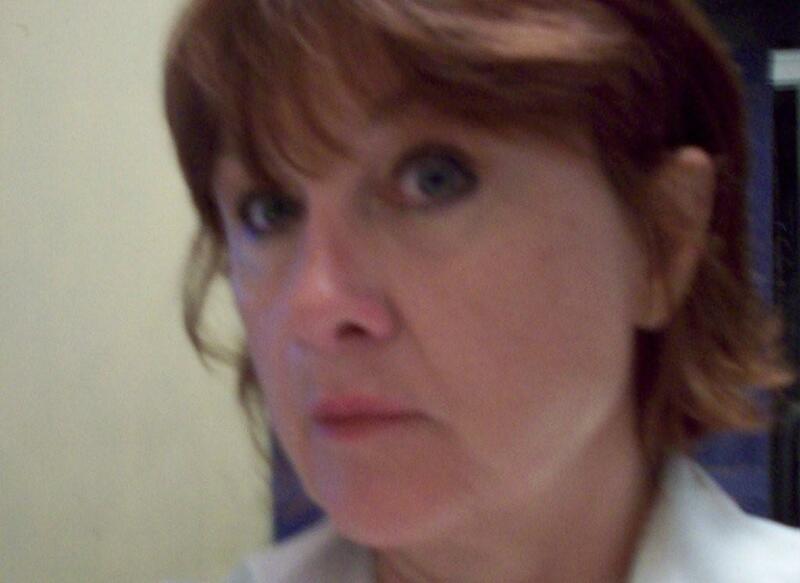 Jeanne is now using databases available through the library, Universal Class and Lynda.com to take better photos. 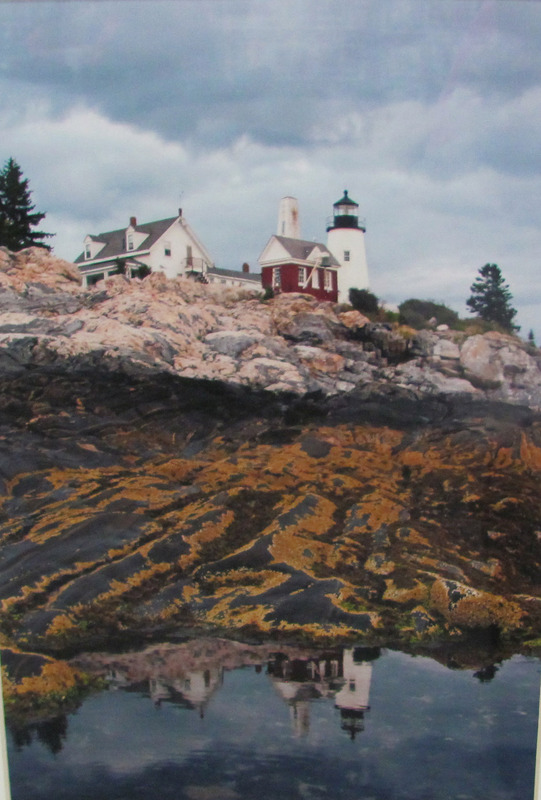 The exhibit includes photos from their travels to Cape Cod, Connecticut shore, Vermont and Michigan. Southington resident Dan Brookes has been a writer, photographer, and graphic artist for over sixty years. 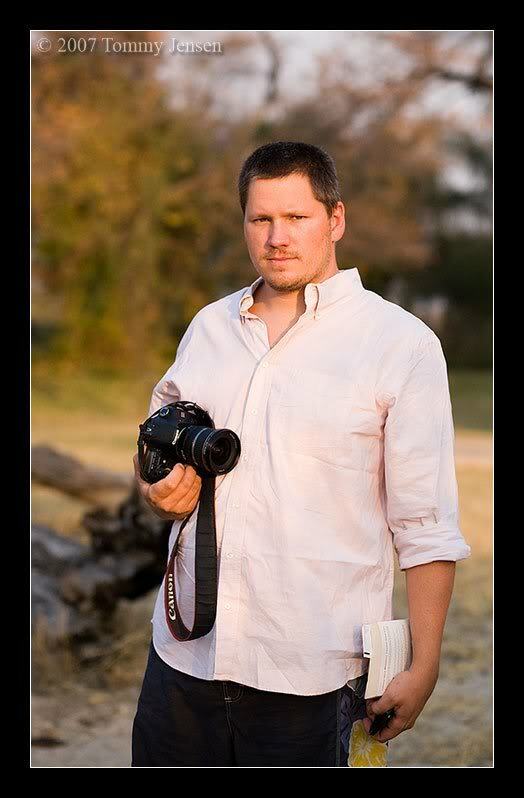 He has traveled the world and photographed everything from babies and weddings to the indigenous peoples of the Amazon. Dan recently co-authored a book based on his tour of duty in Vietnam during 1966 and 1967 as a photographer and photo lab technician. It is entitled “Shooting Vietnam” and is a series of firsthand accounts by Brookes and several military combat photographers. 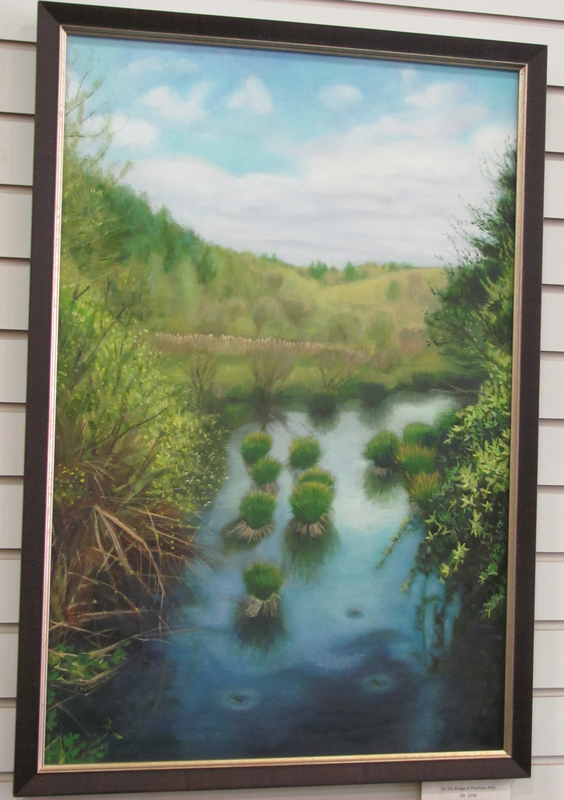 The Farmington River Artists were formed by Barbara Scott, composed of students of the Farmington River School of Art, Plainville’s premier school of art for adults. 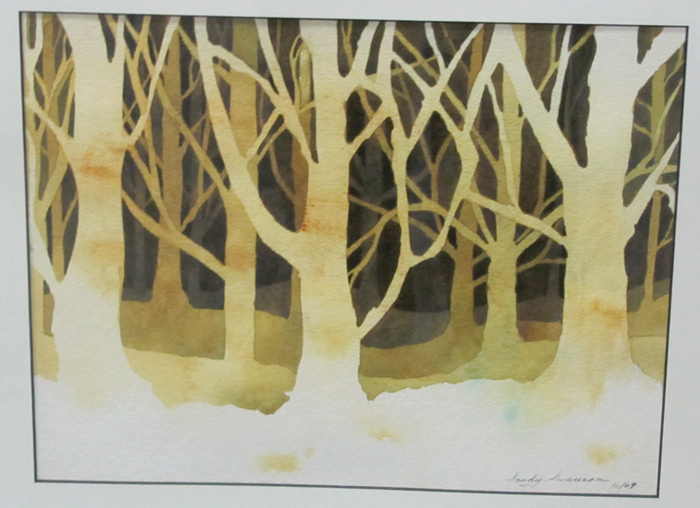 Members exhibiting at the Southington Public Library during October are, Abbe Wade (P.R. 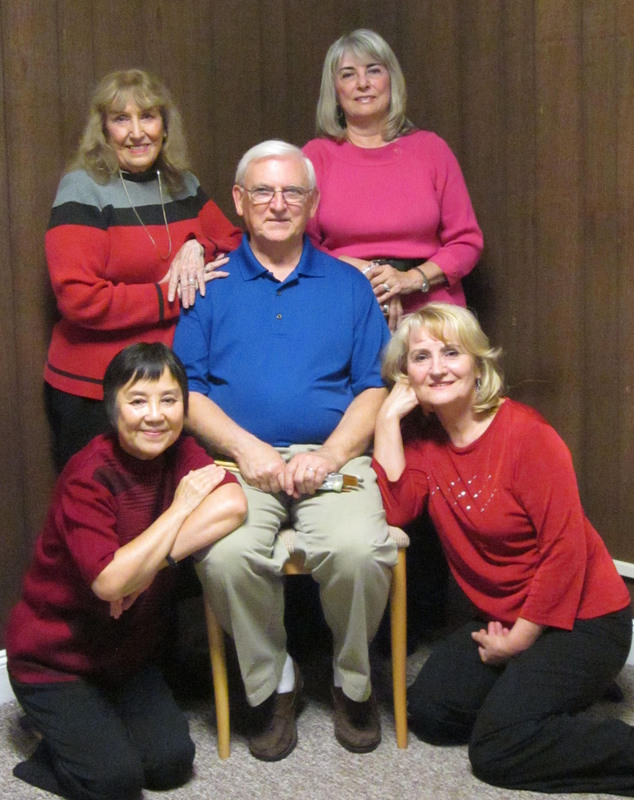 Bailey), Renald Fecteau, Agnes Wong, Dolores “Dee” Krampitz, Zofia Soto and Beverly Hollis. Agnes Wong, of Farmington, was born in Hong Kong and considers herself a realistic painter. She always challenges herself to go to new dimensions in acrylics, her favorite medium. Dee Krampitz, of Plainville, is a graduate of Paier College of Art and has worked as a Graphic Designer for 23 years. Her love of horses has been the inspiration for her unique paintings. 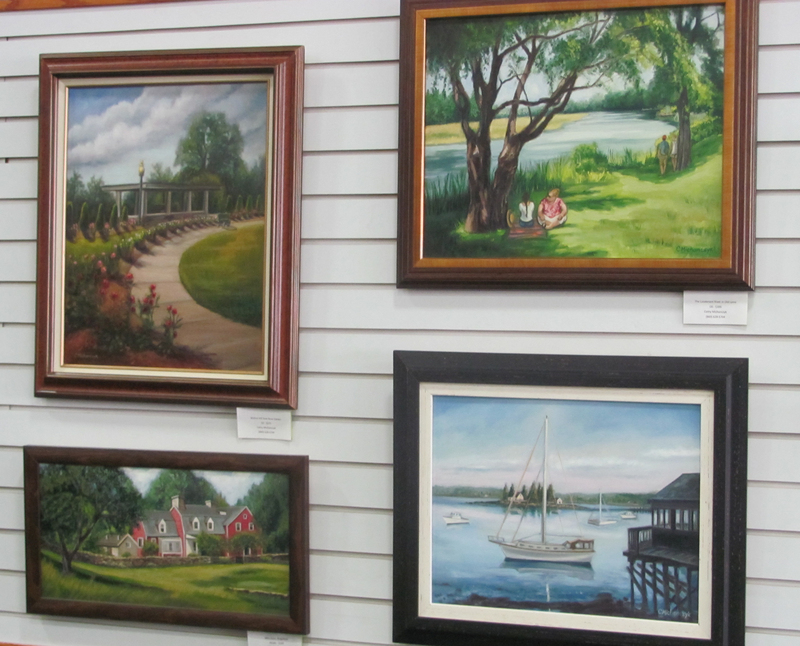 Beverly Hollis, of Wolcott, paints realistic as well as impressionistic. Her favorite subjects are portraits of animals and people, although she paints other subjects as well. Ray Fernaldi, of Southington, started painting when he retired. He paints in oils, acrylics, and recently watercolors. His favorite subjects are landscapes and seascapes, which he has a passion to paint. Zofia Soto, of East Berlin, was born in Poland, loves bright colors and incorporates them in her paintings of people, flowers, and awesome landscapes. She paints in oils and acrylics. 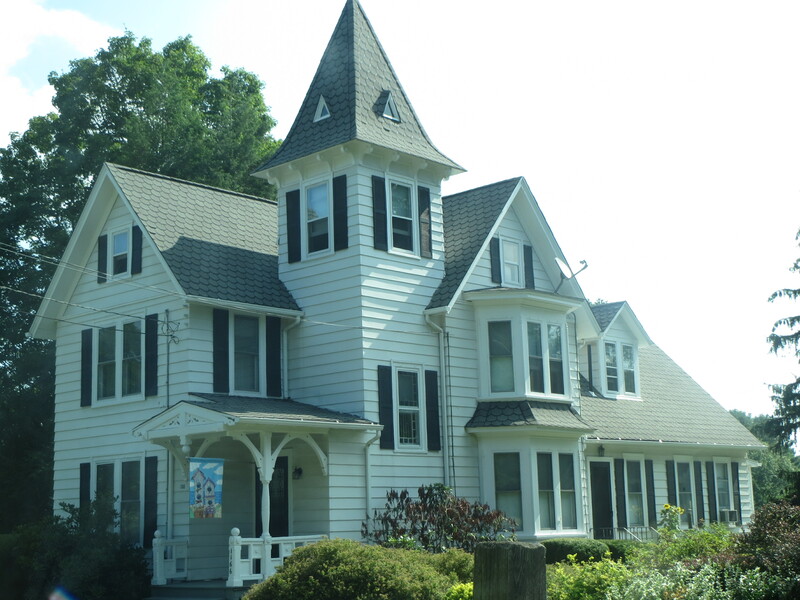 P. R. Bailey (Abbe), of Unionville, opened her art school, The Farmington River School of Art, Plainville’s premier school of art for adults, where she is a multi-media teacher. 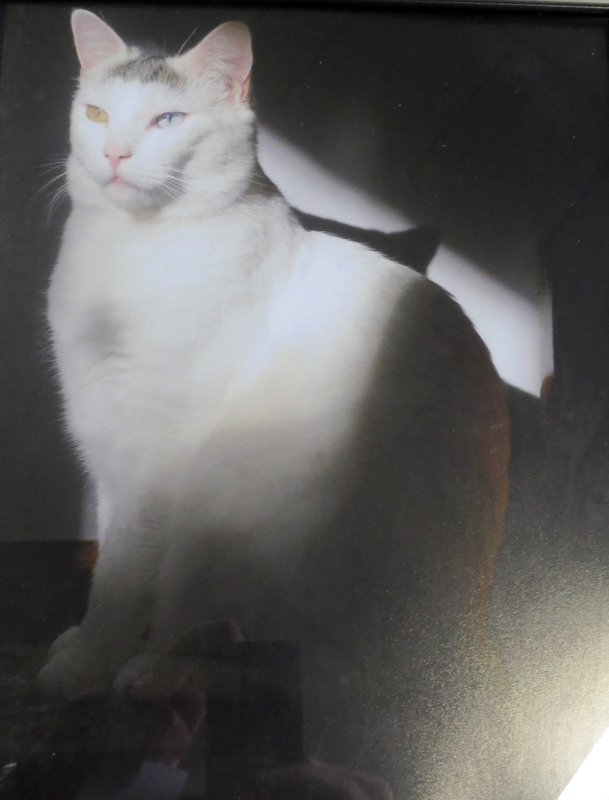 She specializes in portraiture and animal portraits. Ms. Bailey has been teaching art for 60 years and loves watching students’ progress into more experienced painters, with a new appreciation for the world around them! The artists invite the community to a Meet and Greet reception in the café at the Southington Public Library, Wednesday, October 19th 7:00 p.m.
Vanda Koceva, a Bristol resident and native of Poland, studied art as a teenager in Warsaw. 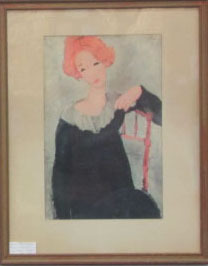 While a member of the Bristol Art League, she exhibited regularly in their gallery. 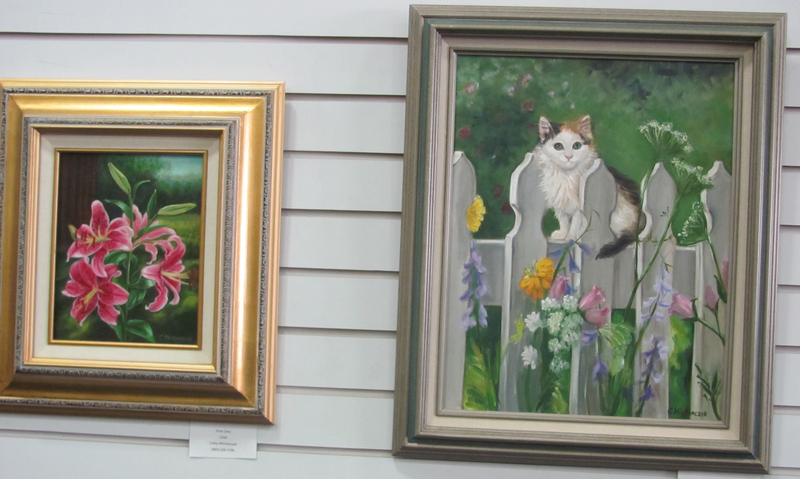 To share her paintings with more of the public, she also exhibited her art in local businesses, in addition to participating in various outdoor and Christmas shows. 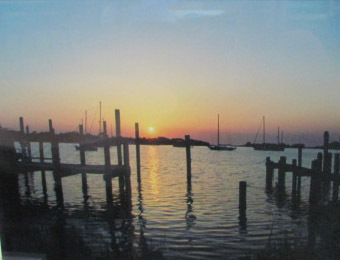 Vanda’s deep faith is exhibited in many of her pastel and watercolor works. 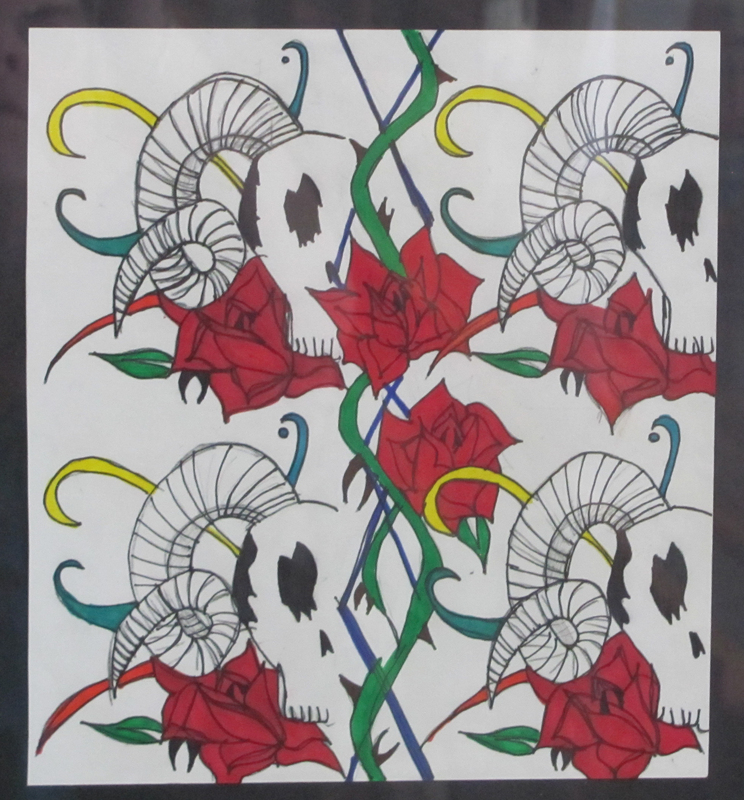 Vanda’s art will be on exhibit September 1st through 30th in the Gallery at the Library. Necla Balasaygun invited the community to meet her and view her artwork on Tuesday, August 2, 7:00 – 8:00 p.m. at the Southington Public Library Gallery, 255 Main Street, Southington, CT. 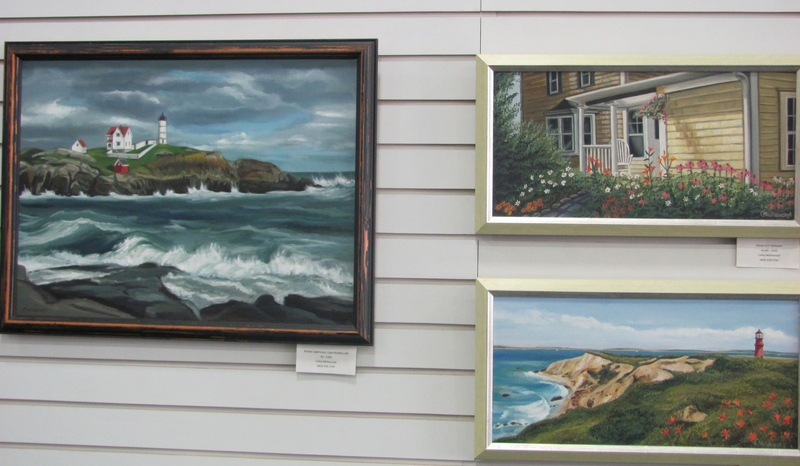 The Southington Public Library welcomes Ms. Balasaygun a Bristol resident who was born in Istanbul, Turkey to exhibit her oil paintings August 1st through August 31st in the Gallery. Her works have been on exhibit around Connecticut receiving high praise. As a member of Southington Arts and Crafts Association (SACA) she won the “Best in Oil” award at SACA’s 2015 juried art show and most recently exhibited at The Orchards at Southington and the Southington Community Cultural Arts Center’s (SoCCA) private opening. Art has been very important to Necla since an early age, upon moving to the United States her focus shifted to her family but art was still in her heart. 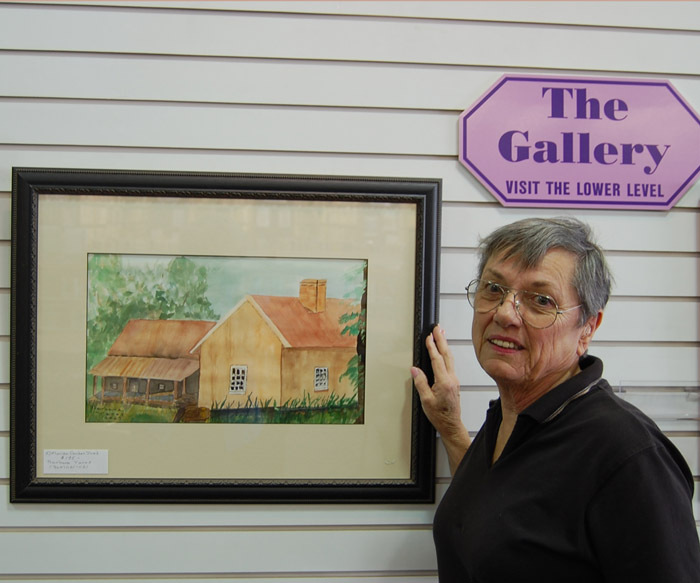 Retirement allowed her to rekindle her passion for art and to pursue art classes. Necla works part-time at the Waterbury Hospital Gift Shop, volunteers at the Barnes Museum and is a full-time artist painting in her studio. Jane M. White, of Southington, will be exhibiting her watercolor and pastel paintings during the month of July. Visit the Mezzanine during the month of July to view the exhibit and learn about Kyrgyzstan. 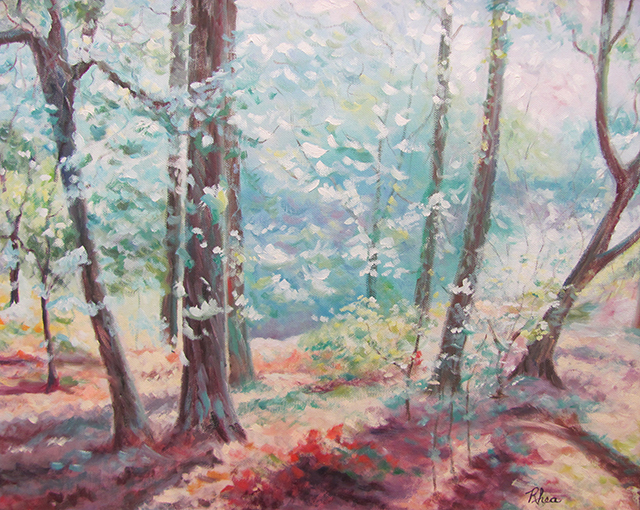 Maria Colacrai started working with pastels at Artsplace in Cheshire under the instruction of Mally DeSomma, fine artist. Maria uses photos from her various trips in the United States and other countries. 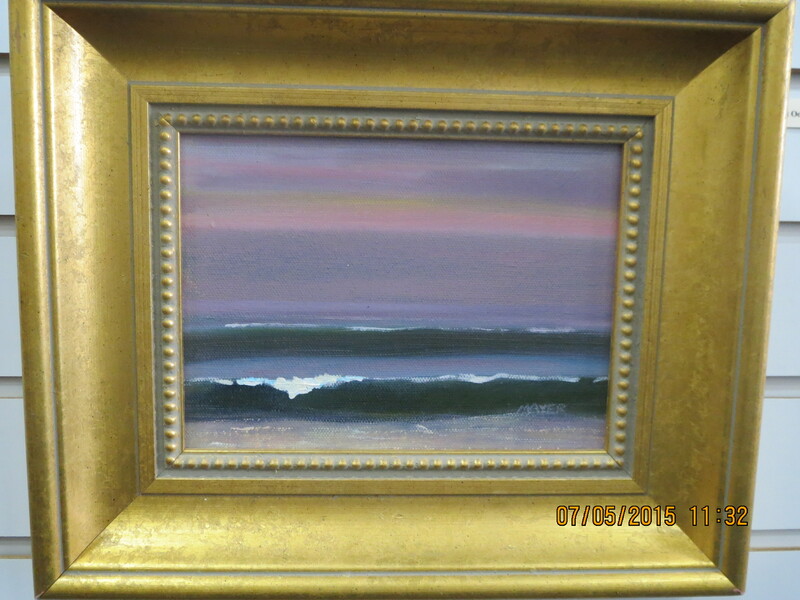 She likes to paint landscapes, seascapes and sunset scenes. 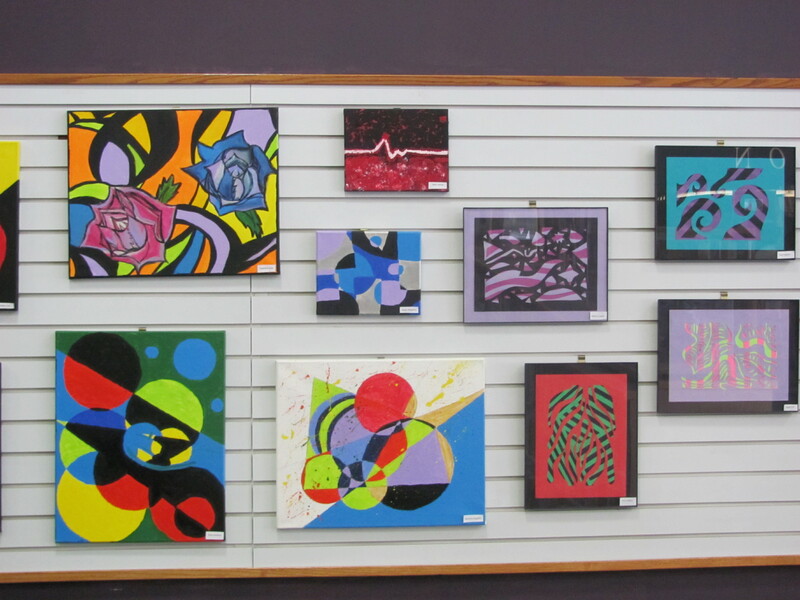 Maria has shown her artwork in several art shows in the Cheshire area. Scott Colacrai began painting in 2006 at the Artsplace in Cheshire. He works under the tutelage of Mally DeSomma, fine artist. Scott creates his works in pastels. His paintings feature wildlife, with a focus on native birds and domestic and wild animals. 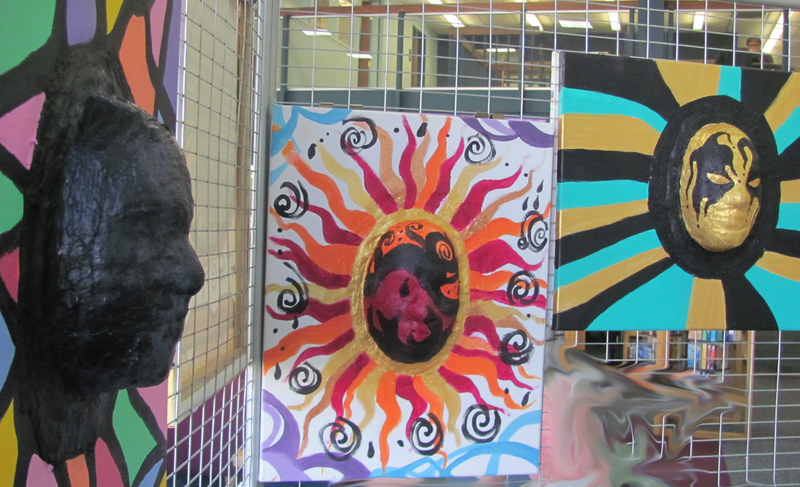 Scott has received several awards in Cheshire area art shows and enjoys sharing his works with the community. 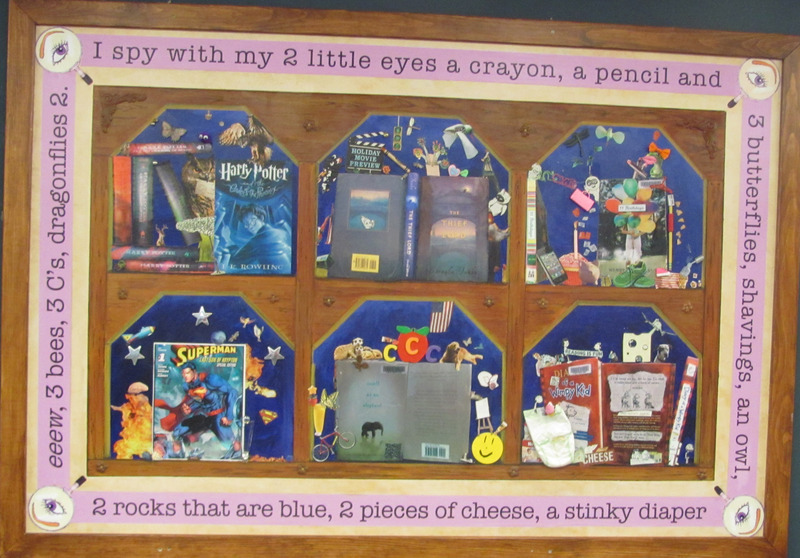 Starr’s show, “Photo Prose – Naturally,” brings her two favorite hobbies together into an Ekphrastic Poetry Display. 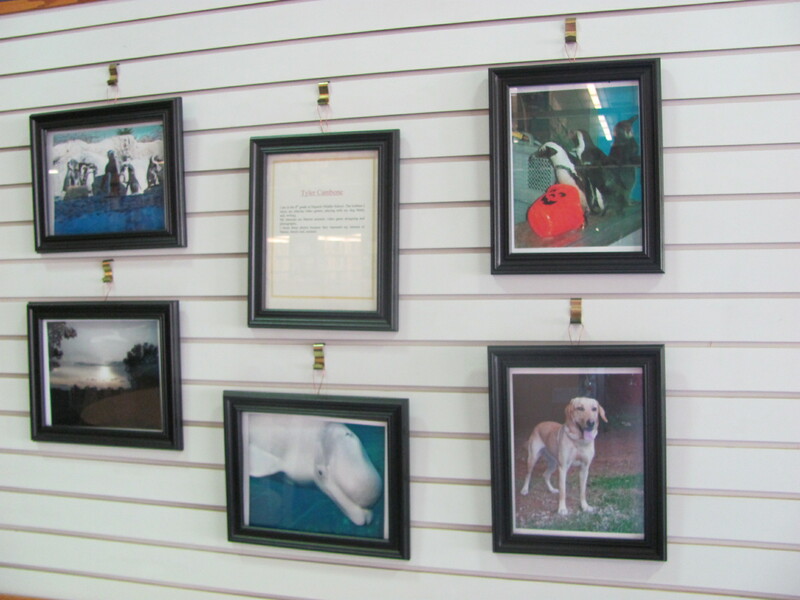 Each framed photograph is covered with a printout of a poem that describes the image it represents. The show is meant to begin the creative process and invoke images to the reader that are very different than that in the photograph. Starr invites you to read, relax, and imagine. Do you see what she sees? Joanne Cyr has been painting since she was a teenager. She finds much of her inspiration from the natural world and enjoys painting animals, people, and flowers. Joanne has studied under some wonderful teachers at Southington High School, Tunxis Community College and Paier College of Art. These inspirational instructors include: Ralph Grimaldi Jr., the late LeAnder Canady, Bill Thomson, John Falato and the late Sante Graziani. 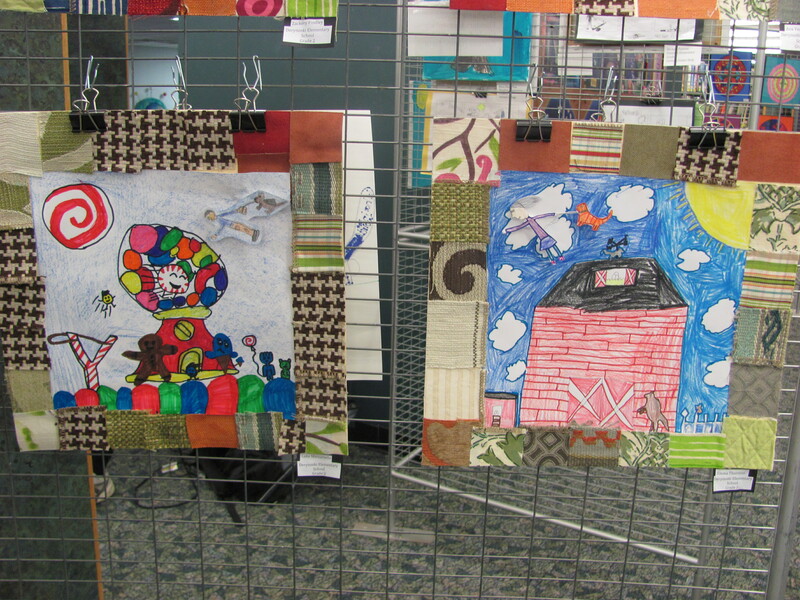 The Kelley Elementary School after school club presents, Art for a Cause. The Come Fly with Us give back project will donate all funds to Heifer International. 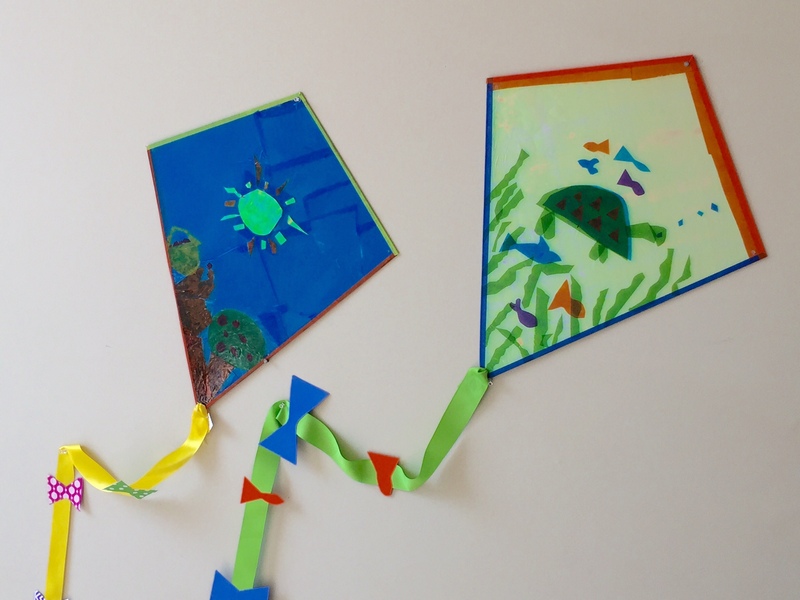 The Southington Library Cafe windows are decorated with bright and cheerful hand-made kites . 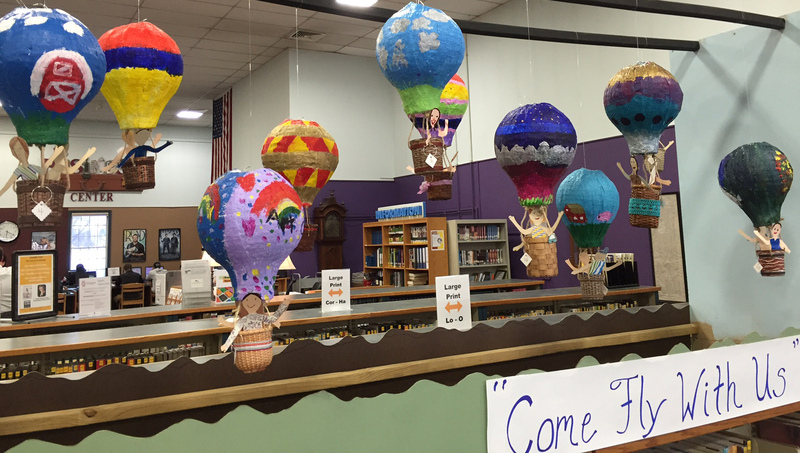 Paper balloons decorate the inside. All items are available by bid. At the Southington Library we are highlighting young people who have taken part in the Chidlren’s Departments Pixels & Pencils workshops. 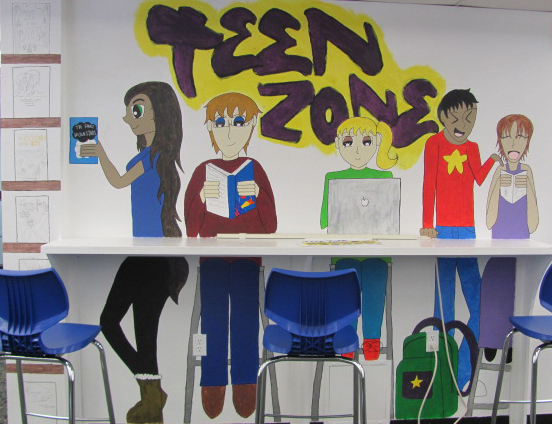 In addition, in the Teen Area on the mezzanine, Southington High School senior, Jasmyne Engman has been using her artist talent to create a mural on the Teen Zone study wall. Please visit this work in progress to appreciate a local talent. 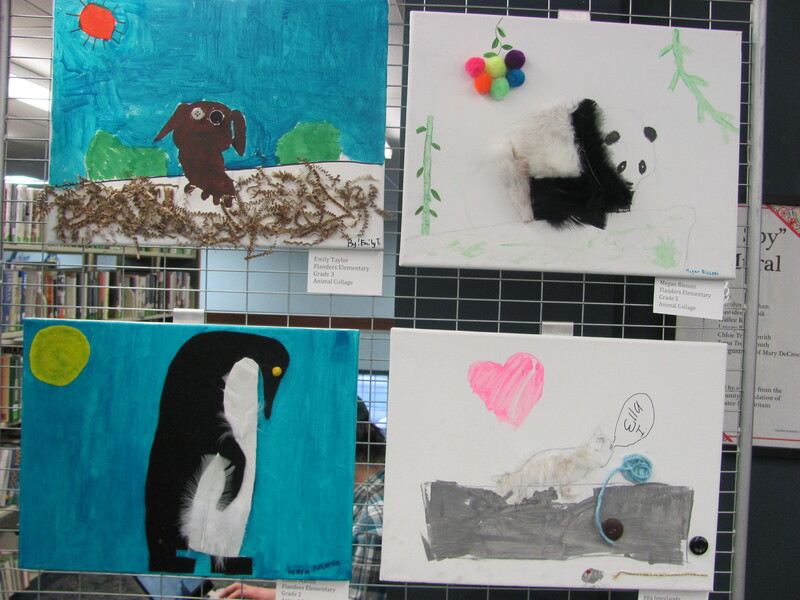 Pixels & Pencils is a monthly art workshop for kids aged 7 to 10 offered at the Southington Library. Participants are presented with an artistic inspiration and create unique masterpieces using both traditional and technological supplies and methods. Children’s Librarian Lynn Pawloski leads the workshops. In December’s class, the children learned about NASA astronaut and photographer Donald Pettit who has captured iconic images, including star trails, auroras, and city lights, from aboard the International Space Station. Children imagined new planets awaiting discovery and created the interstellar surfaces with shaving cream, tempera and glow-in-the-dark paints, paper plates and Styrofoam balls. They then used the library’s digital cameras to photograph their designs as if they, too, were soaring 220 miles above Earth, orbiting our planet at a speed of five miles per second. 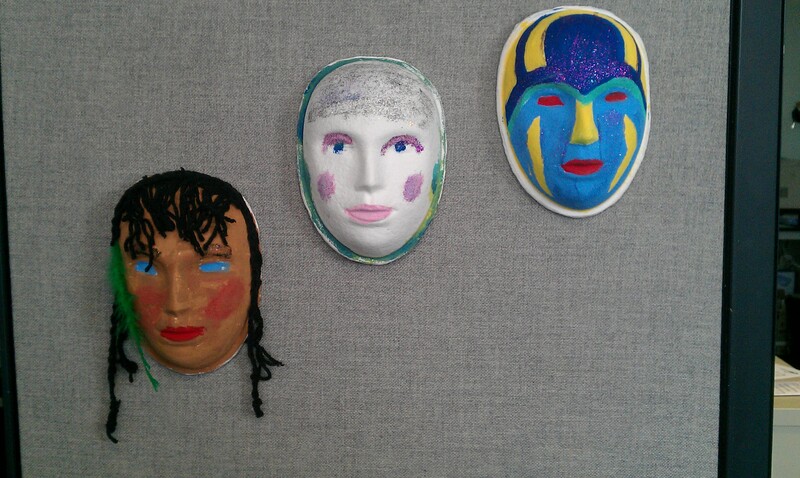 In January’s session, the kids viewed and discussed artist self-portraits created from a variety of mediums. The selection of artists included Chuck Close, Gustave Courbet, and Martin Debenham. 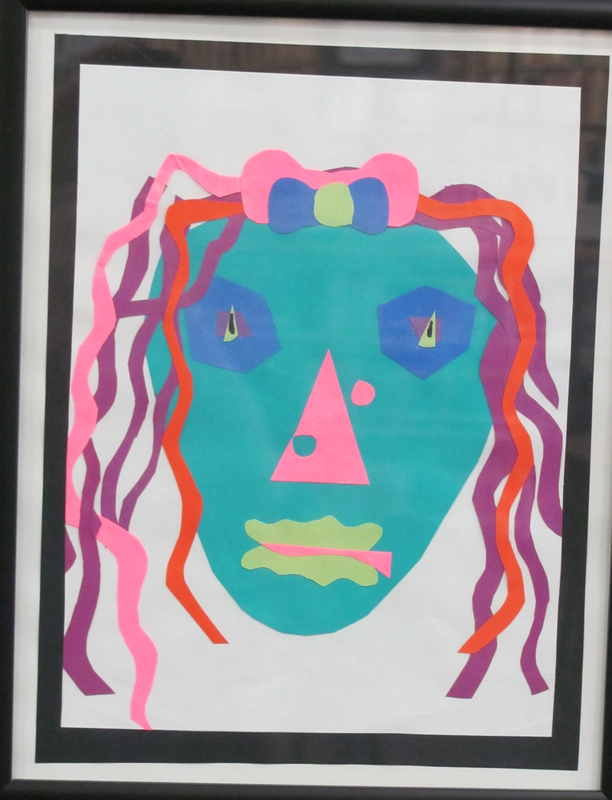 The children then made their own self-portraits using the mediums of their choice: clay, paints and canvas, sketching implements and paper, and the Osmo Masterpiece app on the library’s iPads. Angi Shearstone is an award-winning professional artist with an MFA in comics, a small herd of cats, strong geek tendencies and a fondness for ska-core. 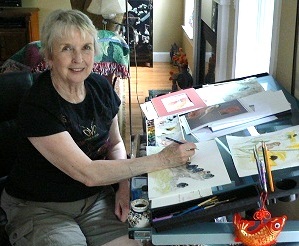 She’s worked in children’s books with Mercer Mayer, in comics on Batman: Gotham County Line with Scott Hampton, and on Princess: Tales of Girls who Rock with Jeremy Whitley, collaborated with Mur Lafferty on Beyond the Storm: Shadows of the Big Easy, and otherwise has self-published a handful of comic book projects. She paints and sells fine art, illustrates, designs, writes, and has a blog about creativity at Amazing Stories Magazine. Much of her work can be seen at http://www.angishearstone.com and http://www.shearstonecreative.com. Among Angi’s self-publishing adventures are two issues of her epic-sized fully painted comic book BloodDreams, available at ComiXology.com. Angi currently focuses much of her efforts on the novel version BloodDreams, in the belief that she can get the first story arc done in prose faster than painting the next 4 issues. If that’s not enough, Angi paints, sells art, illustrates, designs, and works with video to keep the bills paid while working on her own projects. She currently resides in New England, and is a member of the Broad Universe organization. For more information about Angi please visit http://www.AngiShearstone.com. 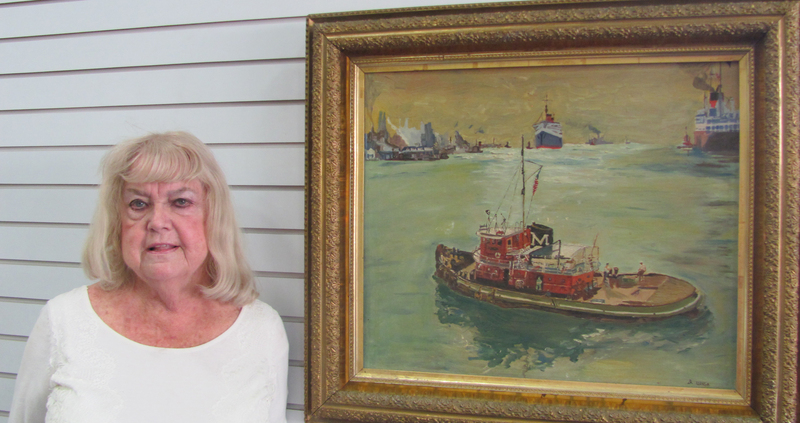 This month we are featuring the art collection of two library patrons, Arlene Fernandez and Bruce Kilburn. 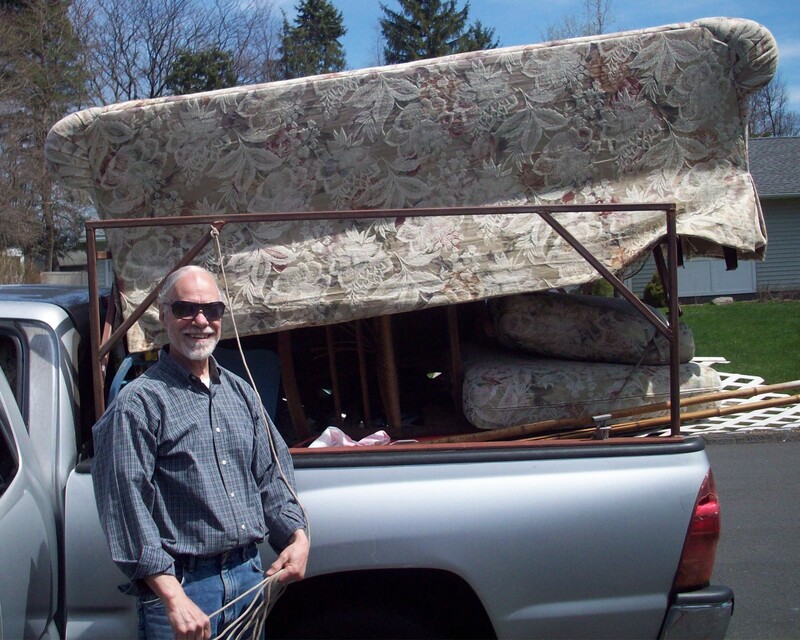 Arlene and Bruce are long-time antique collectors and you may have seen them in their grey pick-up truck trolling for treasures at local tag and estate sales, flea mark ets and auctions. 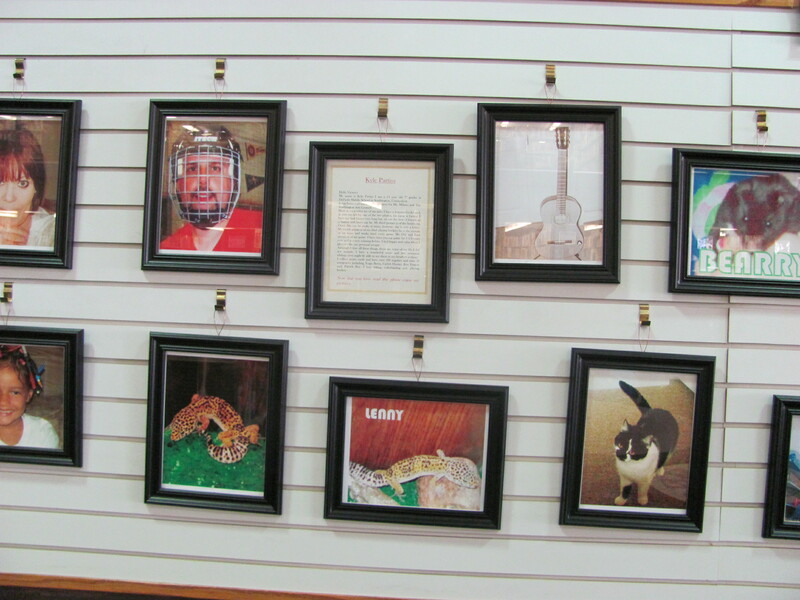 Their hobby has yielded quite a collection of art-work over the years as this eclectic display shows. Included in the exhibit are original oils and acrylics, prints of noted artists such as M.C. Escher and Modigliani, molas from Panama and an Eskimo print of penguins, Victorian ladies and American Primitives It is, in short, a visual smorgasbord. Many pieces are available to purchase Arlene and Bruce have enjoyed the Art of the F ind and hope you enjoy their discoveries. Many pieces in the collection are available to purchase. Come in to stroll the Gallery you may find something to start your own collection. Therese Horwath is a retired public school special education teacher and amateur photographer. She always enjoyed giving her photos as gifts, but she never considered selling them until a colleague suggested it. 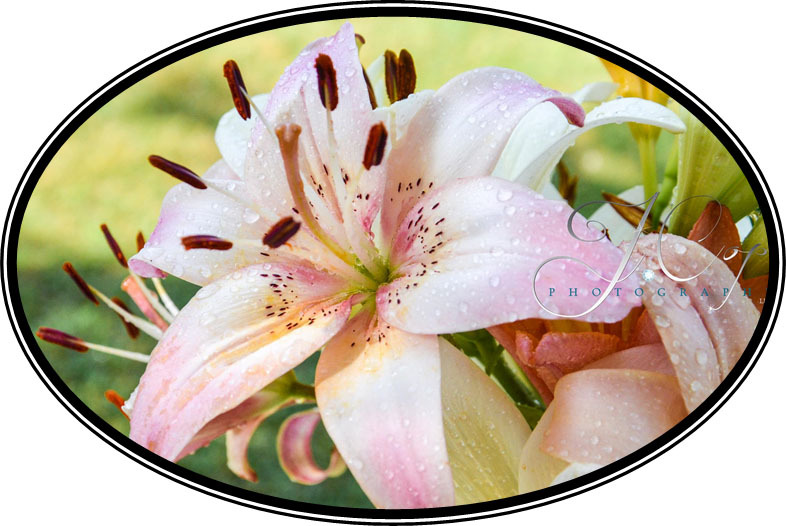 Since that time she has exhibited photographs at local fairs and craft shows with the help of her brother Don Sega of Plantsville and husband Jeff, both of whom are contributing amateur photographers, her sister-in-law Lisa, an d of various supportive friends over the years. Their collection of photographs includes lighthouses, sunsets, flowers and palm trees, wildlife, vineyards and wineries, shoreline sights, covered bridges, winter and fall scenery, local towns’ points of interest and attractions from cities and states they have v isited. For them, it is an amazing feeling to know that people want their photographs to view every day in their homes whether it be for pleasure, beauty, comfort, or inspiration. 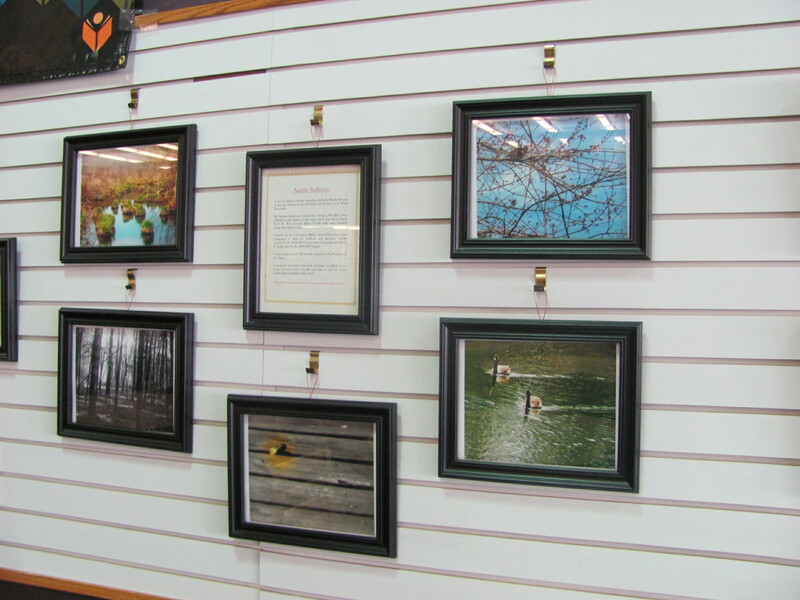 The October exhibit in The Gallery at the Library presents work by six local photographers who were involved in the winter photography workshop series offered at the library. The exhibit includes photographs by Ruxandra Iliescu, Lynda Mazur, Kathy Sokolowski, Andrew Zygmunt and Su Zygmunt. 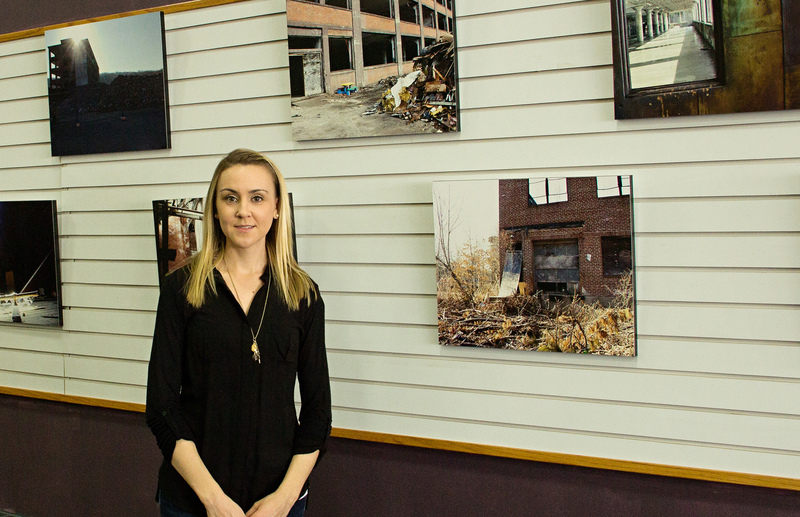 Jennifer Piccirillo, a Meriden photographer and educator who lead the workshops also has her work in the exh ibit. 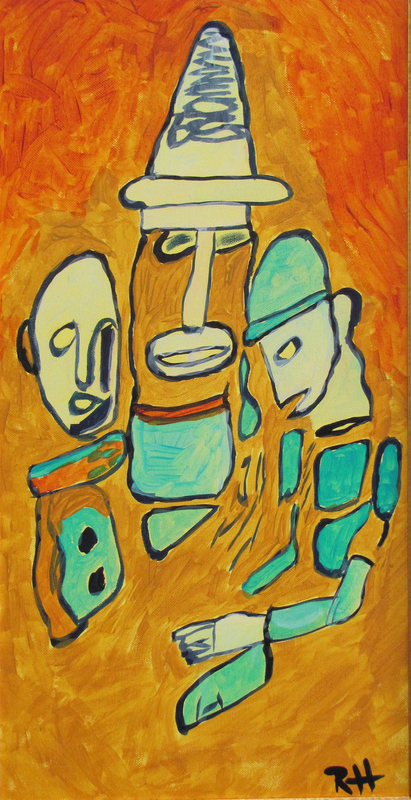 The September exhibit in The Gallery at the Southington Library features acrylic works by Bruce Zaiko. 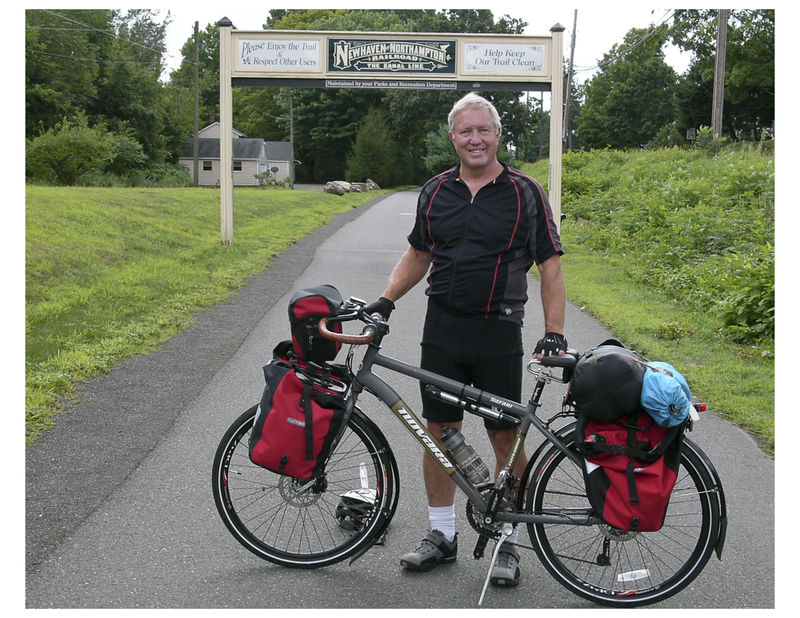 A retired carpenter born in New Britain, Bruce is now a Southington resident. 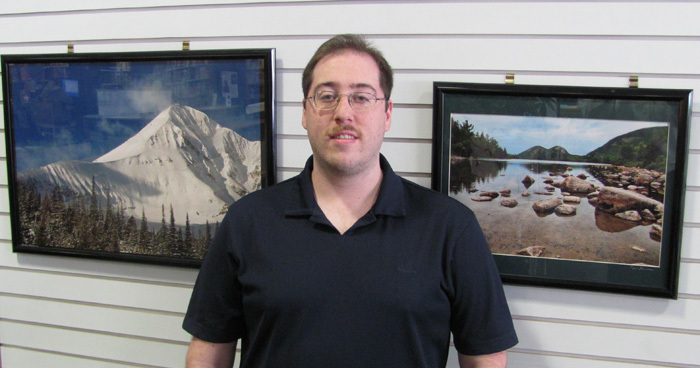 Mr. Zaiko is a self-taught artist who has been painting landscapes primarily for over ten years as a hobby. 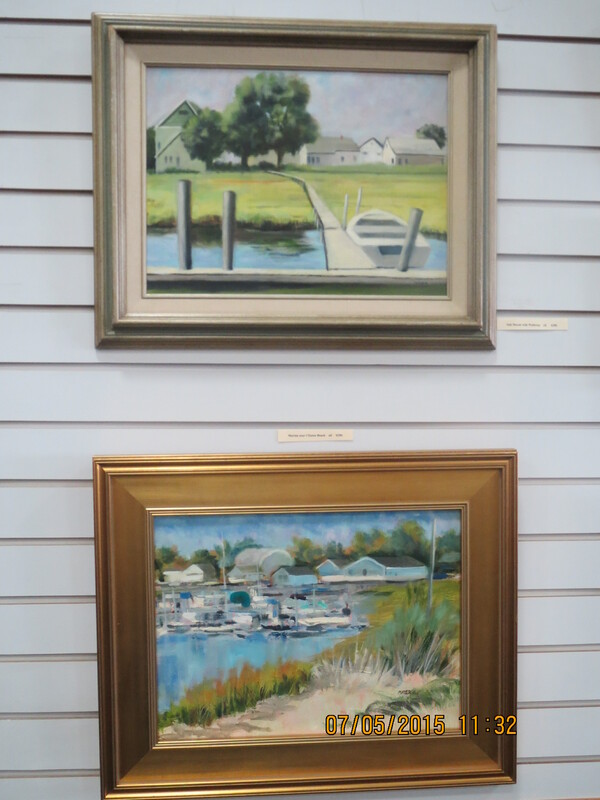 Visitors to The Gallery will recognize many of the locations depicted in Bruce’s paintings such as Hubbard Park, the Connecticut River and peaceful road side areas along our back roads. 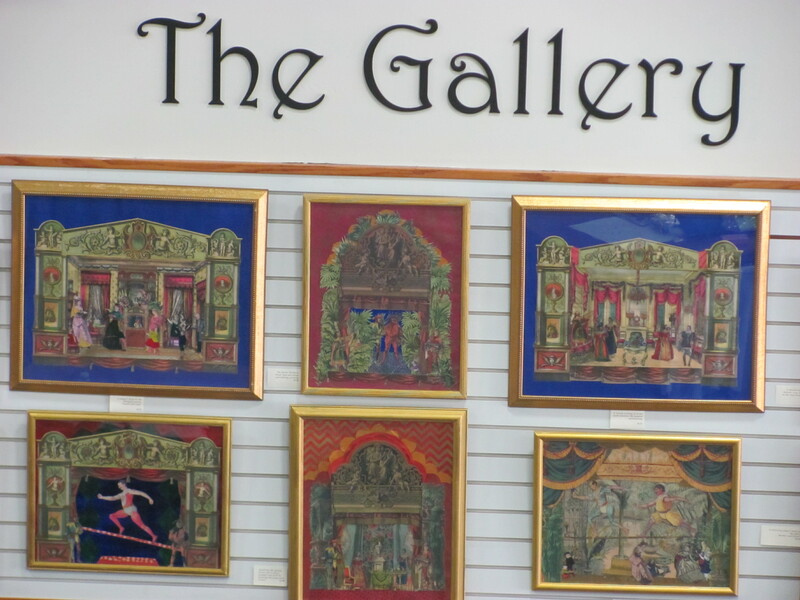 As a past collector of 19th century toy theaters Sandra Winter still has a passion for the art and craft. Ms. Winter has designed and created a version of theatrical scenes combined with a story theme to complete the illusion for her “Fantasy within Toy Theaters” exhibit. Toy theaters were a popular form of drawing room entertainment in the Victorian era. 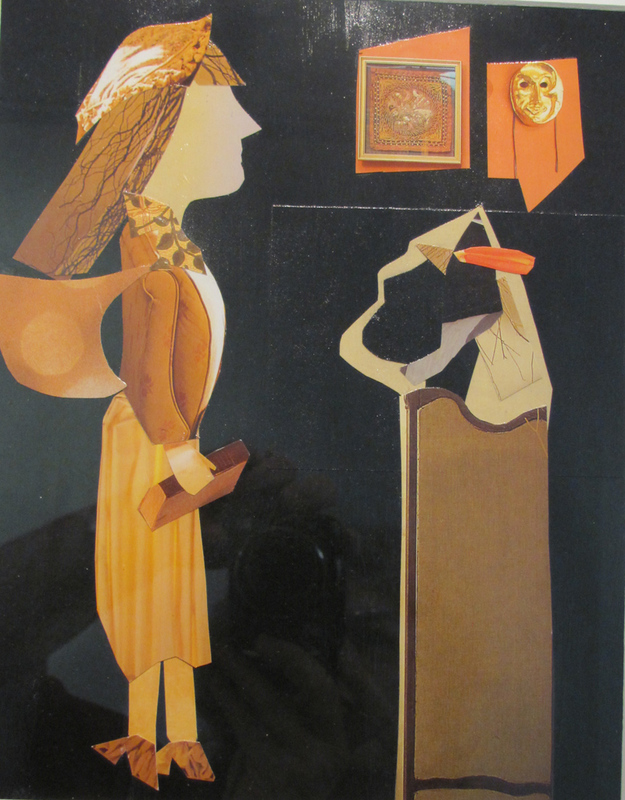 One can “cut-out” objects from a flat image as if you were making a scrap-book. This 200-year old art form was most popular in countries with fine color printing presses. 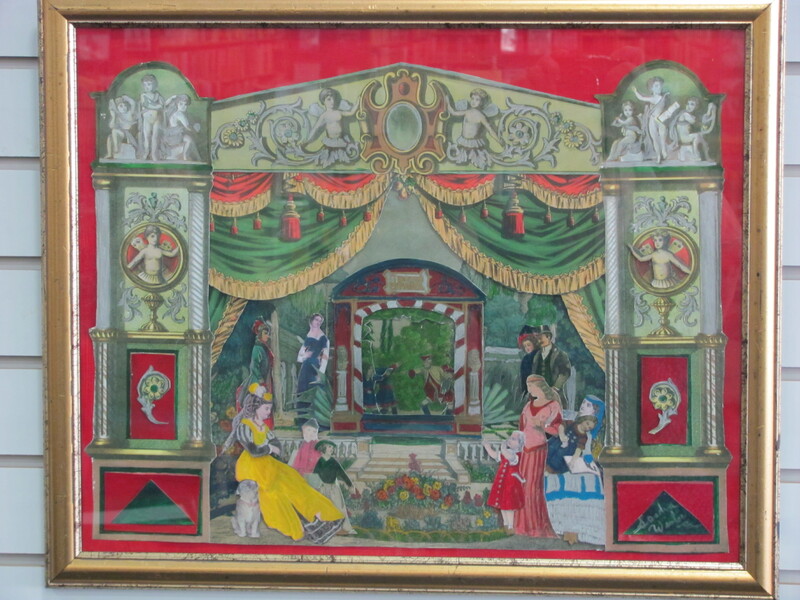 Many paper theater productions were printed to promote actual theater houses and the actual productions mounted there. This past April the Ballard Institute and Museum of Puppetry at the University of Connecticut presented a Toy Theater workshop to “create the grandest of tales with the simplest of means!” Recently re-discovered by artists, performers, and puppeteers as a brilliant means of creating do-it-yourself or professional puppet shows, Toy Theater has experienced a glorious 21st-century revival. 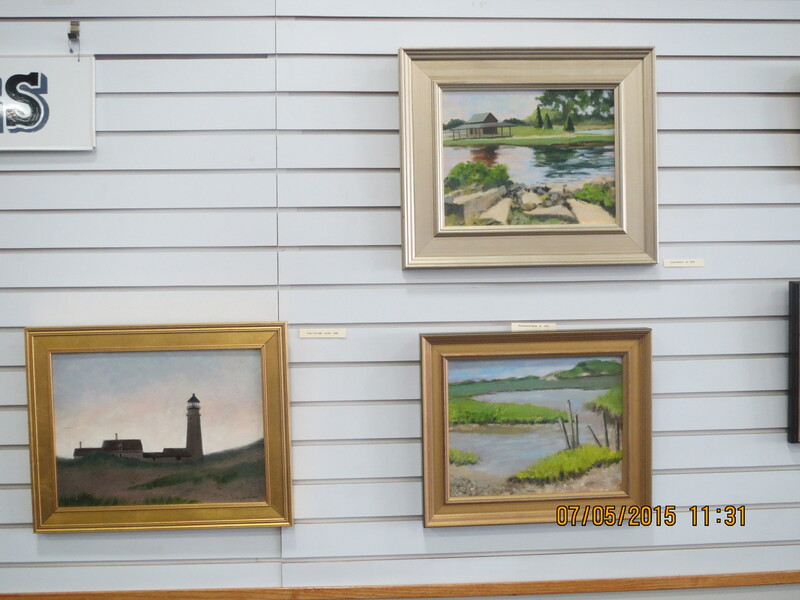 Shoreline Paintings by Thomas G. Mayer are on exhibit during May. Thomas was a former Connecticut public school art teacher for 36 years. He has taught all levels from preschool thru adult education. 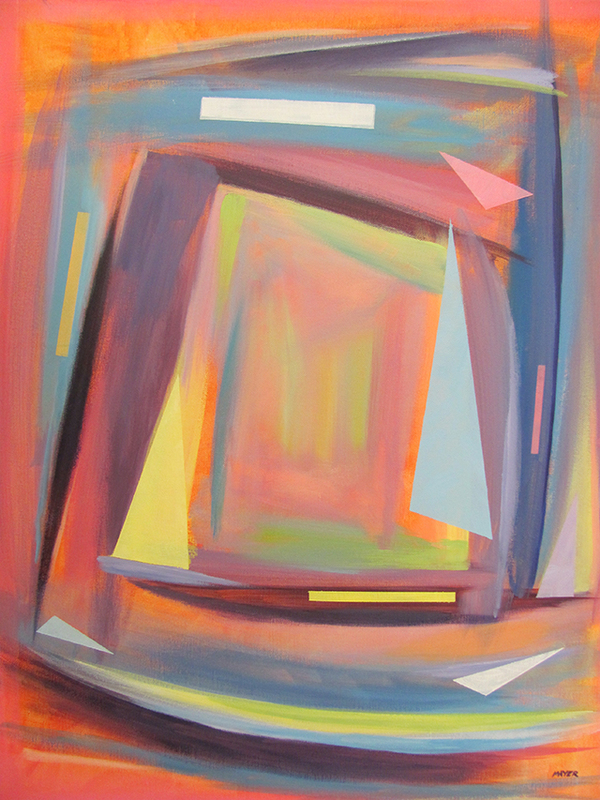 His oil and acrylic paintings express mood, feeling and emotion thru color and shapes. 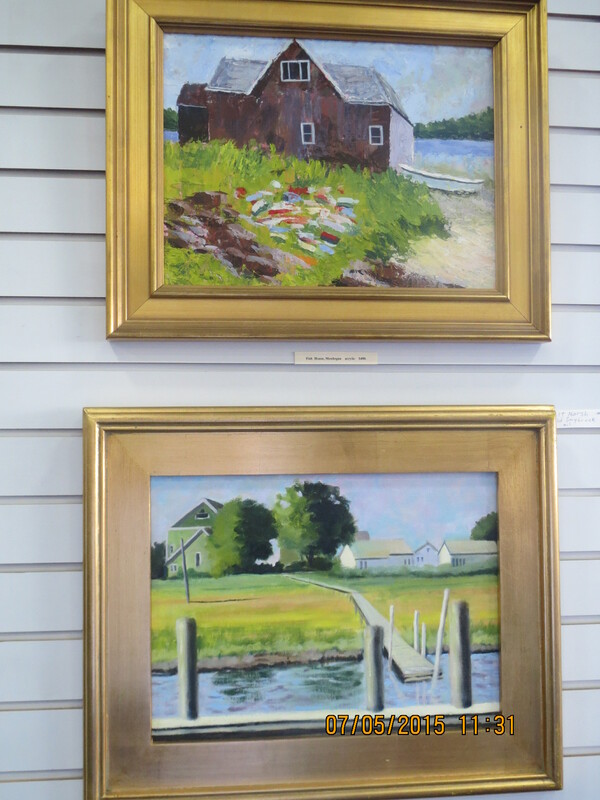 The subjects in his art come from direct observation of coastal Connecticut,New England and Florida locations. Some of his paintings are created in two or more outdoor painting sessions at the location. He enters his art into statewide exhibitions and has won many awards. 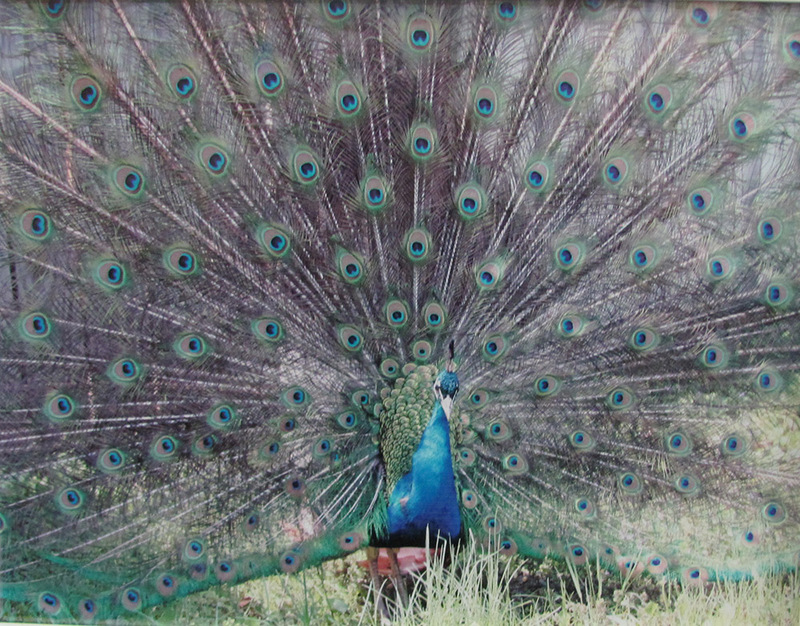 April exhibit at The Gallery is photography by Dan Purushotham. 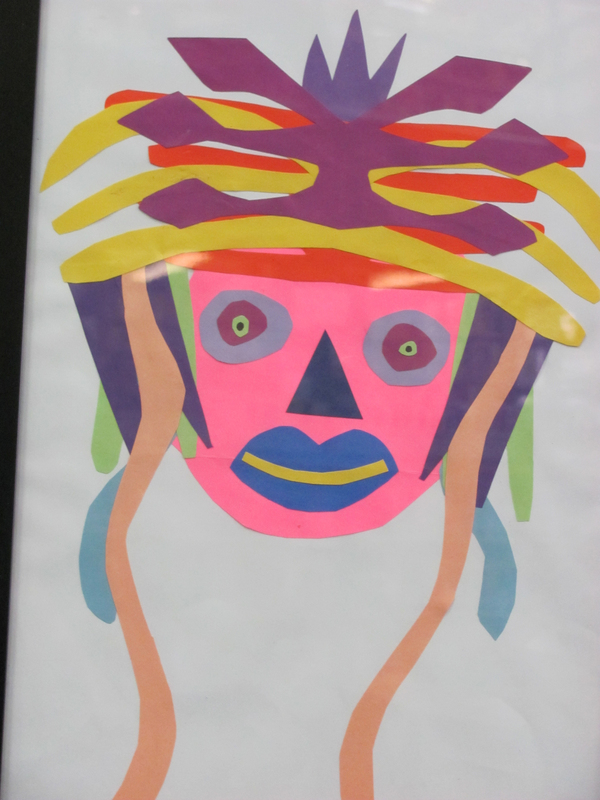 The Southington Library celebrated Youth Art Month in March. Necla Balasaygun has exhibited her oil paintings in Connecticut, receiving high praise and a second place award at the Landings Art Association exhibition. Art has been very important to Necla since an early age. She was born in Istanbul, Turkey on December 25th, 1949. After graduating technical art school she worked in the fashion industry in Istanbul. In the early 1970’s she married and began a family. 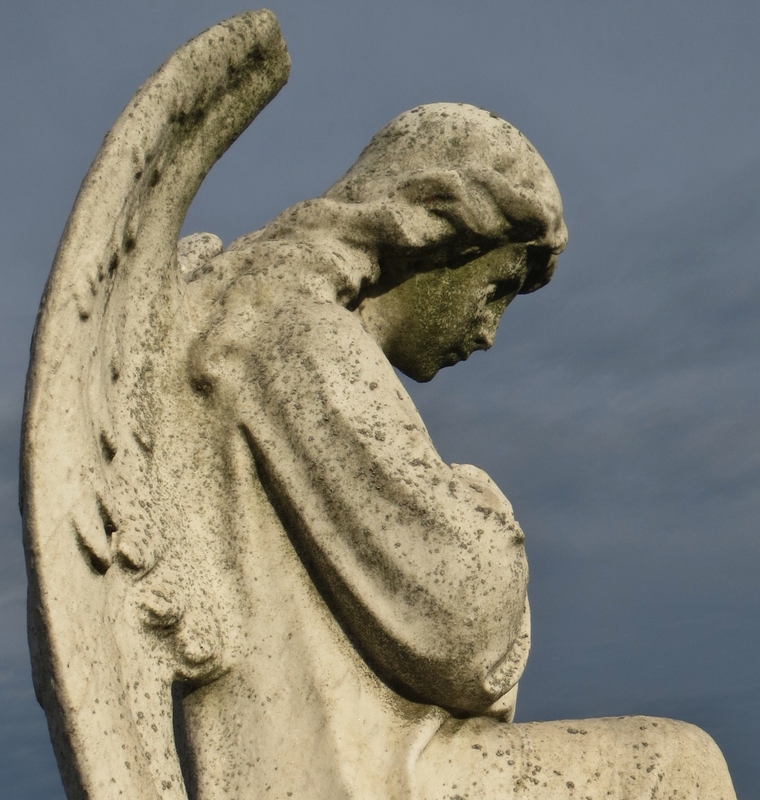 Necla decided to shift her focus to her family but art was still in her heart. Brownbag is a collective of local Southington artists that explore art in every medium we can find: landscapes, cartoons, portraits, pretty colors, and plenty of abstraction along the way. Although we’ve been exploring art forever, we started collectively promoting “Brownbag Art” online and around town in 2013. We’ve had a number of booths and displays in and around town, so you may already be familiar with us. 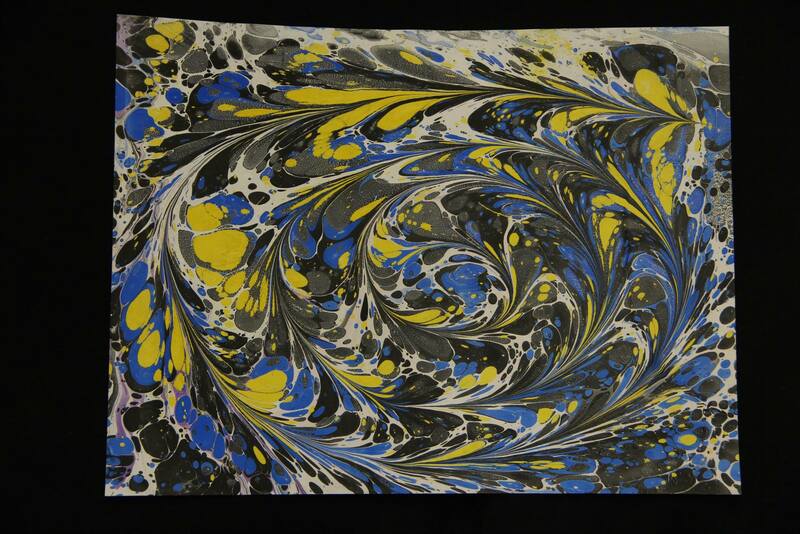 Displayed works are by 4 artists: Kevin Curtis is behind the marbling, Cody Lord paints the landscapes, Gerry Niemierowko works most with pen and ink characters, and John Sokolowski takes the photographs. 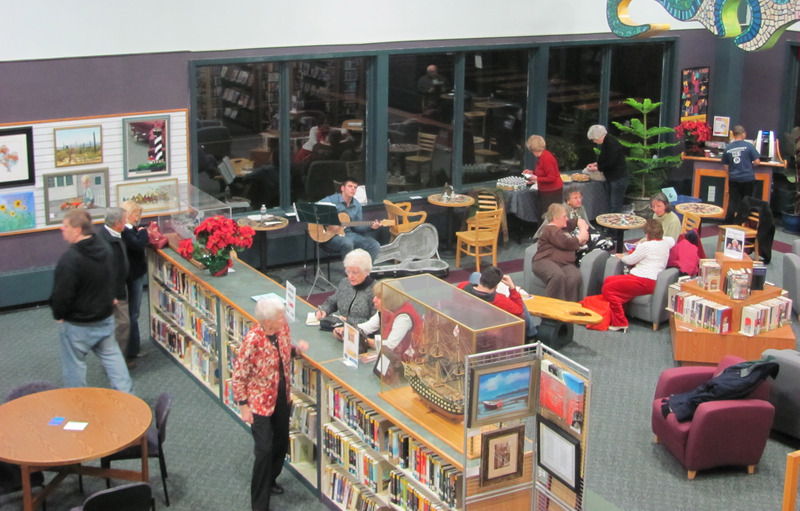 Southington Library celebrated the arts Thursday evening, December 4th in the library café. Writers, musicians, painters and photographers were recognized for their talents at the 7th Annual Celebrate the Arts reception. All in attendance enjoyed viewing more than 50 pieces of artwork while Southington High School guitarist Austin Sullivan played selections of his own music. 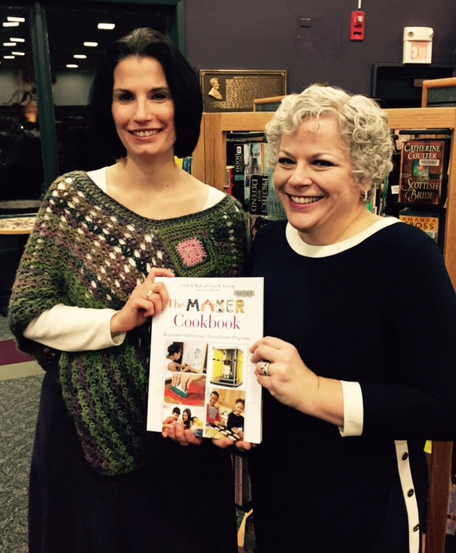 Children’s Librarians, Cindy Wall and Lynn Pawloski spoke about the writing and publishing process of their “how-to” book for librarians, The Maker Cookbook: Recipes for Children’s and ‘Tween’ Library Programs, published by Libraries unlimited. 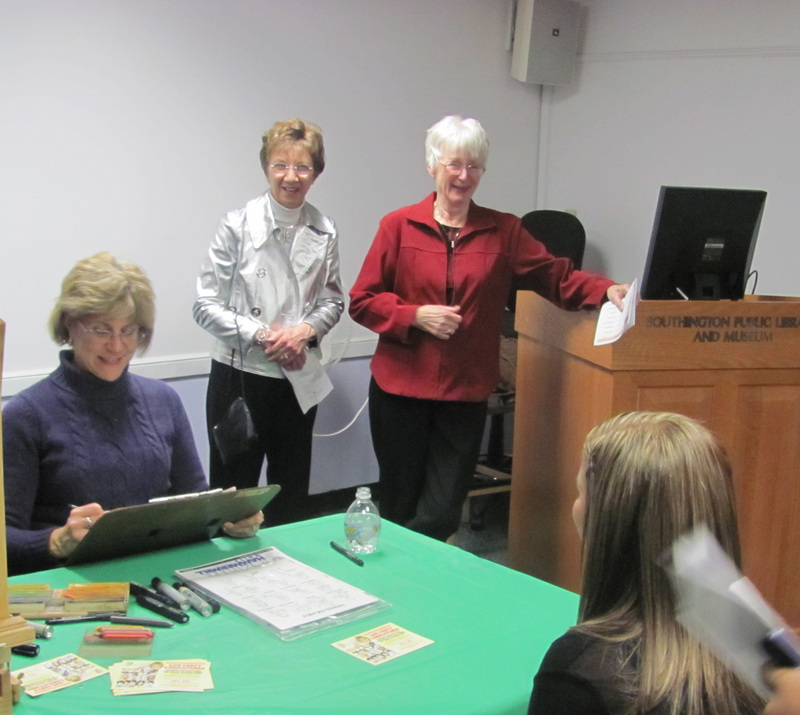 Also two local authors, Karoline Barrett and Carole Milano, presented short readings from their own published works. 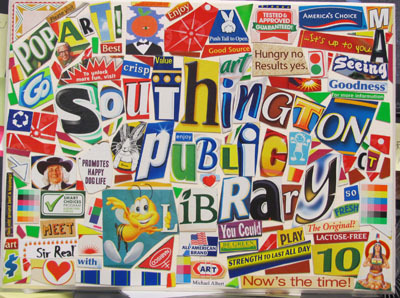 The Southington Library wants to thank our co-sponsors: The Southington Arts Council and Southington Price Chopper, ShopRite and Stop & Shop for their refreshment donations. Mr. Bobik raised in the churches of Byzantine tradition in Pennsylvania developed a love for the church and art which led him to the study of iconography. After much study of the ancient canons and writings regarding iconography, and observing iconographers at work, Bobik chose to begin the journey of writing icons himself. In art history iconography is production of religious images, called icons, in the Byzantine and Orthodox Christian tradition. Bobik’s work is done in acrylics on both canvas and wood for various projects. He has also used his woodworking skills to build icon screens, altars, service tables, and various other liturgical items for churches. 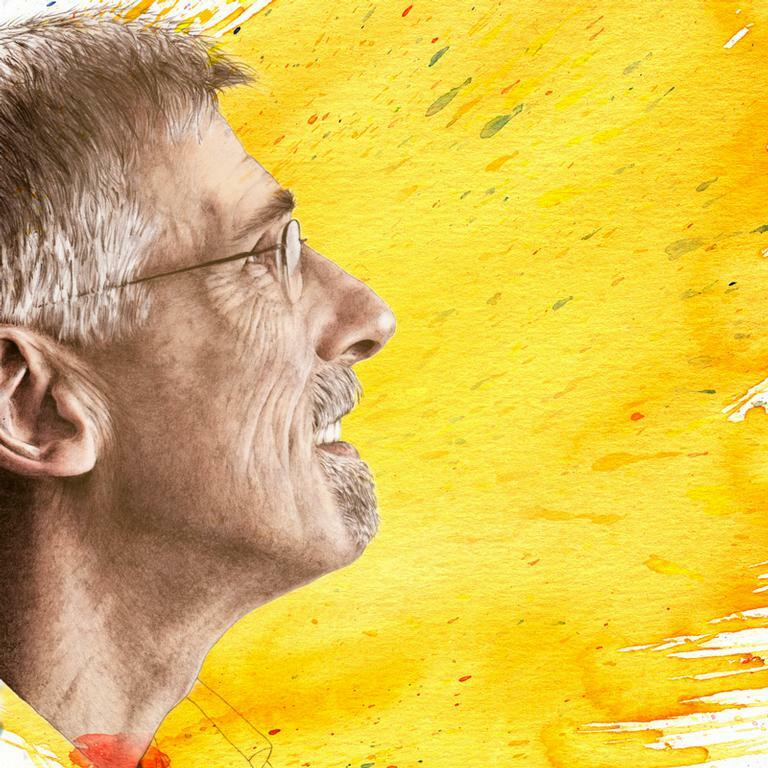 Andrew has developed a distinctive and identifiable artistic style over nearly twenty years of writing icons both for churches and individuals. 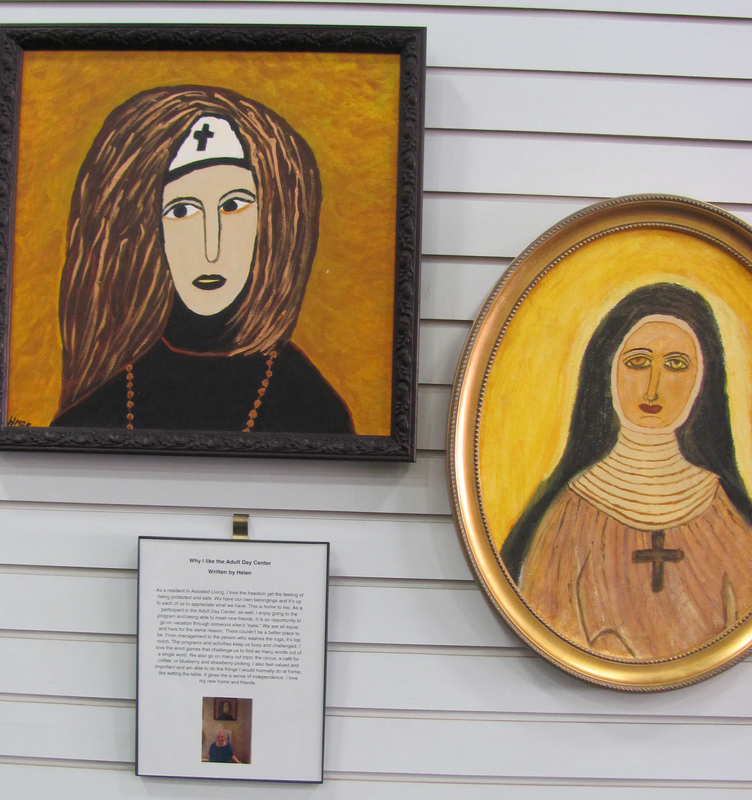 His icons are in several churches in Pennsylvania, West Virginia, Colorado, California, Arizona and Ohio as well as in several private collections throughout the country. Please visit Mr. Bobik’s website http://www.aiconsonline.com for more information . 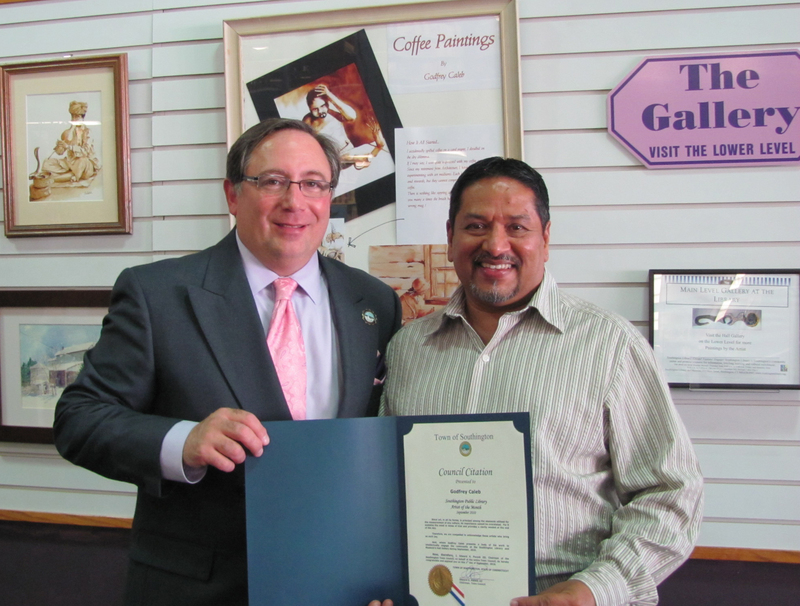 Mario Pires is a Southington resident and a practicing visual artist. His work has been on exhibit in local, regional and national galleries and competitions. The artist is currently employed as a visual arts teacher at neighboring Plainville High School, where he has been teaching for 12 years. Along with his personal works, Pires is a freelance artist, specializing in portraits, murals, landscapes, and automotive art. 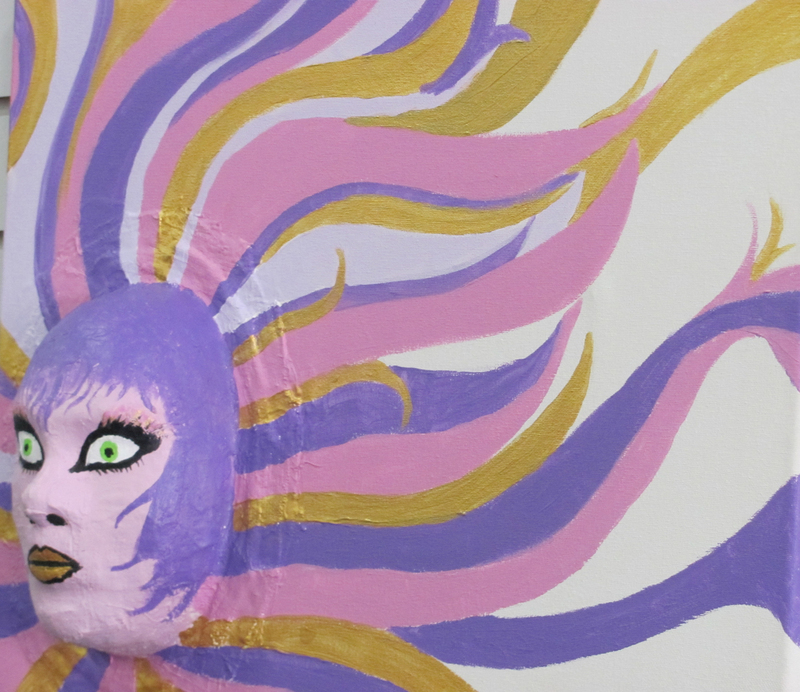 The artist recalls always having a passion for expressing himself through art. His parents learned this about Pires at the young age of 4, after finding all the walls of the closets in their home covered with drawings. In his recent works, Pires’ imagery addresses how the effects of time and memory influence everyday objects and landscapes. His watercolors and acrylic paintings look to enhance the beauty of something as commonplace as rust on an automobile, and more intimately, landscapes from Portugal, his family’s country of origin. Pires’ artistic vision primarily focuses on the study of subjects that go unnoticed, and finding the beauty in everyday occurrences. 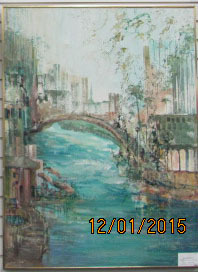 For more information about the artist, please visit http://www.mariopires.com or search “Pires Art” online. Questions or comments can also be directed to piresartist@gmail.com. Southington Library and Museum sponsored an Intergenerational Summer Photojournalism Project: See What We See – Bridging Generations through the Lens with the grant funds from The Community Foundation of Greater New Britain. Teens and GEN 55+ members of the community were invited to participate. We received support from the Calendar House (Southington’s Senior Center) and STEPS (Southington’s Town-wide Effort to Promote Success a teen initiative). Record-Journal photojournalist, Farrah Duffany and Meriden photographer Jennifer Piccirillo presented photojournalism, cut lines and photo composition workshops to the Southington teams. The library was successful in creating 10 teams. Several teams were composed of family members; the remaining teams were randomly matched. 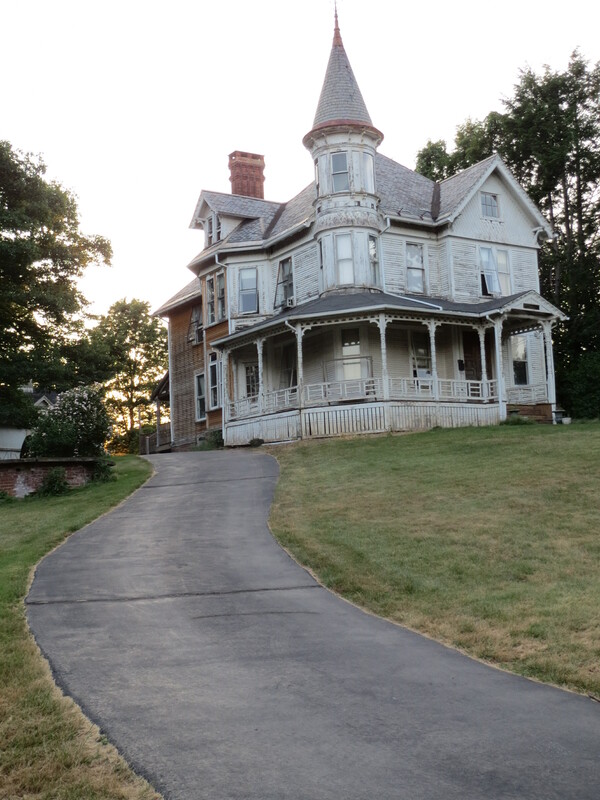 Each team was given the assignment to work collaboratively taking photographs of Southington architecture and to write a brief description of their chosen subject. The teams were recognized at a reception at the New Britain Museum of American Art where their work was on display. In addition the photos were on exhibit at The Gallery at the Library. The photographers received a certificate from the library director at a public reception in the Library Café. “My first camera was a blue Mickey Mouse film camera with the attachable one-shot flash bulbs. I think they came in sets of five that attached to the top of the camera. I just loved the process of developing film, the chemicals, the patience, and the process of creating each image individually. 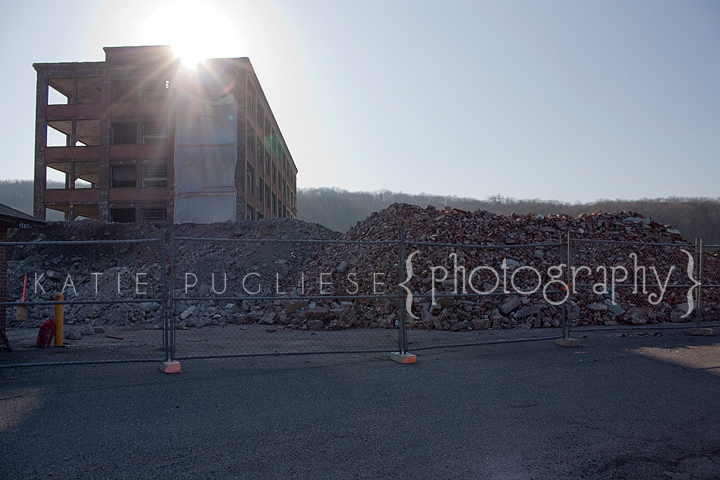 Photography today is so much faster… some people do not have an appreciation for where photography came from. Up until about two years ago, I was just shooting for fun. We do it all. I really enjoy capturing meaningful images for clients that perfectly depict special moments and will be cherished forever,” says Jonathan. Agnes Wong, Renald Fecteau, Zofia Soto, Phyllis R. Bailey, a.k.a. Abbe Wade and Barbara Scott. Two years ago a group of artist friends were together discussing their future in art. Each of them tried to promote their work by entering many art exhibits around the state. 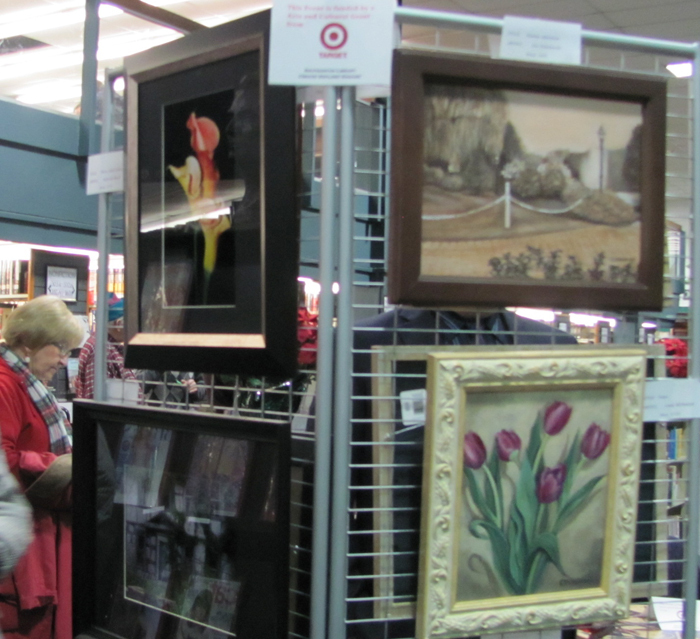 Most of them are juried exhibits, and all of the artists have won awards for their work. Several of them have had their own solo exhibits, but that requires the artist to have a supply of paintings on hand to fill the space. So in discussing these issues, the idea came about to join forces and exhibit as a group, thus “The Farmington River Artist” was born. There are currently five artists that make up their group. 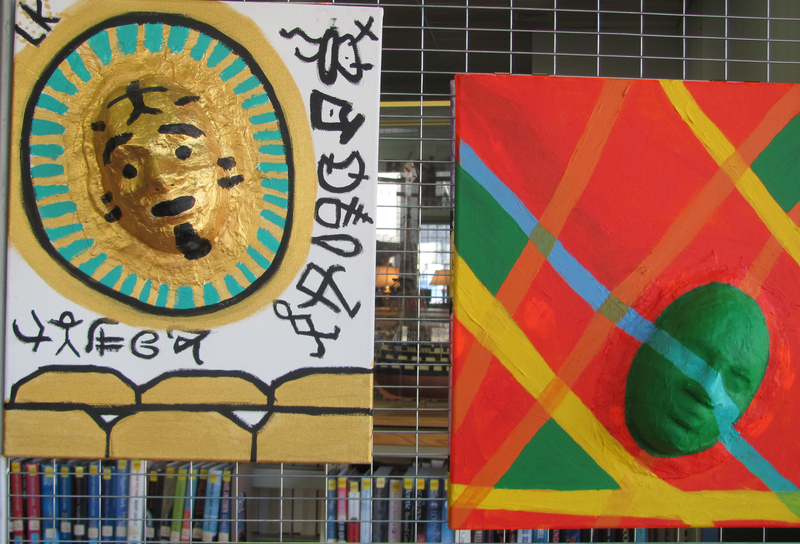 They each come from different backgrounds with their art but share some mutual feeling about why they paint. 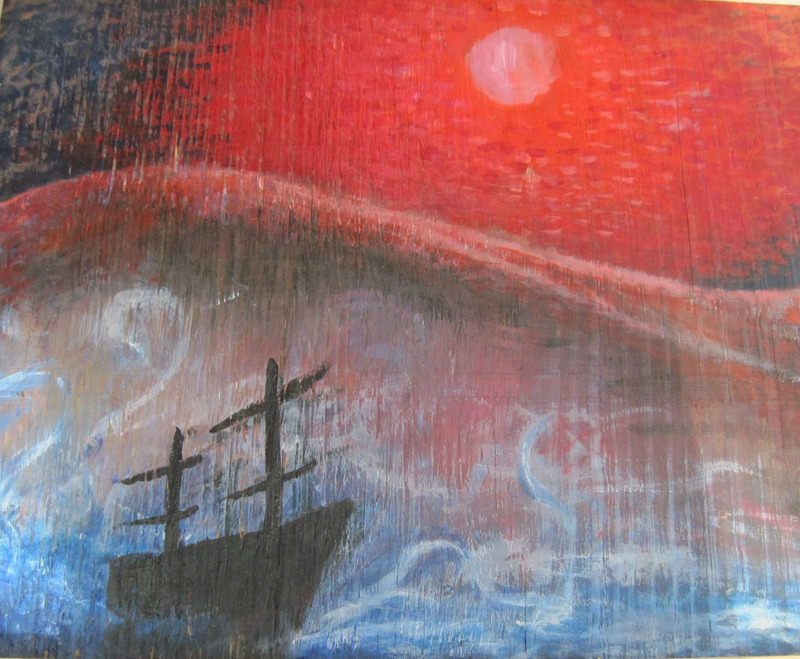 Renald Fecteau finds painting as a way to relieve stress while enjoying the results. He looks for subject matter that gives him a sense of relaxation or a smile. Ray likes to work from photos that his daughter and he take on their travels. Oils and acrylics are his favorite media and water seems to be a recurring theme in most of his paintings. Agnes Wong, born in Hong Kong says she considers herself a realistic artist. Mother Nature has provided us the most beautiful colors in the world, from rainbow to opaque white. How brilliant! She likes to use all types of media and paint all kinds of subjects. She always challenges herself to go to a new dimension. To her, the sky is the limit. Cathy Michanczyk, of Plantsville, CT, is presenting her collection of oil and acrylic paintings in a show entitled “Painting with the Seasons” in the main library at Southington Library and Museum. The show runs from May 1 through May 31. Each season’s distinguishable element is reflected onto canvas—flowers, water, foliage, and snow. 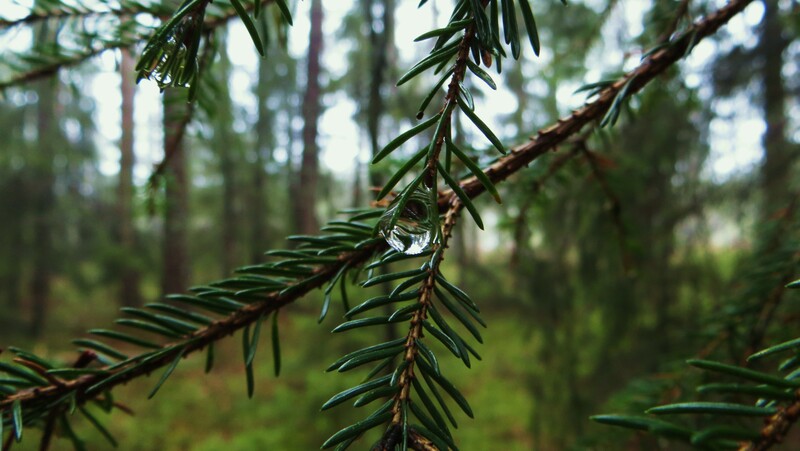 She uses her own photos to capture nature’s truth. Past exhibits have been held in local galleries, libraries, hospitals, nursing homes, restaurants, banks, and gift shops. 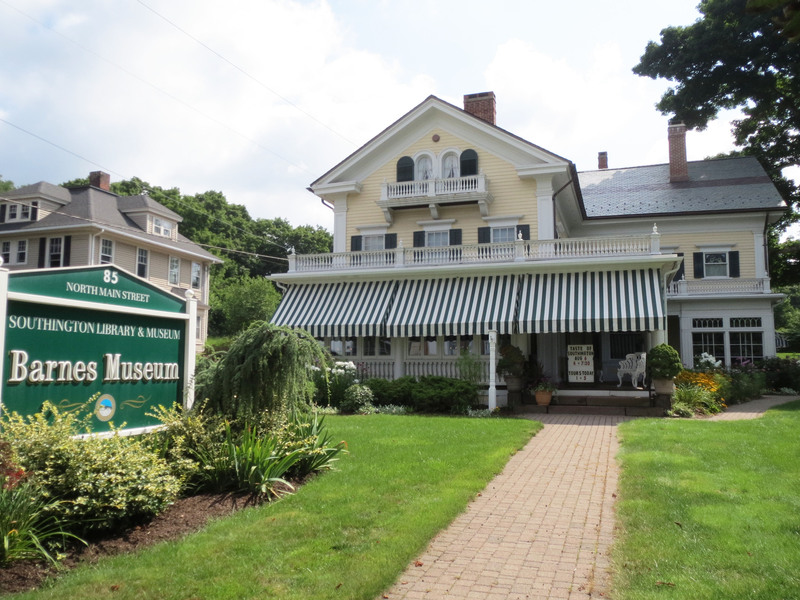 Donations to permanent collections have been made to Southington Community Services and the Southington Historical Society. 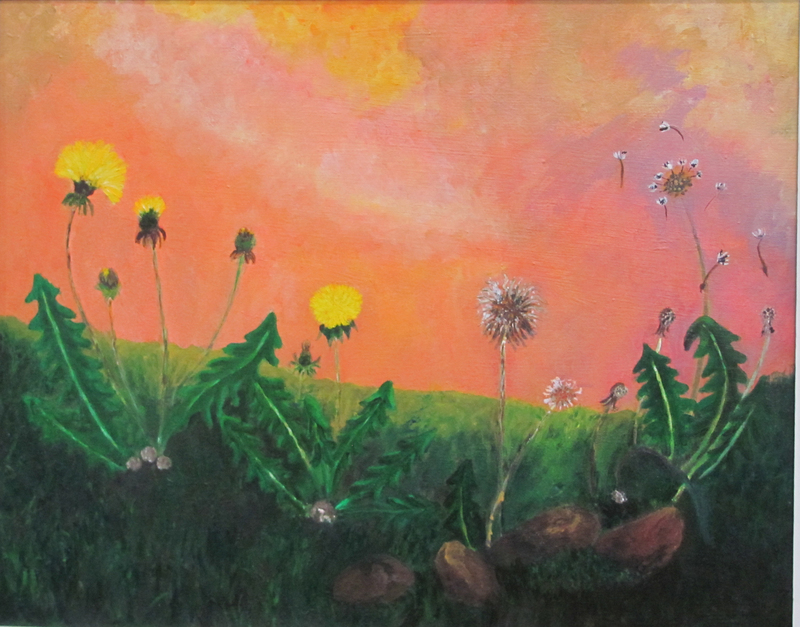 Cathy has studied illustration and painting at Tunxis Community College and with local artists. She has had solo shows at the Southington Library and The Spear Gallery at Stanley-Whitman House. 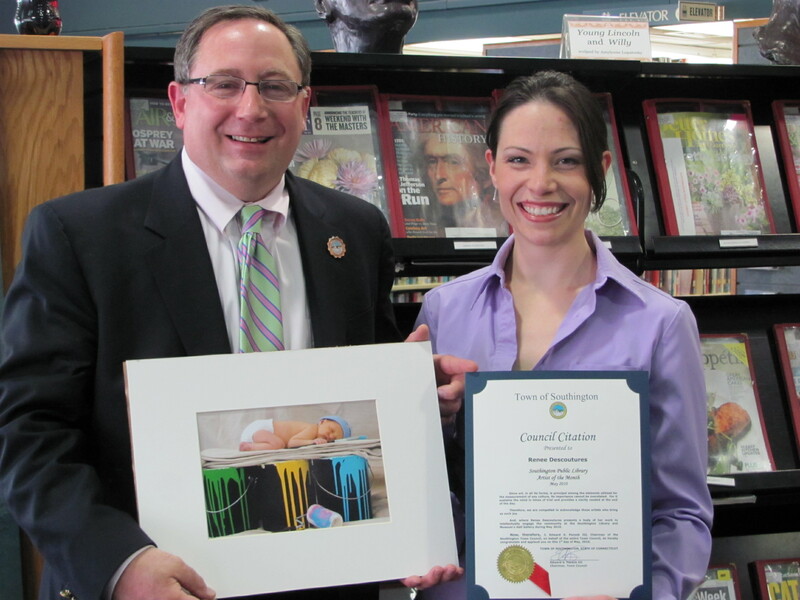 Southington Library introduces, Katie Pugliese, April Artist of the Month. 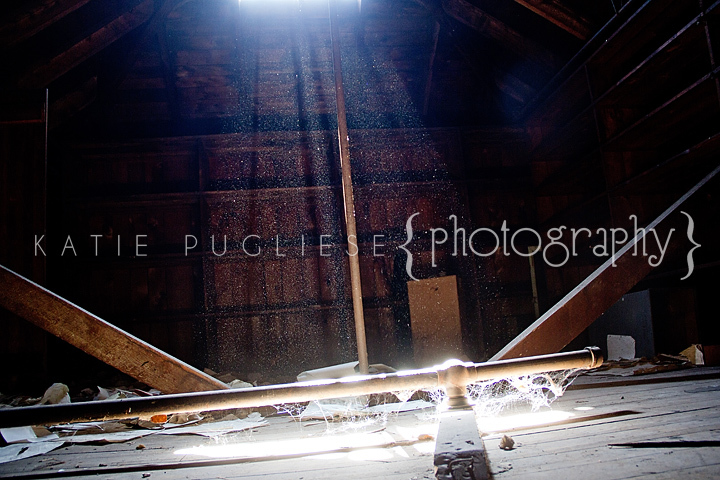 Katie Pugliese is a Southington based photographer specializing in portraits, lifestyle and fine art. 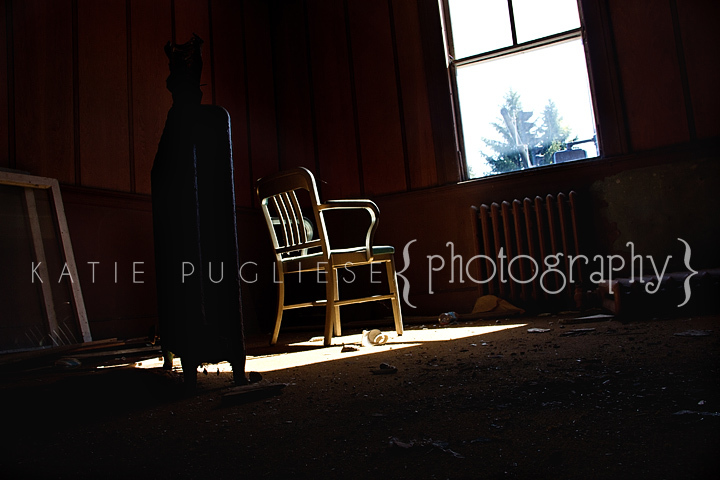 “Industrial Shadows” developed out of Katie’s interest in abandoned properties, most notably former manufacturing facilities. What intrigues her about these properties is not only their sheer size and layout, but their history and the impact they had on the local, state and even national economies. 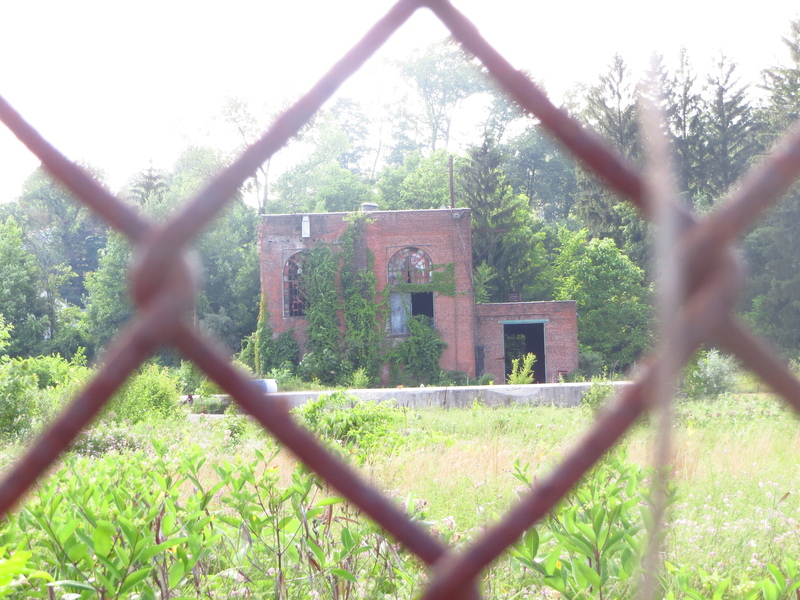 These photographs of former Waterbury, Naugatuck and Southington factories attempt to provide the viewer with a sense of just how incredible these structures were. Katie Pugliese lives in the Plantsville section of Southington with her husband, Jeff, and their son, Evan. 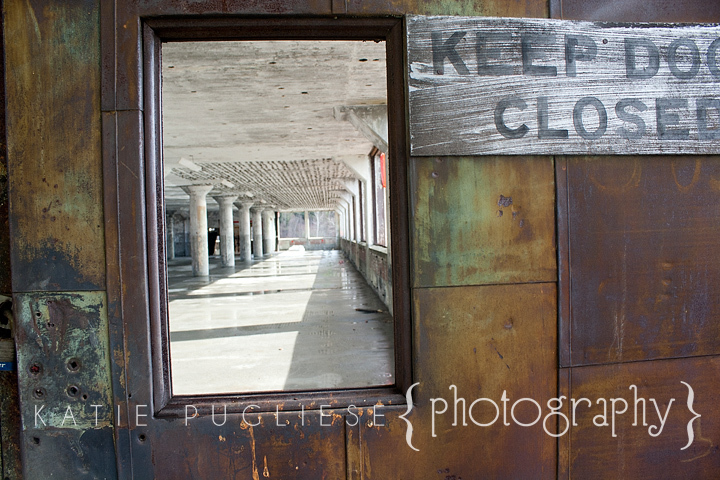 She is the owner of Katie Pugliese Photography, LLC which specializes in child and family photography, http://www.katiepugliesephotography.com. 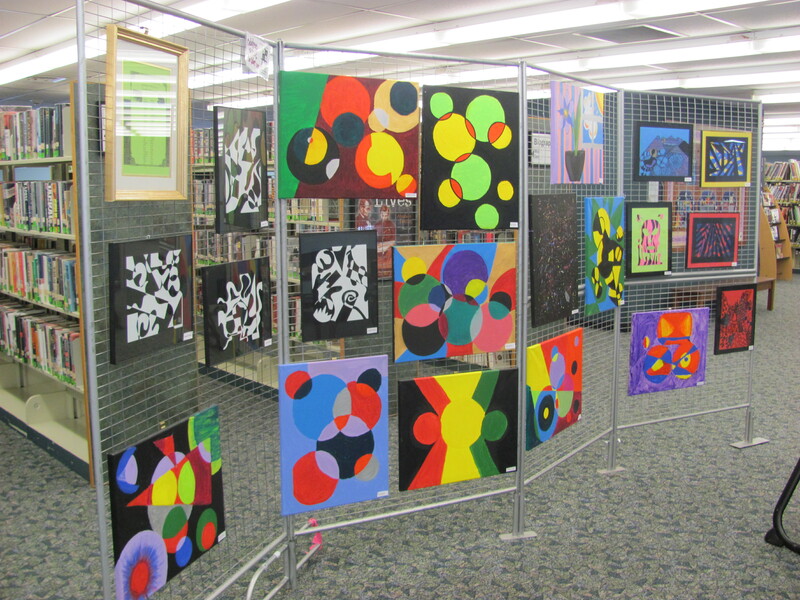 Southington Library Celebrates “Youth Art Month” March 2014 by hosting an exhibit by the Southington High School Alta Students. The Students and Staff of Alta invite the community to a reception Thursday March 6th at 6:30 p.m. in the lower level program room. 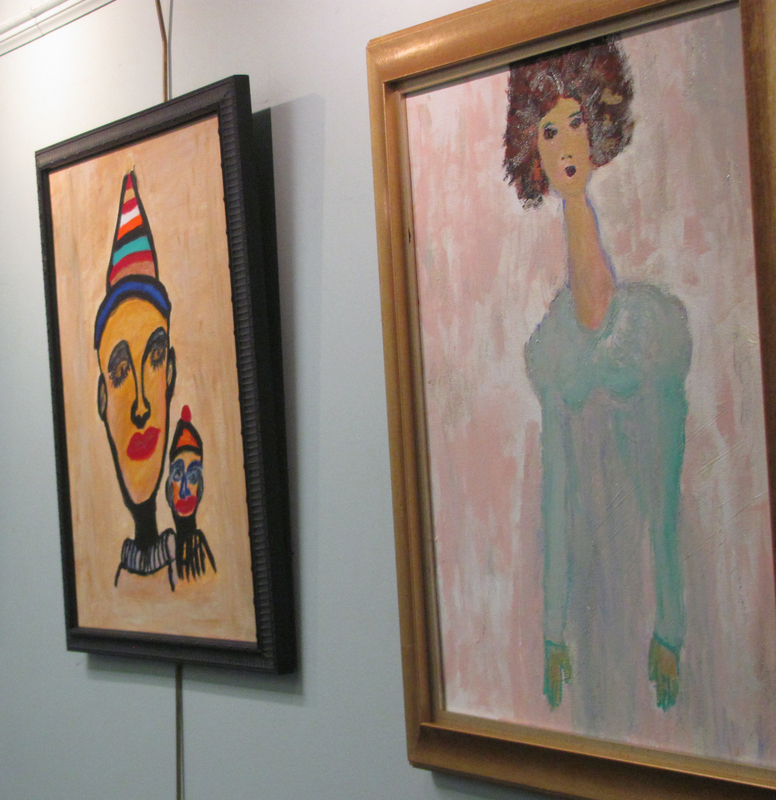 Visit the Gallery on the main level and mezzanine to view the colorful works. Art teacher Luciana Florio agrees it is important to emphasize the value of art education for all youth and to encourage support for quality school art programs. 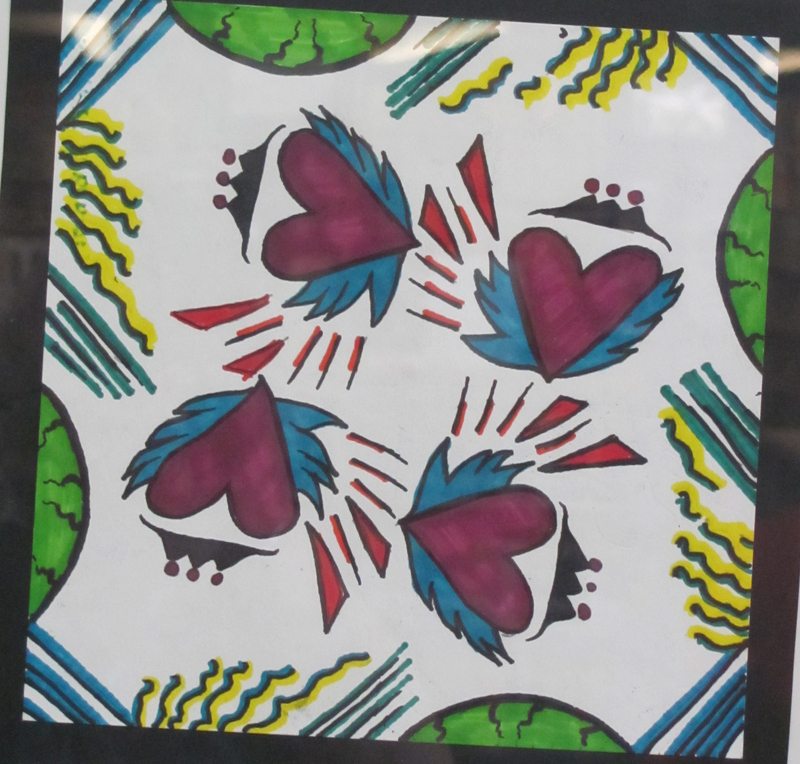 “Youth Art Month provides a forum for acknowledging skills that are fostered through experience in the visual arts that are not possible in other subjects offered in the curriculum. 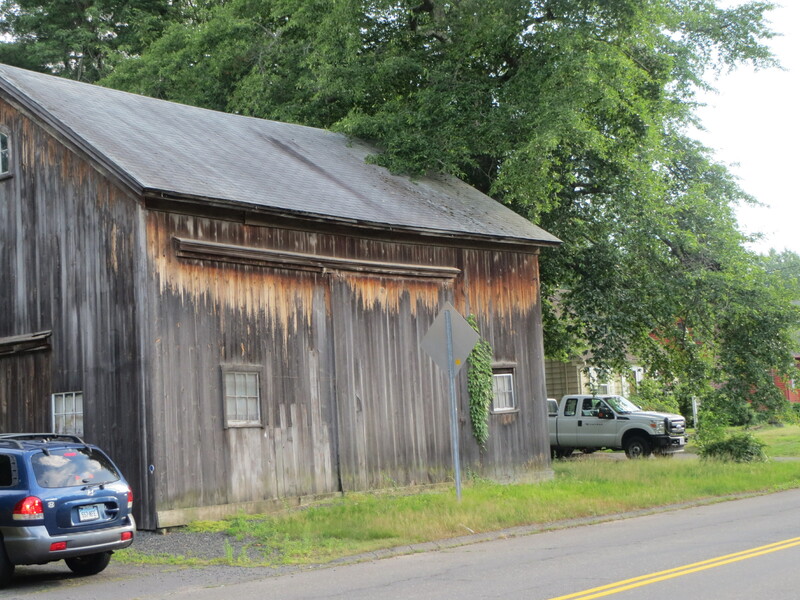 This project is co-sponsored by a grant from The Southington Arts and Crafts Association. 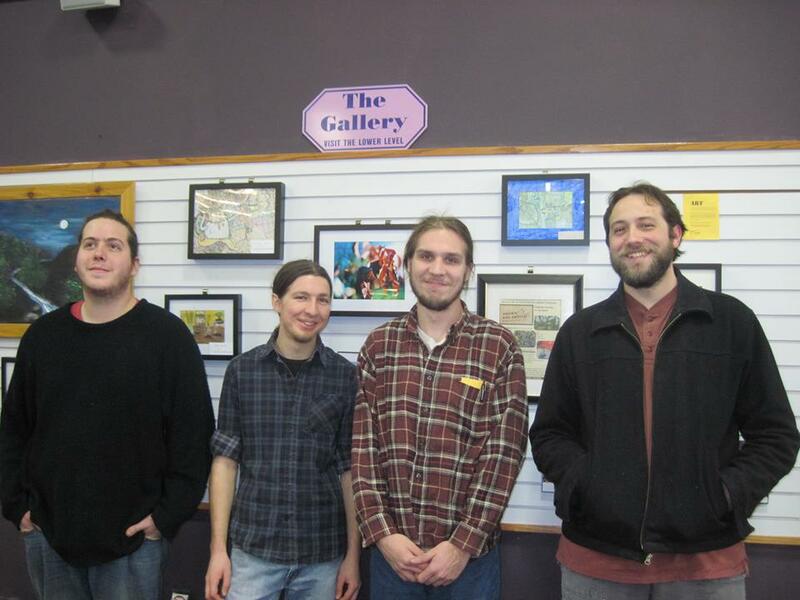 Southington Library Gallery presents “Brownbag Art” as February Artists of the Month. “Brownbag Art” is a small group of native Southington artists who have been fascinated by art and creating art their entire lives. Each artist practices their own style pursuing their individual development as best they can with our own means. Several months ago this group of friends decided to work together and created “Brownbag Art”. This is their collective effort to present their projects to the community working together to reach the largest audience. From happy flowers to dark dreams, vibrant landscapes to ridiculous absurdity, they dabble in different styles and mediums. They aim to capture their realities, sights, emotions, and conjured ideas. Beautiful, ugly, funny, moody, surreal, offensive, and occasionally romantic; it is all “Brownbag”. 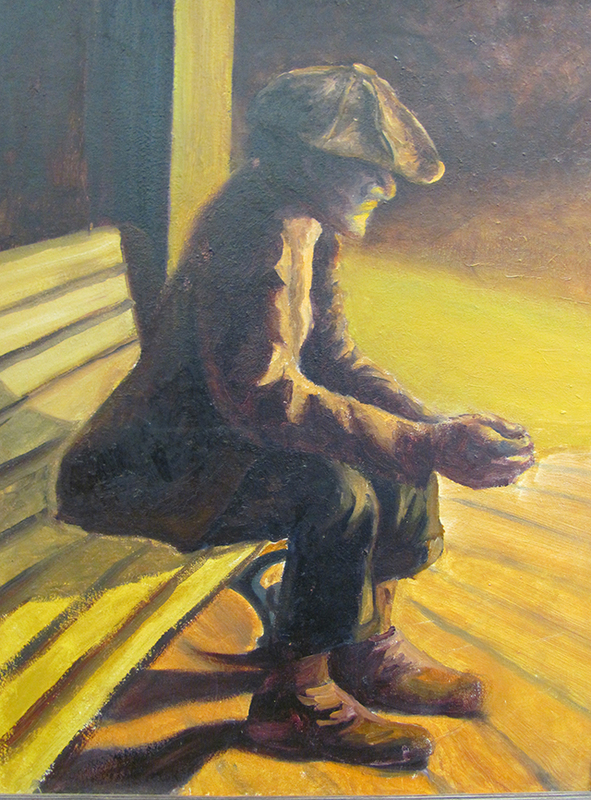 This month the Gallery at the Library is displaying a few selected works of ”Brownbag” artists Kevin Curtis, Cody Lord, Gerry Niemierowko, and John Sokolowski. To view more of their artwork visit their Facebook page at https://www.facebook.com/brownbagartistz. “Brownbag” is always working on new projects and will be continually uploading works for everyone to view online. Please contact John at johnesokolowski@yahoo.com for questions, commissions, and anything else concerning “Brownbag Art”. Edward Tuttle has worked as an illustrator and designer since 1979. Starting as a mechanical artist in a small communications firm in San Diego, Ed quickly gained skills in advertising design and grew in his talents as an illustrator. The acquisition of Union Carbide by Dow Chemical in 2001 provided Ed the opportunity to launch eklektos. 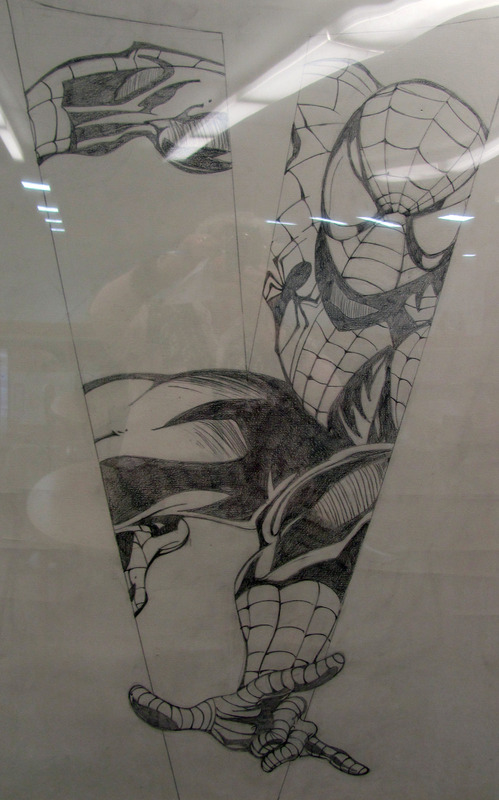 In 2010, Ed received his Master of Fine Arts in Illustration. Since the beginning of his career Ed has been given opportunities to learn from very talented mentors. As a result, he is consistently motivated to pass on his experience to others. As a teacher, his classes are characterized as enjoyable and challenging, creating an atmosphere that produces growth. Ed addresses the whole person, affirming and guiding more than just focusing on the technical part of the process. Teaching is far more than just conveying information to people. It is empowering students to master the information themselves. Ed’s experience as a corporate designer/ illustrator, principal of his own design studio, and a variety of teaching opportunities throughout his career allow him to offer a rich, working knowledge of the arts to any student. The sensitivity and professionalism he brings to his work is equally present in the class room. Ed’s rendition of “The Old Lady Who Swallowed a Fly”, is on exhibit on the main level Gallery Wall. Born in Waterbury Connecticut and now living in Southington, Lydia Tuttle cannot remember a time when she hasn’t been drawing. Growing up with an artist for a father, she was always able to watch and learn, and continually challenging herself to do better. Lydia also enjoys sculpting and photography. Other activities that bring her joy are horseback riding and spending every spare moment with her three year old nephew, Levi. They both share a love of superheroes. 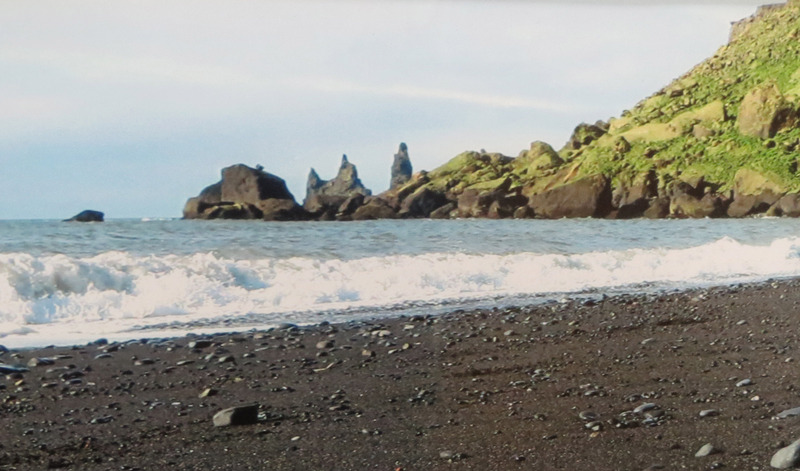 Lydia is seventeen and a senior in high school, and plans to travel after school, one day fulfilling her dream of visiting New Zealand. She also plans to make a third visit to Guatemala this summer. 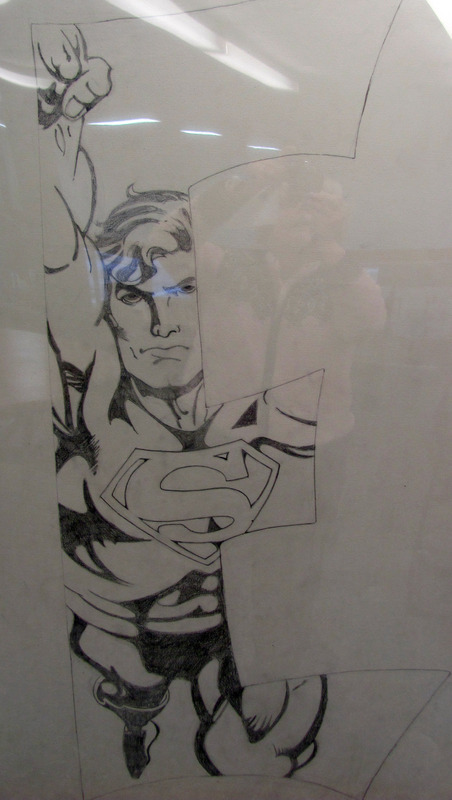 Visit the mezzanine to view Lydia’s exhibit of her Superhero letter drawings and other works by Ed. Visit Ed’s website, http://eklektos.com/about/, for more information and his portfolio. 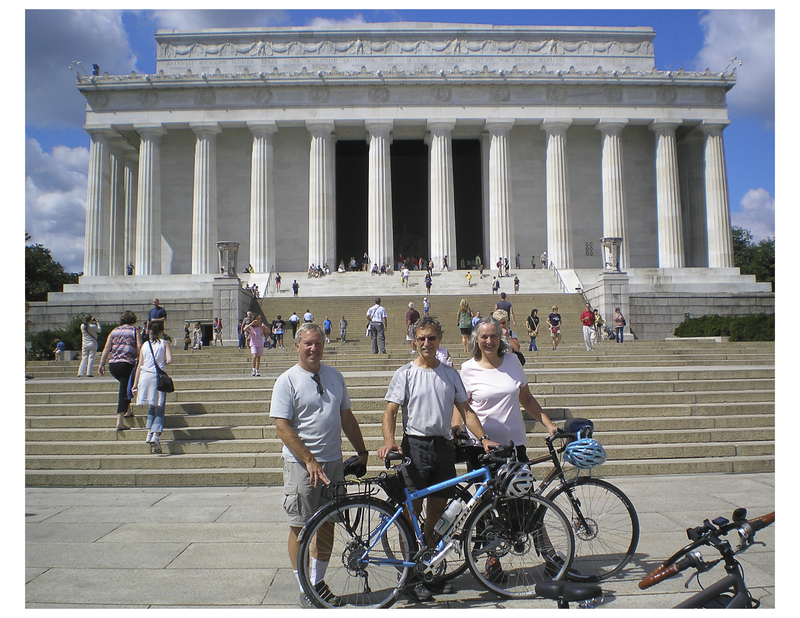 John Smayda begins his bike adventure to Washington D.C.
Diana Diliberto, Mark & Eloise Fioravanti met at a photography class offered at Tunxis Community College, “Beyond the Point and Shoot” and a Field Class. As a result of these classes, friendships were formed. 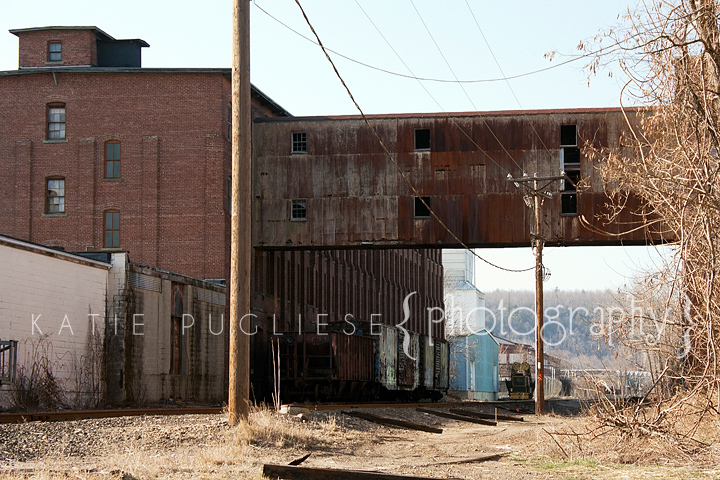 Periodically, they get together for shoots at various locations throughout Connecticut, Massachusetts and Rhode Island. 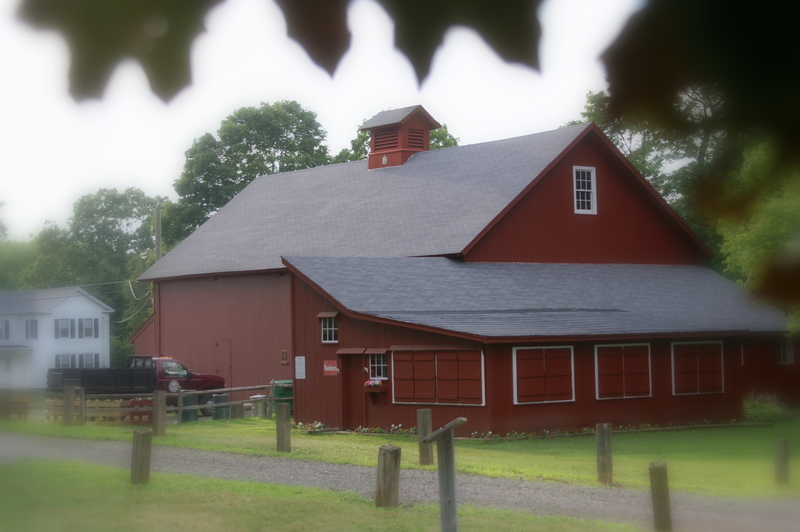 Presently, they are members at the Wallingford Camera Club, Wallingford, Connecticut. They have entered various competitions throughout the state, receiving recognition for their talents at capturing beautiful images. Nathan Gutman, a retired engineer always felt the need to work with his hands. He became interested in woodworking and over the years built many pieces of furniture and toys for his thirteen grandchildren. Some years ago he became intrigued by the art of intarsia. Intarsia is a form of wood inlaying that involves cutting patterns from different types of wood and fitting them together in a way that combines their different textures, colors, and grain patterns to form a beautiful 3D mosaic. The Babylonians, Egyptians, Greeks and Romans used intarsia as an ancient form of decorative art creating pictorial mosaics of inlaid wood or sometimes ivory. Intarsia art developed popularity during the Italian Renaissance where monks from a Mount Oliveto monastery made many beautiful decorations for the monastery and local churches. Samples of these works can be found worldwide. Dean Del Giudice is a Southington native and graduate of SHS class of 1990. 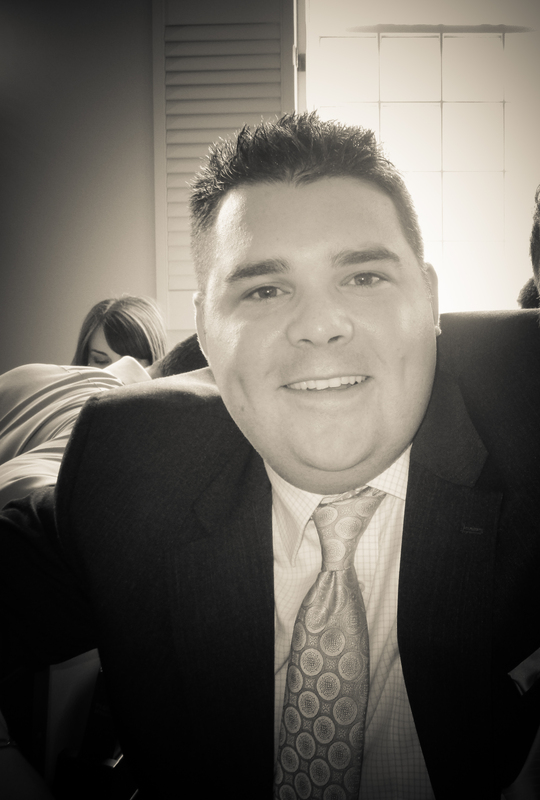 He holds a master’s degree in Technology Education from Central Connecticut University and currently teaches Communication Technology at Hamden Middle School. Teaching and having his summers off allows him the time to focus on two of his passions, gardening and photography. Dino, as his friends call him, has always had an interest in photography throughout his adult life beginning with black and white film. Keeping with the time, he has progressed into using digital color photography and photo-editing computer software. His love of gardening has given Dino the means to share the beauty of his gardens with others through his photography. 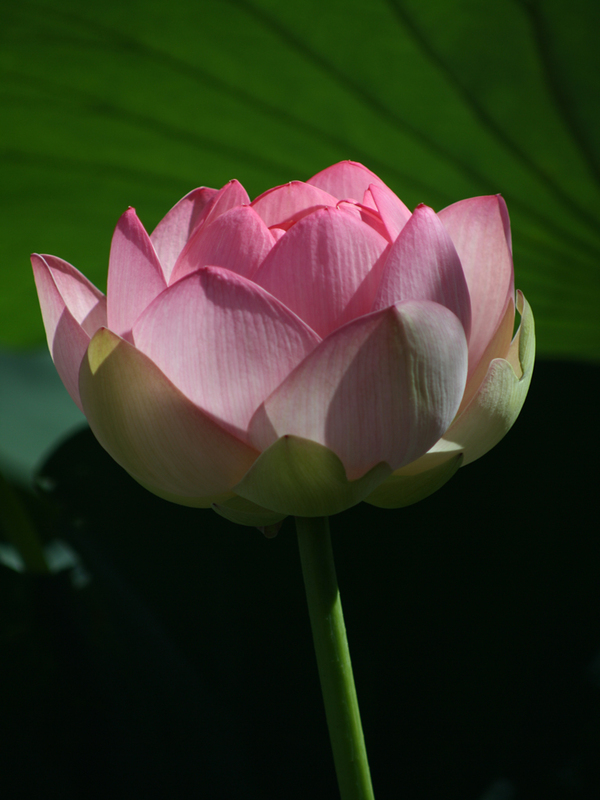 The color images of flowers and garden scenery set one’s mind at peace. 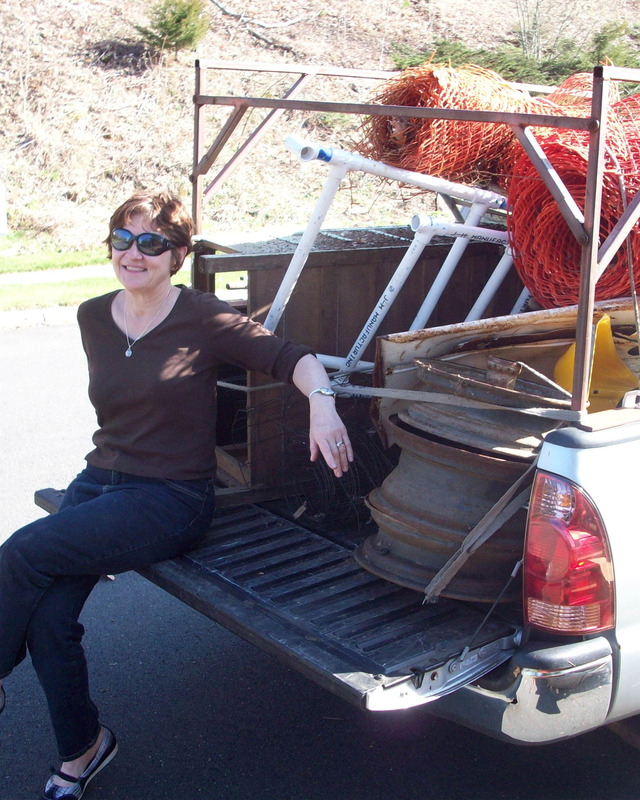 Ferne “Rusty” Waskowicz decided at age 50 to venture beyond her full time positions as an Executive Assistant, a wife and mother to three sons among other wonderful things that go along with being a domestic engineer to pursue her own interests. 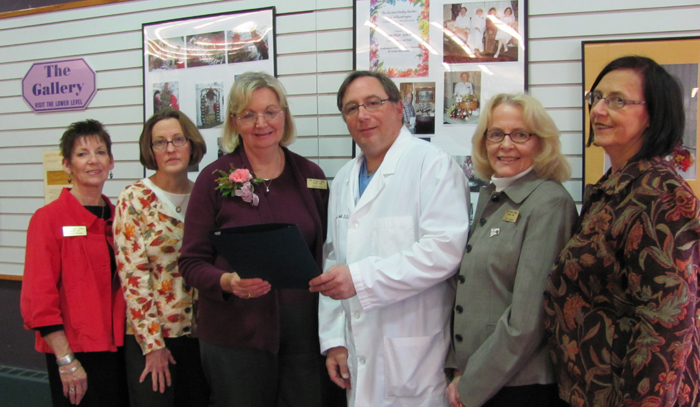 Upon her retirement from Connecticut Community Care she founded her company Rusty Originals. 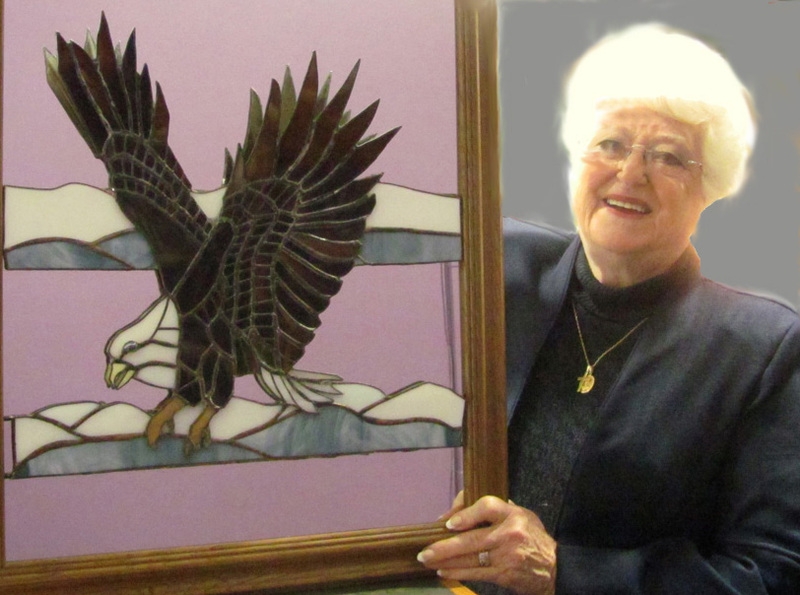 A Southington resident for over 40 years Mrs. Waskowicz took many art related classes including, water colors, oil and pastel chalk, painting, quilting, interior decorating and stained glass to enhance her artistic skills. 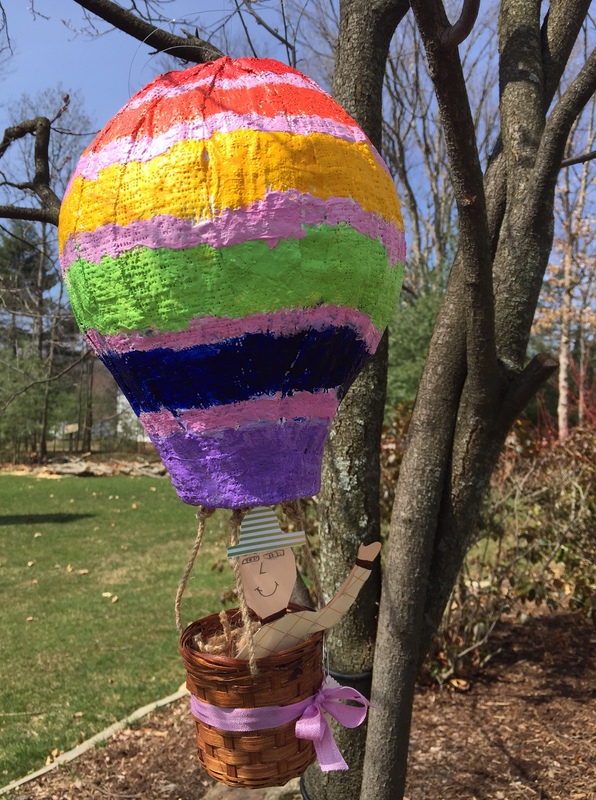 Rusty has participated in several art shows, craft exhibits and in the past was honored as Artist of the Month by several local organizations, including the Plainville Art League, Plainville Library and People’s Bank in West Hartford. She was a featured artist at the November 2010 New England Crafts show in Hartford, at which she displayed her stained glass work. The day does not hold enough hours for Rusty to work on all the things she loves, mostly items in stained glass. Now at a young active 78, she believes that life still has a lot to offer and one should take advantage of all opportunities no matter what age you are. The creator of a three dimensional effect of stained glass objects on a framed mirror Rusty’s mirrors will be featured in the exhibit and are available for purchase. 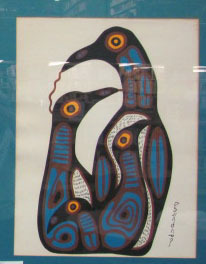 Waskowicz draws on her creative talents to design original works as creative gifts for a wedding, birth or housewarming. She develops a drawing of a requested item for her customer’s approval, hence, Rusty Originals. The Hearthstone Restaurant in Plantsville has two Rusty Originals stained glass mirrors as part of the décor and many of her works can be seen at O’Rielly’s Gift Shop in Farmington. Rusty invites the community to her Meet and Greet reception at the Southington Library, Wednesday June 6, 6:00 p.m. to 8:00 p.m. Enjoy some light refreshments in the program room while you view her exhibit in the Gallery. 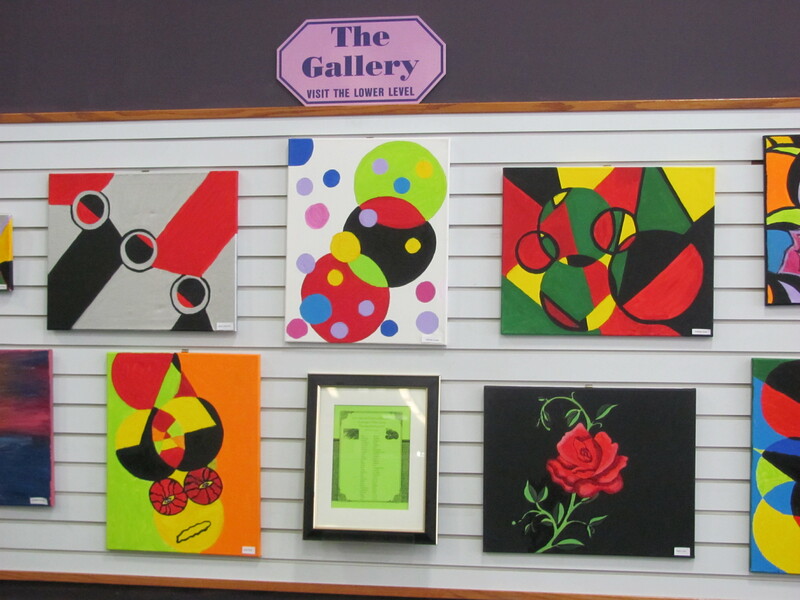 The Gallery is located on the main level near the Café and the lower level outside the Friends bookstore. Visitors are welcome to view the exhibit during the normal business hours of the library, Monday through Thursday 9:00 a.m. to 9:00 p.m. and Friday and Saturday 9:00 a.m. to 5:00 p.m. 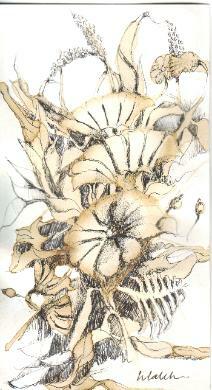 The artist will be exhibiting a variety of pieces including renderings of still life, landscape and floras’. 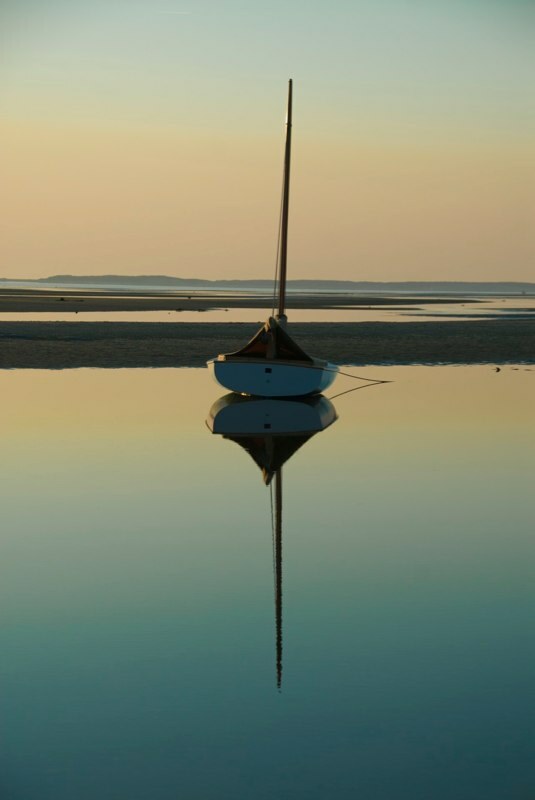 She finds inspiration for her work in the endless beauty of the land, sea and sky along the Connecticut and Rhode Island coast. 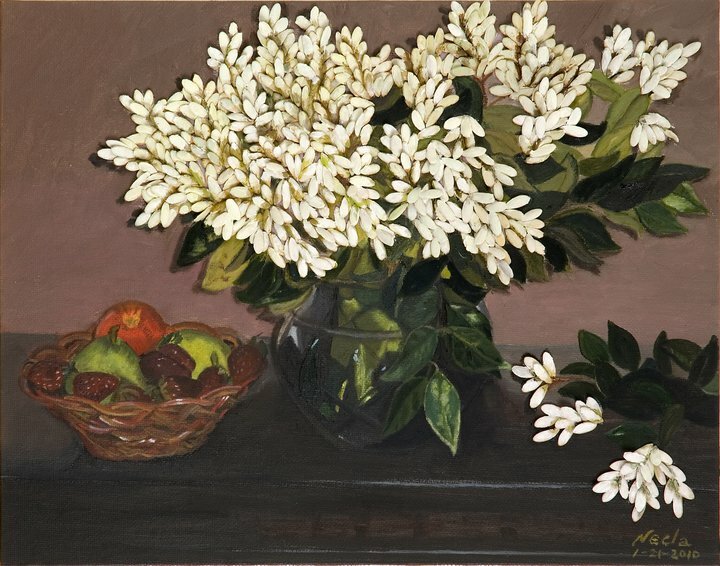 In addition, her flower garden serves as a resource for her still life and floral paintings. When the weather is cooperative, she can be found painting en plein air. 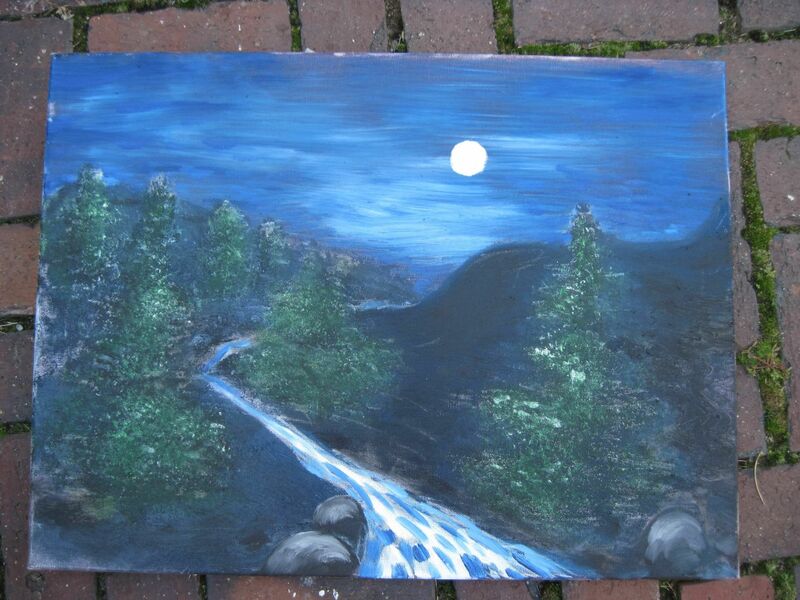 She feels outdoor painting can be stimulating and challenging. Being surrounded by the subject that one is painting often produces wonderful results, which may not happen in the studio. 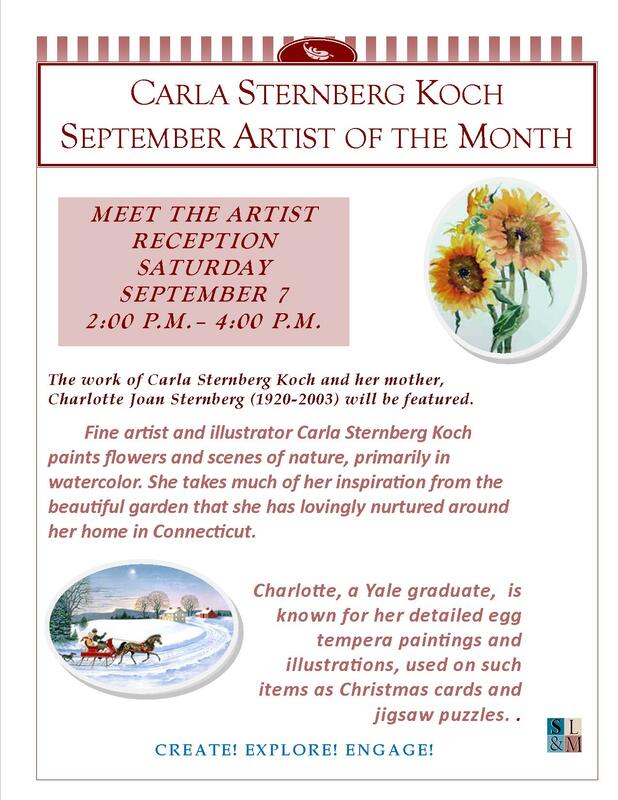 She is a member of the Connecticut Watercolor Society, the Guilford Art League and the Southington Arts and Crafts Association. Her paintings can be found in public and private collections. 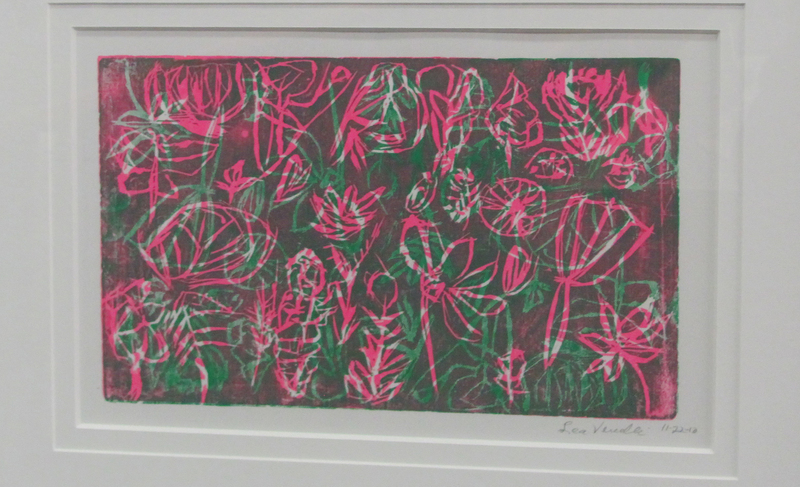 Among these is a piece purchased to hang in the offices of former congresswoman, Nancy Johnson. Other awards include a Purchase Award from the East Hartford Art League as well as awards from the West Hartford Jr. Woman’s Club and the Glastonbury On The Green Art Show. Photographer Don NichparenkoDon recently documented on Facebook several local events and locations with his unique photographic style. Mr. NichParenko was born in Pennsylvania and joined the Army’s Elite 77th Special Forces Group after graduating high school. Don earned his Jump Wings and took part in extensive clandestine intelligence training characteristic of the airborne operations. Upon Mr. Nichparenko’s discharge from the Army he joined the work force, serving his apprenticeship and mastering the skills to earn his Journeyman degree in the Machinist trade and expanding to the tool and die maker trade then master model maker trade. Don used his creativity as a Creative Prototype Developer with General Electric, Milton Bradley, Coleco, Stanley Works and many other consumer product firms, working with metals, plastics, composite materials and other media. While a prototype developer Mr. Nichparenko developed the board game version of Battleship originally a pencil and paper game. The updated version was eventually acquired by Milton Bradley Corporation of Massachusetts. Since his retirement Don has combined his industrial skills with his true passion of photography and cartooning recently receiving an award in the Creative category of a CCCI sponsored photo exhibit. 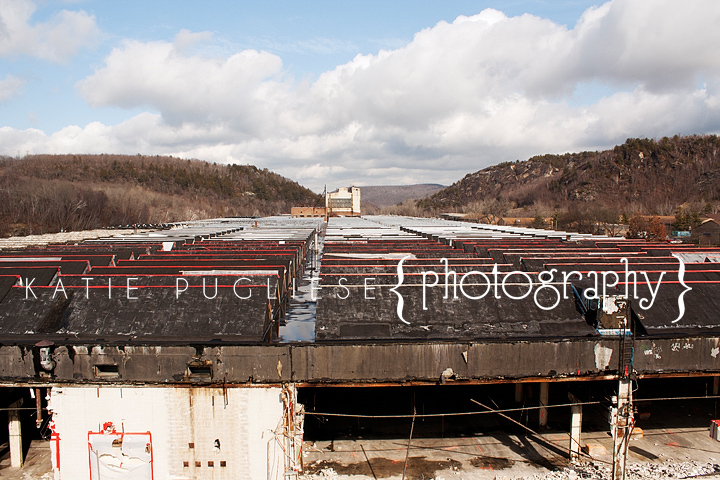 To contact Mr. Nichparenko email him at parenko@aol.com, to view some of his work online visit don -nichparenko-photograp.smugmug.com. 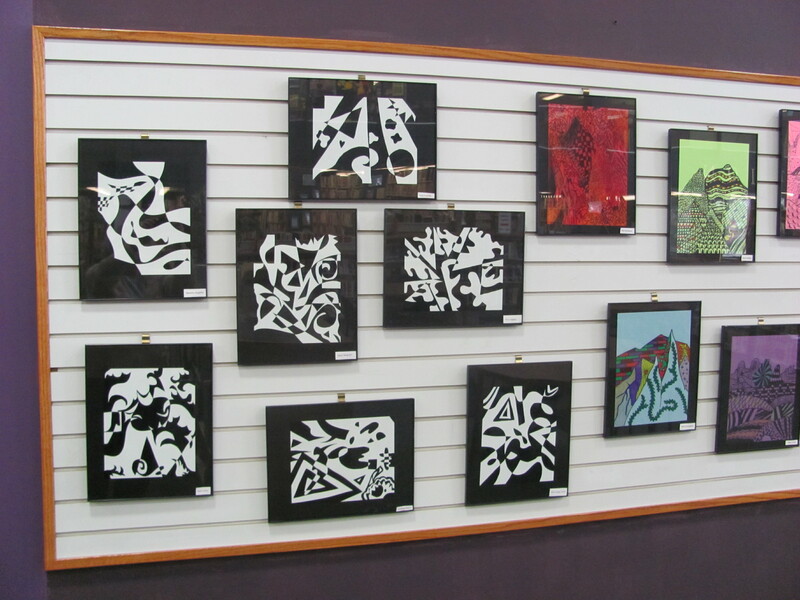 Mr. Nichparenko’s work will be on exhibit in the Gallery at the Library through the end of April. 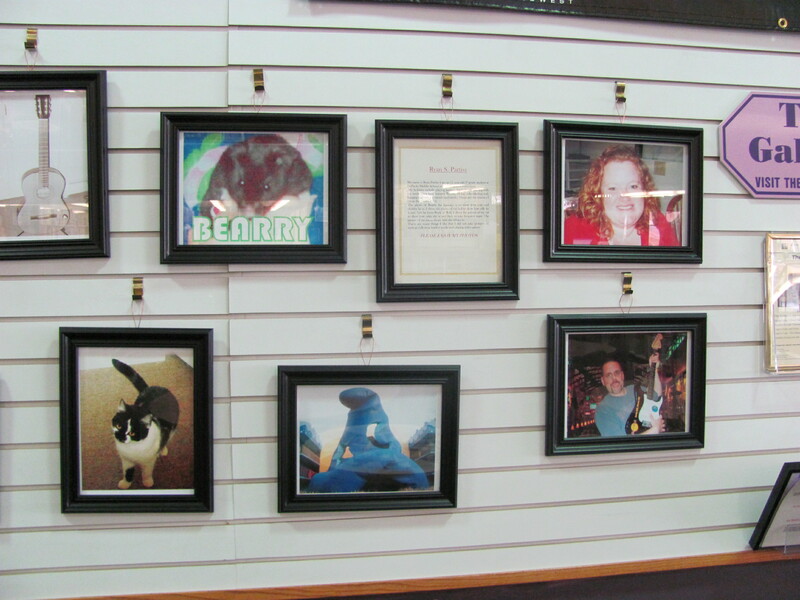 The Gallery is located on the main level near the Café and the lower level outside the Friends bookstore. 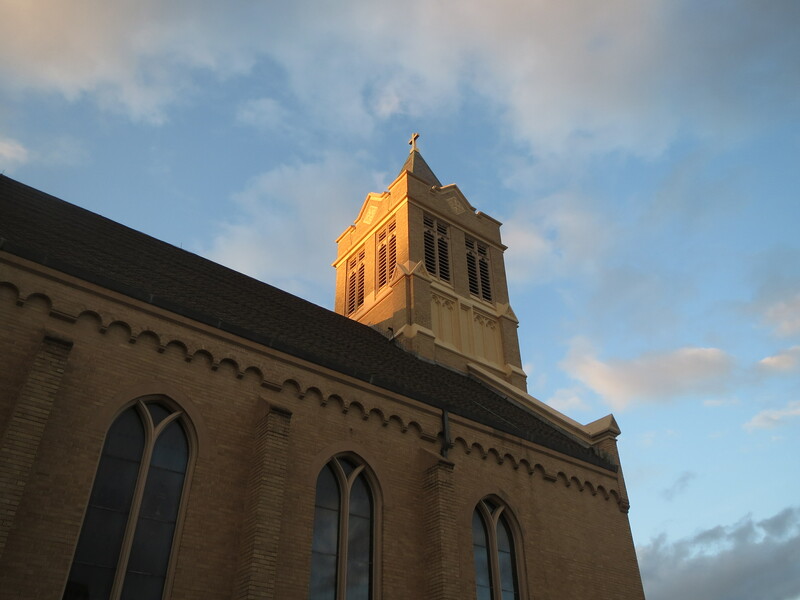 View the exhibit during the normal business hours of the library, Monday through Thursday 9:00 a.m. to 9:00 p.m. and Friday and Saturday 9:00 a.m. to 5:00 p.m.
Iconographer, Andrew Bobik will exhibit many of his writings in the Gallery at the Library during the month of March. To learn more about iconography join Mr. Bobik as he presents two free seminars to explain Iconography history, techniques and much more. Registration is requested for these seminars visit the library calendar of events at www.southingtonlibrary.org or call the Reference Information Desk at 860-628-0947 x5. Mr. Bobik raised in the churches of Byzantine tradition in Pennsylvania developed a love for the church and art which led him to the study of iconography. After much study of the ancient canons and writings regarding iconography, and observing iconographers at work, he chose to begin the journey of writing icons himself. Since 1997 Andrew has been writing icons both for churches and individuals. 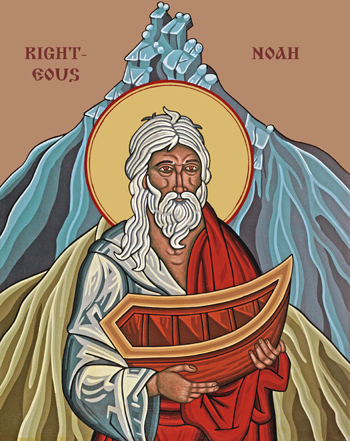 Mr. Bobik’s icons are in several churches in Pennsylvania, West Virginia, Colorado, California, Arizona and Ohio as well as in several private collections throughout the country. His work is done in acrylics and he has utilized both canvas and wood for the various projects. He has also used his woodworking skills to build icon screens, altars, service tables, and various other liturgical items for churches. 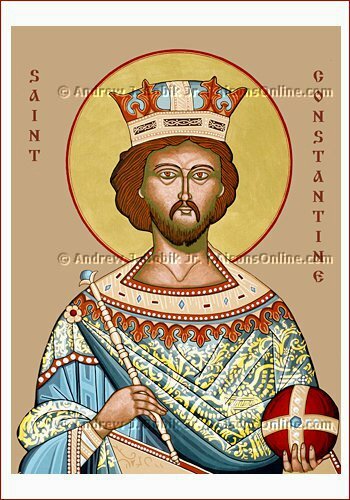 Please visit Mr. Bobik’s website www.aiconsonline.com for more information about Andrew’s icons. 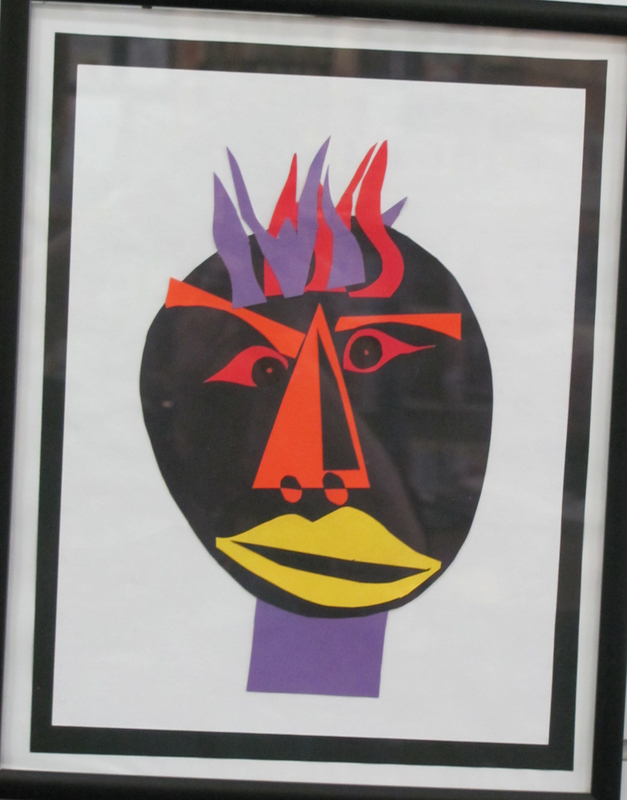 Mr. Bobik’s icons will be available for purchase during the exhibit and at his seminars. You may contact Mr. Bobik at andrew@aiconsonline.com. Stella Roman was born in the small town of Sieniawa Poland in 1931. After the war, in 1947 she moved to Szczecin, Poland where she attended Art School. She became an interior decorator then Stella met her husband and decided to leave her profession to be a mother and homemaker. In 1960 the Roman family immigrated to United States. Stella studied water color painting with artist Tomas DeFronzo and attended several other art classes. 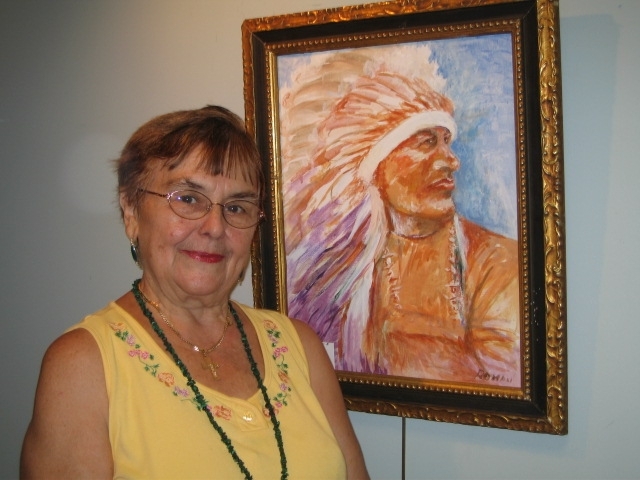 Mrs. Roman has been a member of the Polish Society of Artists since 2010, where she has exhibited her art in their New Britain gallery. 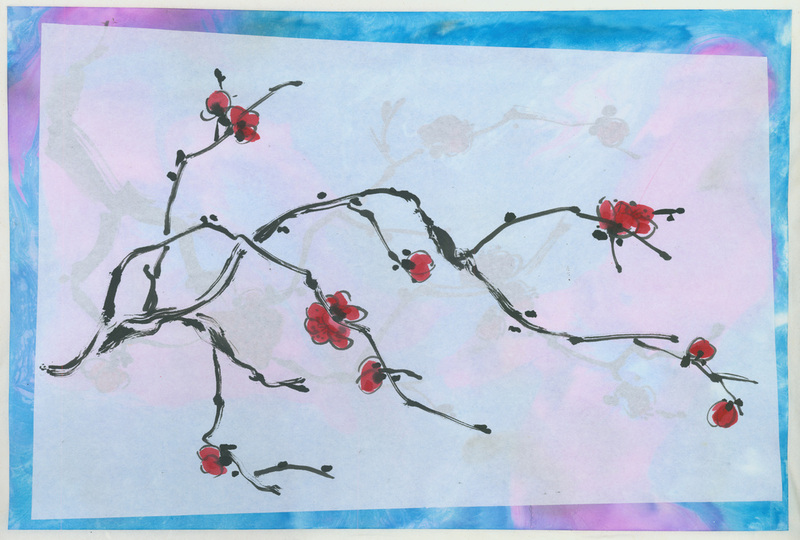 Stella continues her water color painting for several years and began classes at the Calendar House Senior Center. She added oil and acrylic painting to her art expression. 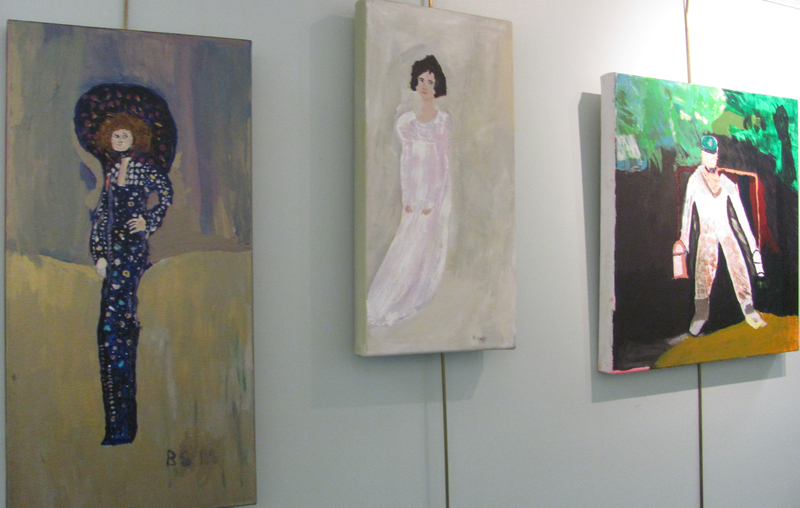 Stella has entered several of her works in local art exhibits. Stella continues to express her art in all three venues. Reception Thursday December 8, 2011 5:30 p.m. to 7:00 p.m.
Local artists, photographers and writers exhibited of their creative works the month of December. The community was invited to view the artwork, read the Ekphrasis writings and be entertained by acoustic guitarist Neal Fitzpatrick in the Cafe. Many strolled to the lower level Gallery and to view more of the exhibit and to sit for a free portraiture by artist Judy Tourangeau. This event was funded by a Target Arts and Culture grant and a Southington Arts Council donation. Complimentary light refreshments provided by Bertucci’s of Southington. In the spirit of holiday giving, all who came to the reception were encouraged to donate a “Christmas Dinner” food item for Southington Community Service. 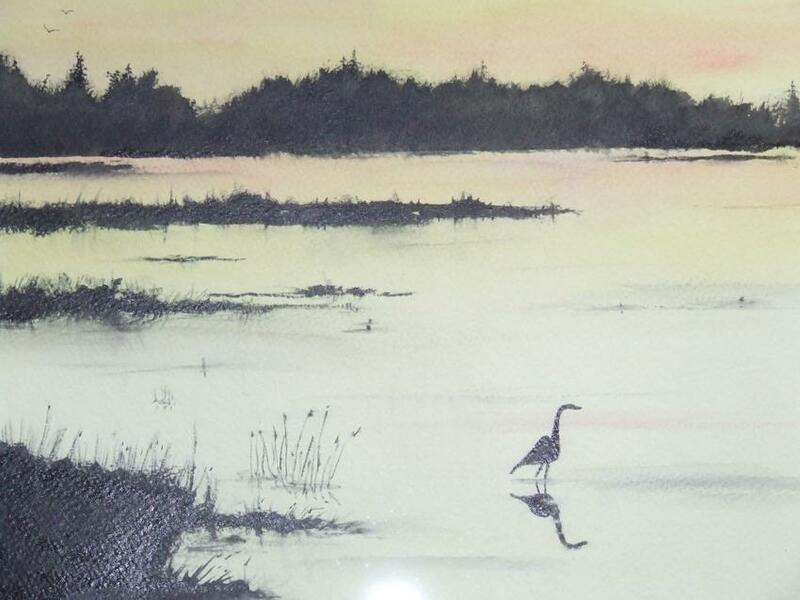 Gail began her passion for watercolor painting many years ago and since she has widely exhibited in solo and group shows, juried art shows and has received numerous awards throughout the years. Her strong love for plein air (outdoor) painting brings her to many locations in the Northeast capturing a special scene to create on paper. Her paintings are hung in hundreds of homes and businesses in several countries. 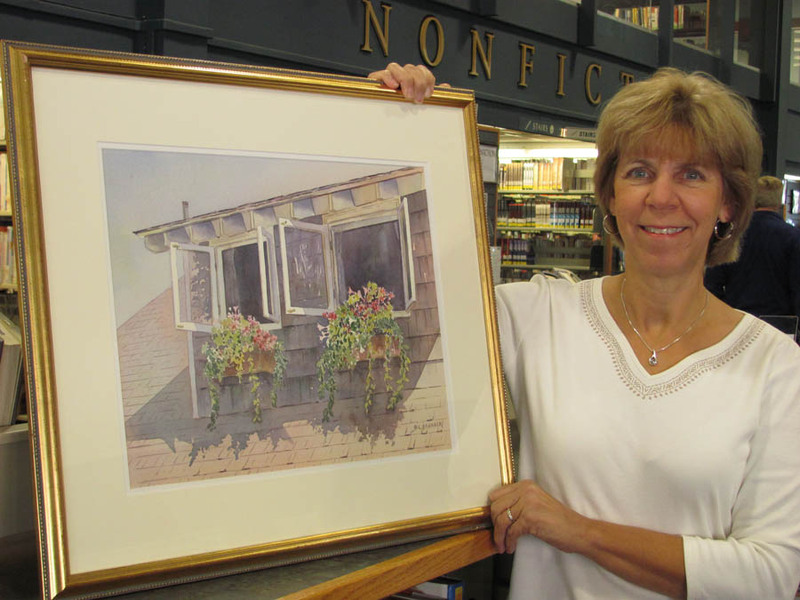 Gail is a member of the Connecticut Watercolor Society, serves on the Board of Directors at Southington Arts and Crafts Association, is involved with several area art leagues and has taught watercolor classes for many years locally. Visit the Gallery while the exhibit is on display during normal business hours of the library, Monday through Thursday 9:00 a.m. to 9:00 p.m. and Friday and Saturday 9:00 a.m. to 5:00 p.m.
John Smayda is an accomplished photographer and musician. He is a music teacher in the Plainville school system, a professional clock repairman and is active at The American Clock & Watch Museum in Bristol. 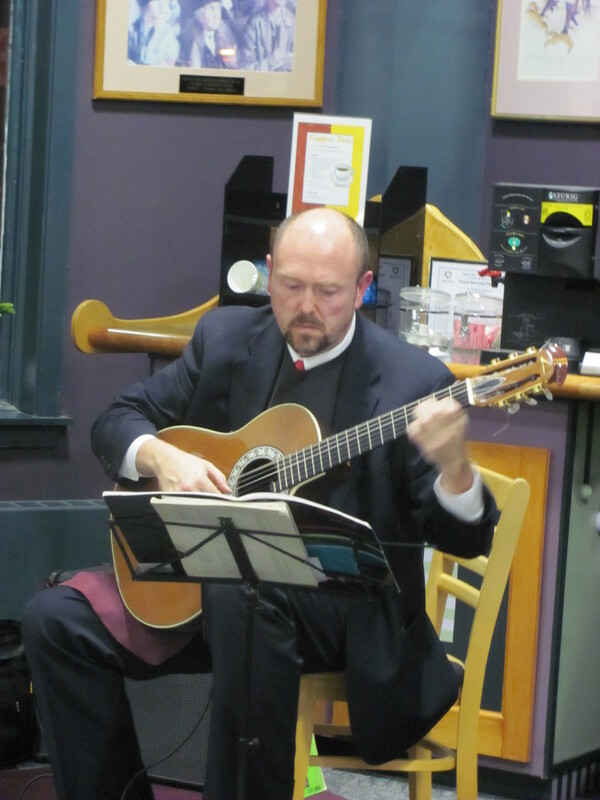 John holds a Doctorate in Educational Leadership, an MBA degree and several music degrees. John Smayda began his interest in photography at an early age learning many skills from his father who was an excellent film photographer. 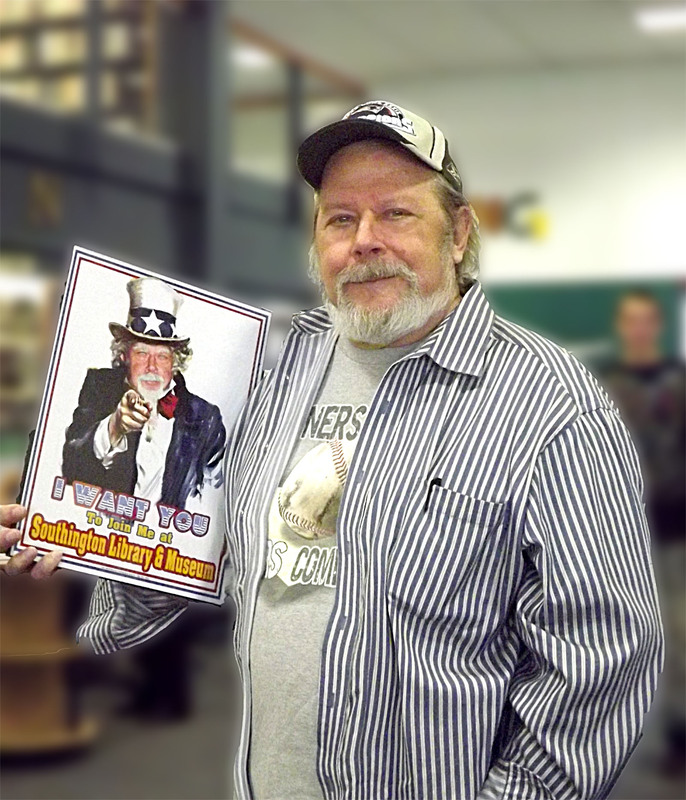 A resident of Southington, John has previously displayed his work at the Southington Public Library and the Barney Branch of the Farmington Public Library. animals, birds and flowers she so appreciates. 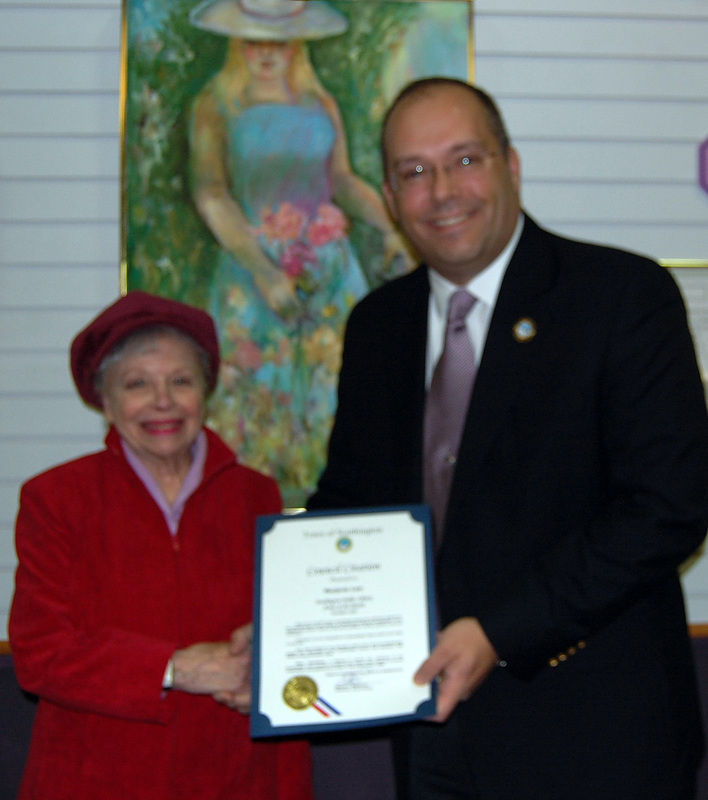 Town Councilman Albert Natelli present artist Dorothy O’Rourke the Town Council Citation for Appreciation of her work. brought the artist out of her. Ms.
during the month of August 2011.
some of his photography you can visit his website at www.johnatashian.com. 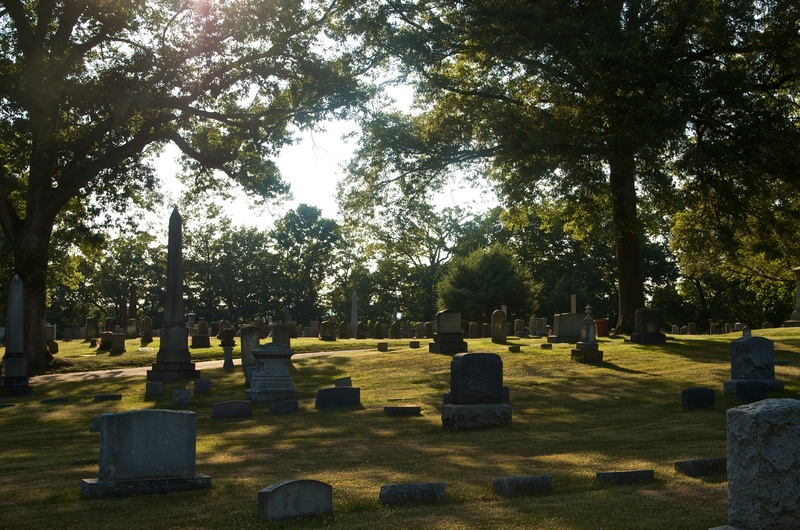 Wednesday, July 6, at 6:30 p.m. 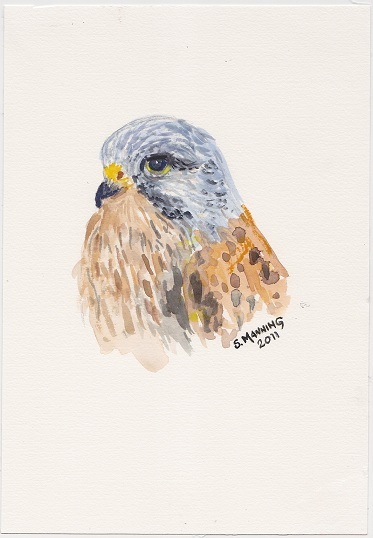 The public is invited on Wednesday, July 6, at 6:30 p.m. to meet artist Sandra Manning and author/ apprentice falconer Talon Skye. The Southington artist will exhibit the original watercolor illustrations from her recently published book, Sanman Art 2011. 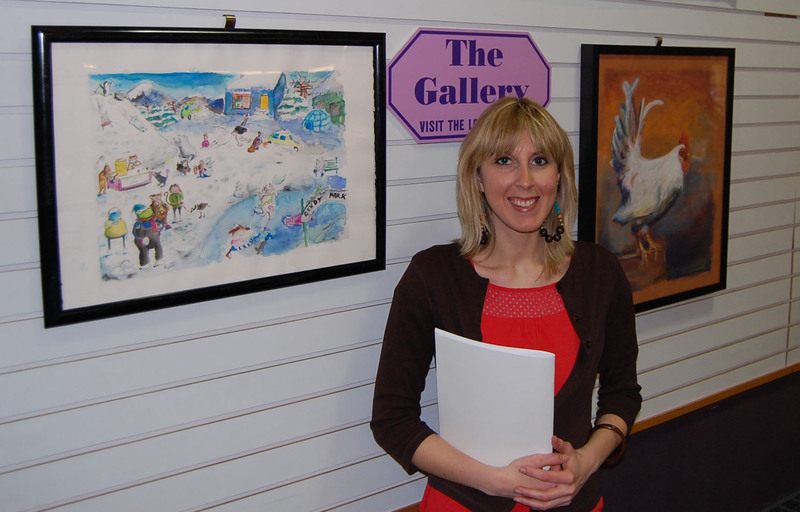 Sandra is also the illustrator of Kestrels In My Kitchen, a children’s book written by Talon Skye. Manning’s paintings will be available for viewing in the Café Gallery at the Southington Library during the month of July. At the July 6th informal Meet and Greet reception, Sandra will share her experiences as an illustrator. 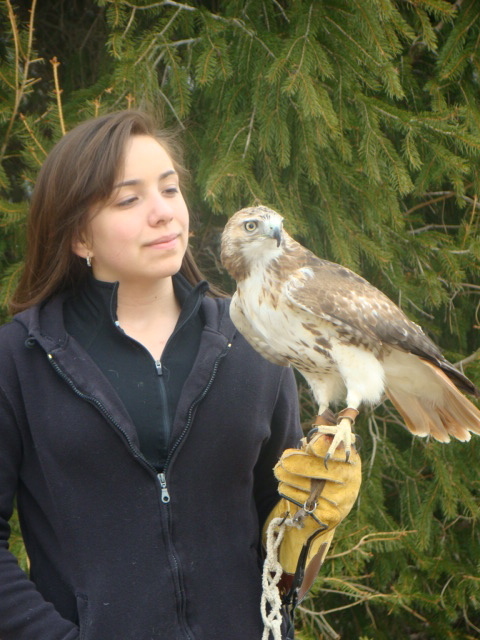 Sandra will be joined by Talon Skye and her mother, Lorrie Schumacher, master falconer and several raptors. Sandra graduated from the University of Connecticut, and then earned a master’s degree from the University of Hartford. 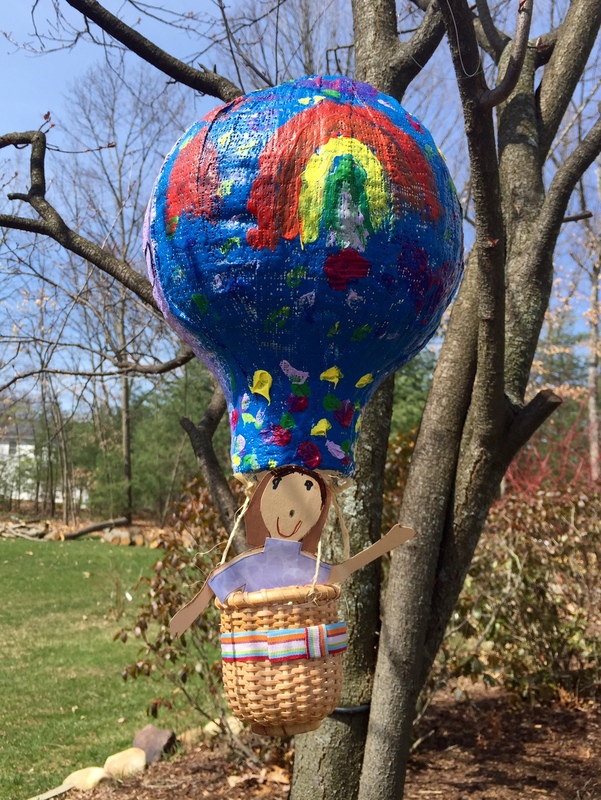 She is a retired elementary art teacher from Southington, and currently supervises student teachers from Southern Connecticut State University. 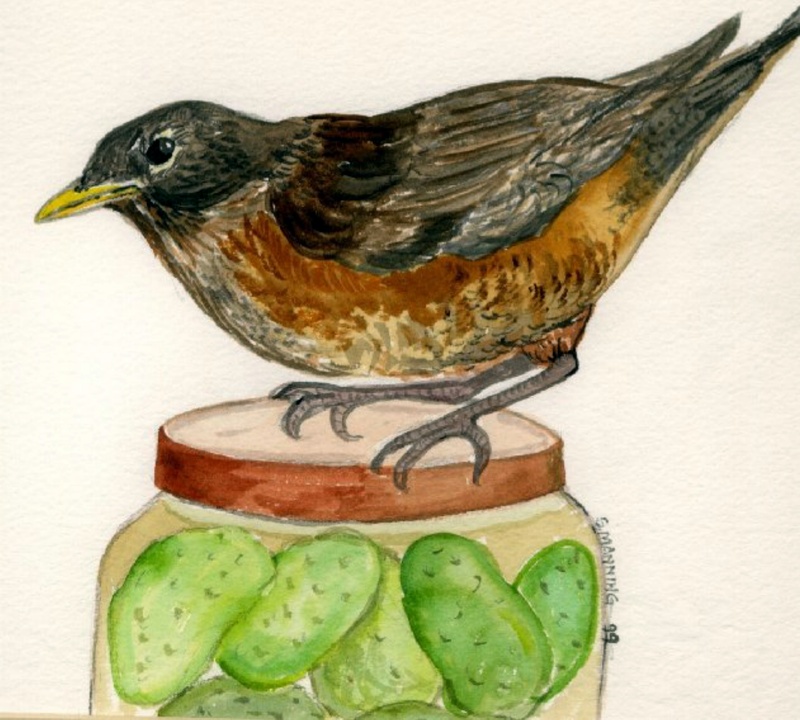 Her medium is watercolor, and she enjoys painting animals, especially wild birds. Talon Skye has been involved with falconry since the age of three. She is an accomplished apprentice, and with her mother who is a master falconer spends much of the year traveling with their birds of prey to educational programs. 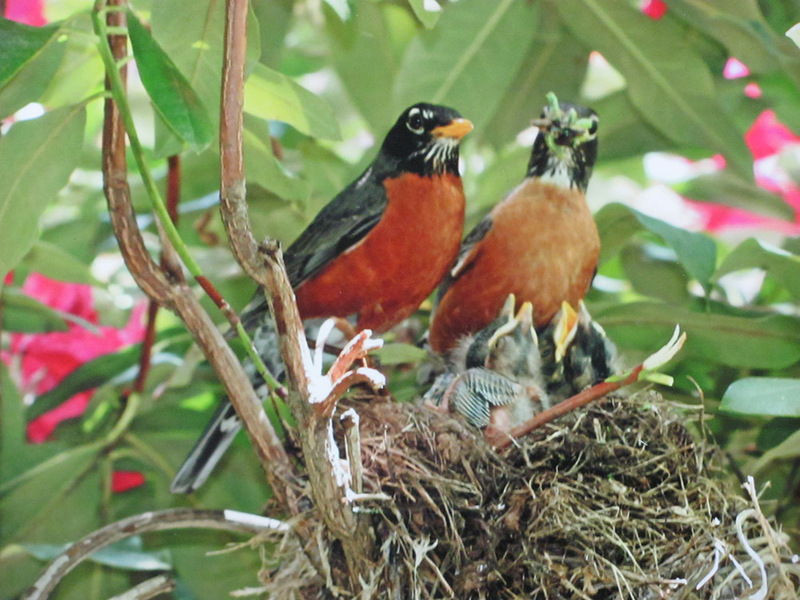 They are not performers, but instead feel a heartfelt love for birds and their place in the environment. Their goal is to raise awareness of the raptors’ roles in a balanced habitat. Patrons who register to attend the Artist Author Meet and Greet will meet Bella Luna, a barred owl, sweet-faced with a delightful personality and watchful eyes that can charm anyone. Along with Bella Luna, several raptors each one with creative names that seem to match their personalities will be at the Meet and Greet. Talon’s mother and Mrs. Manning met during an educational program several years ago, and began an association, which led to a friendship. Visit the Café area Gallery while the exhibit is on display. The Gallery is open during normal business hours of the library, Monday through Thursday 9:00 a.m. to 9:00 p.m. and Friday and Saturday 9:00 a.m. to 5:00 p.m. The Library is closed Saturdays during July and August. Patrick Holland grew up in Naugatuck and was involved in the volunteer EMS squad. 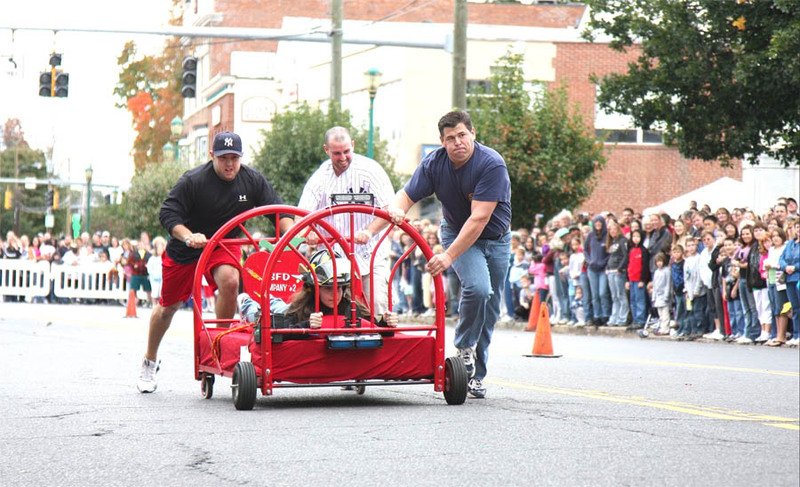 He became a paramedic, in 1994 he joined the Ridgefield Fire Department. Patrick has been interested in photography all his life starting with film and now digital. He currently does freelance photography for an internet media company. Patrick’s exhibit will include photos from his travels around world, including Africa. 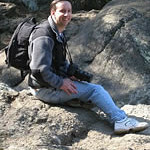 Mr. Holland has been doing photojournalism for a short time but has been published in the West Hartford News, Bristol Press, the New Britain Herald and the Middletown Press. 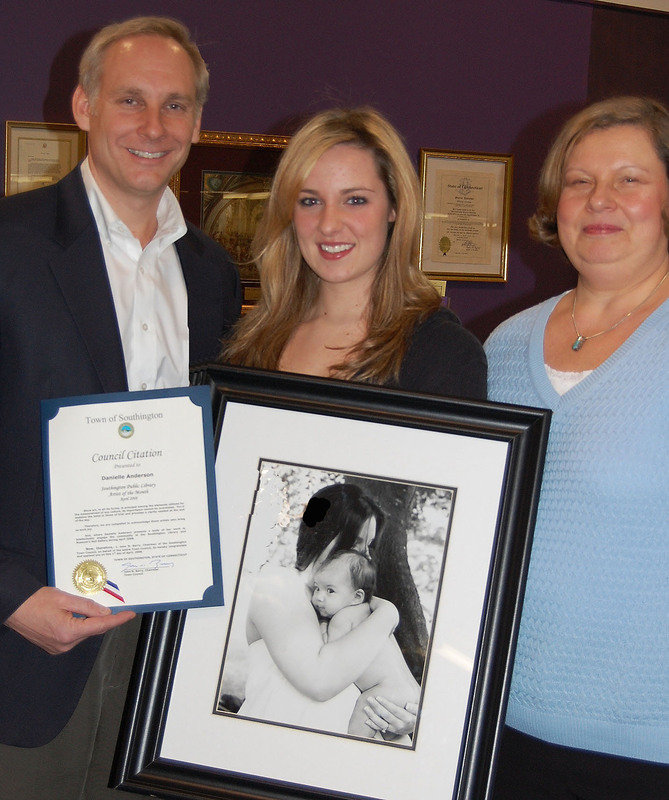 Patrick resides in Southington with his wife Melissa and his daughter Juliaand new son Patrick. 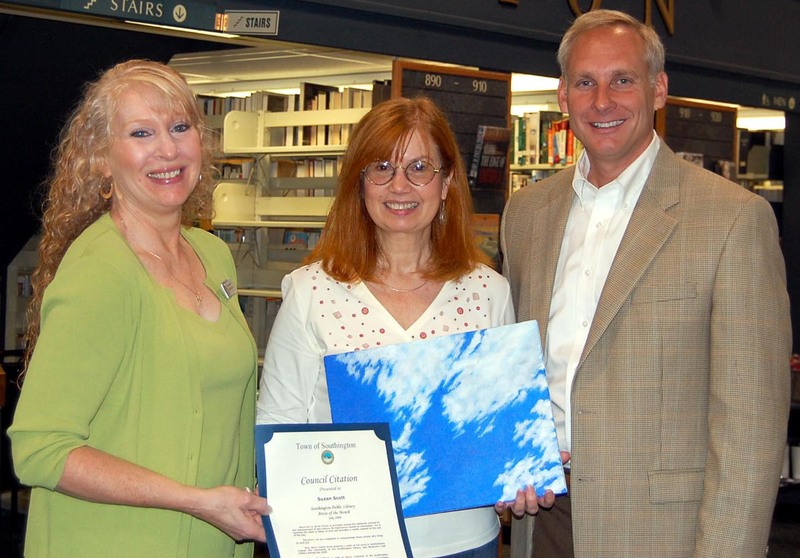 Jane White a well respected artist and resident of Southington is the June Artist of the month at The Gallery at the Southington Library. 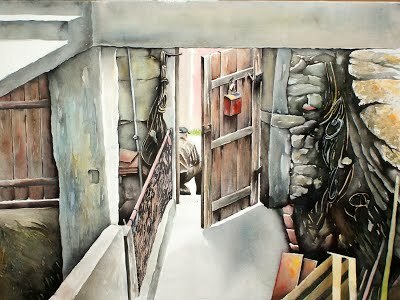 Jane will be exhibiting landscapes and house portraits done in watercolors or pastels. 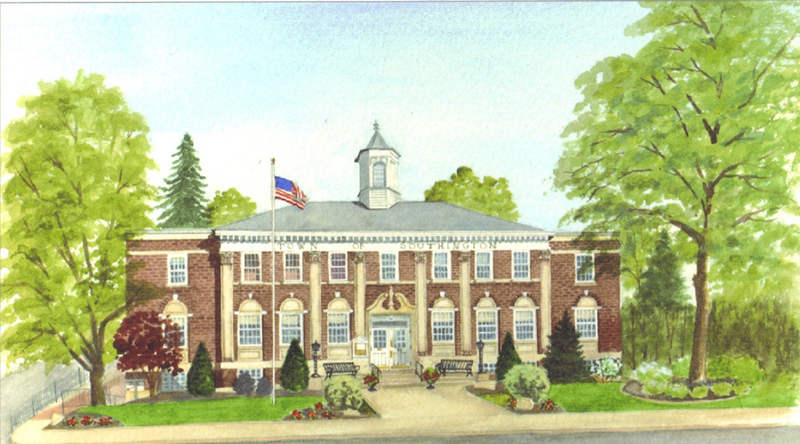 Jane recently was commissioned to paint the Southington Town Hall as a retirement gift to John Weichsel, Southington Town Manager. 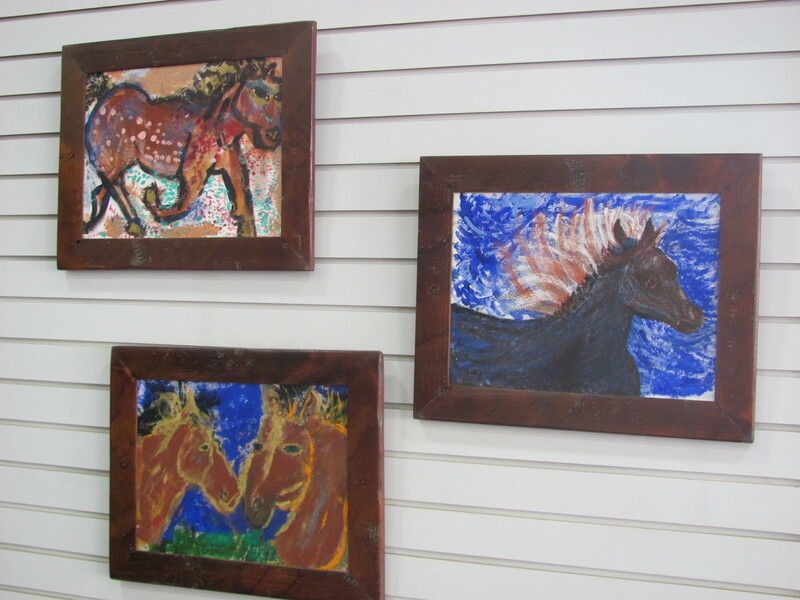 She also enjoys painting old barns, and animal portraits. Ms. White majored in commercial art major at Endicott Jr. College and continued at Miami University of Ohio. Her work has been exhibited at Bradley Memorial Hospital in Southington, Stonington Vineyard and the CT River Artisans in Chester. 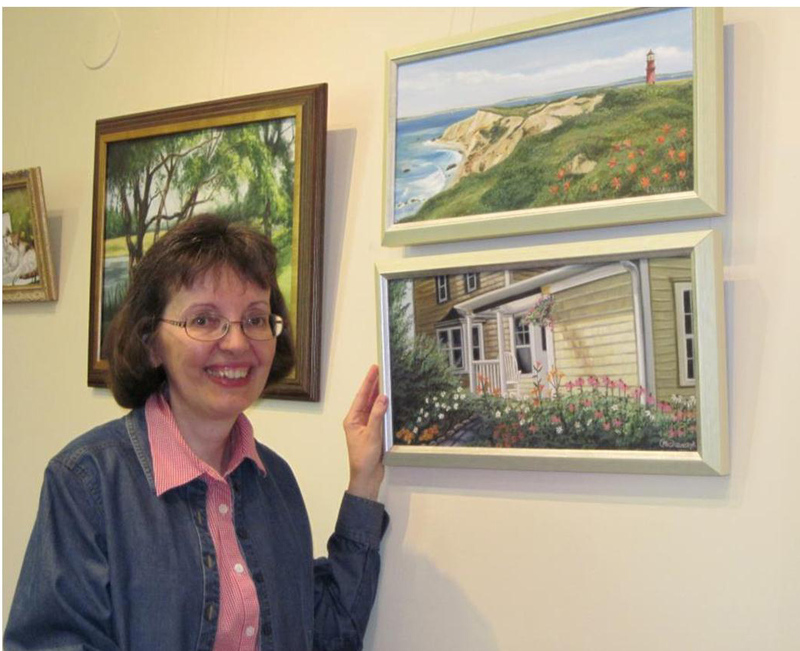 She received the Southington Arts and Crafts 2011 “Presentation of Work” award at the Gallery 53 May exhibit and was a winner of the Grumbacher Gold Medallion Award at the Connecticut Pastel Society National Show in addition to numerous other recognitions. 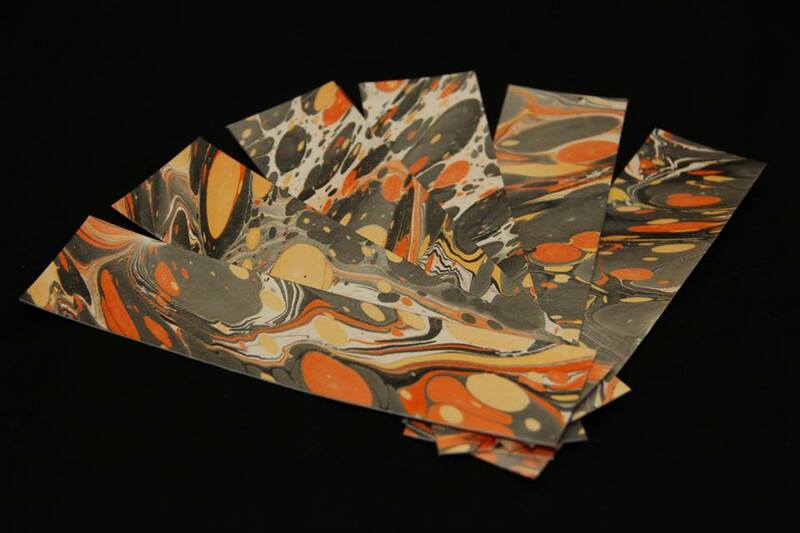 Jane also enjoys making handmade paper books and produces postcards of her paintings. Artist Statement – Why do I paint? There is a force that excites me about what I am seeing. Can I capture the feeling on paper and give it dimension? I alternate painting with watercolors and pastels. and that adds to the excitement. 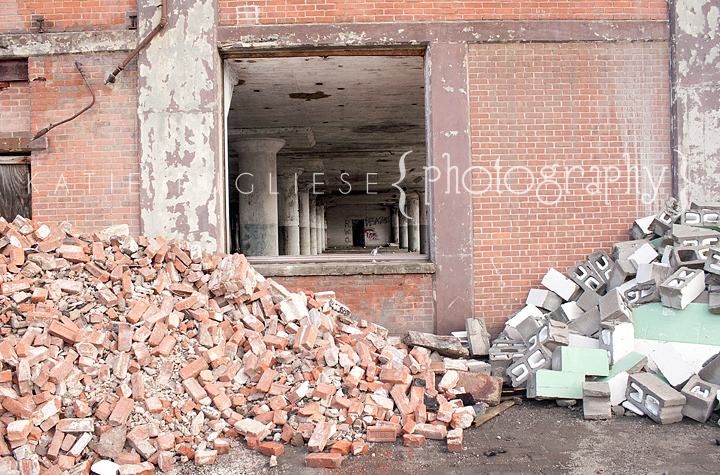 Li is a photographic artist with a background and passion in and for, many different mediums. After a lifelong love of photography and other arts as a hobby, she recently ventured into turning this passion into an aspiring career. She believes that creativity is something deep within a person and not learned. 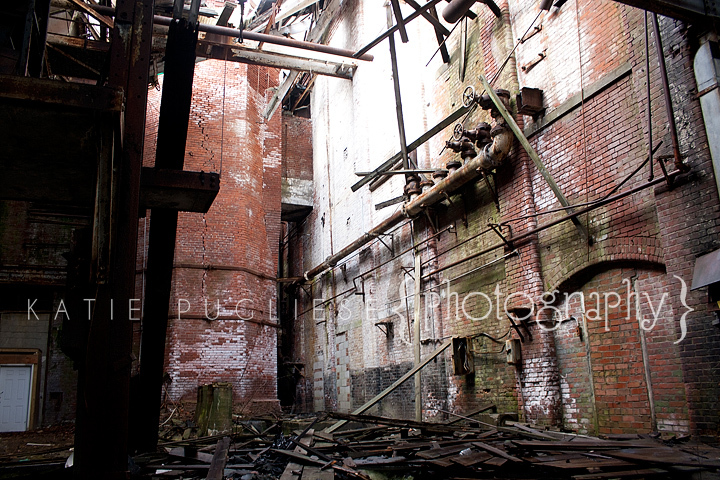 You can find out more as well as seeing many samples at: http://www.wix.com/lnmdigitalart/photography. Visit the “Leaping into Art” website at http://www.katiekopcha.com/leapingintoart. Most of the pieces on display are minimalist collages that started with a simple shape cut from a magazine photo or other professionally printed material. Finding suitable shapes hiding in places like the folds of fabric, the shadows on a rock, or the rim of a bowl… Arlene allows her imagination to play. Using a dark background for contrast, the shapes often seem to form their own dreamlike image or character… much like the images we see in clouds or in shadow puppets on a wall. The characters defined in simple silhouette are whimsical and quirky. Yet they are always somehow representative of a mood or feeling. Some may evoke a quiet repose, a moment of joy, even a sense of mystery or magic…but always playful and always fanciful. A sort of visual haiku, they are brief, concise and personally interpretative. I think that art can be a form of personal meditation and reflection. I especially like collage because it allows the imagination to recycle existing forms into something new, using their qualities of light, texture, shape and color in a way that says “here’s a new way of looking at things”. 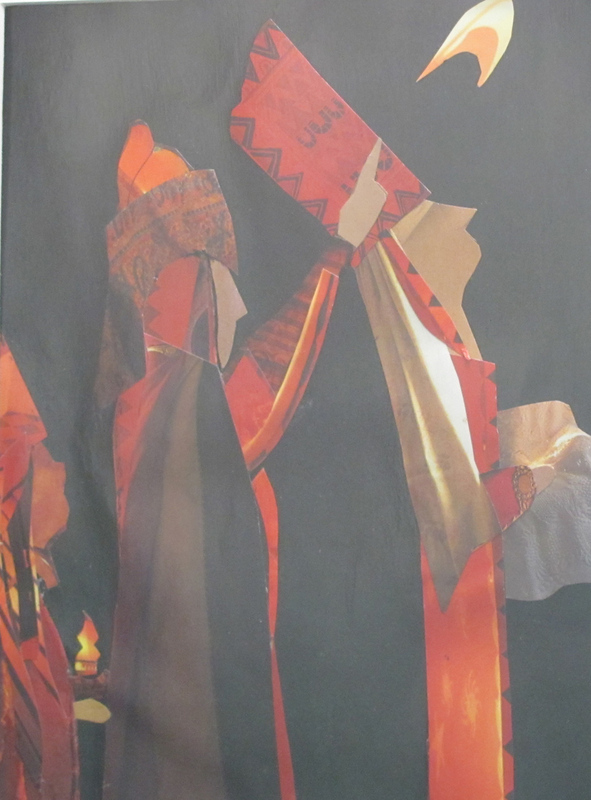 More recently, I have been combining acrylic painting with collage. I have included a few of these in this display. I hope the simplicity of these fanciful images provides the viewer with a brief respite from the everyday, a short flight of fancy, maybe a momentary meditation. Mostly, I hope they are as much fun to view as they were to create. Over the years Arlene studied art on her own and in many college courses on drawing, design and illustration. She filled countless notebooks with sketches and drawings, mostly of faces and cartoon like figures. Arlene loves the whimsical seriousness of artists like Matisse and Chagall and of course, the surrealists, creators of dreamlike imagery and mood-scapes. 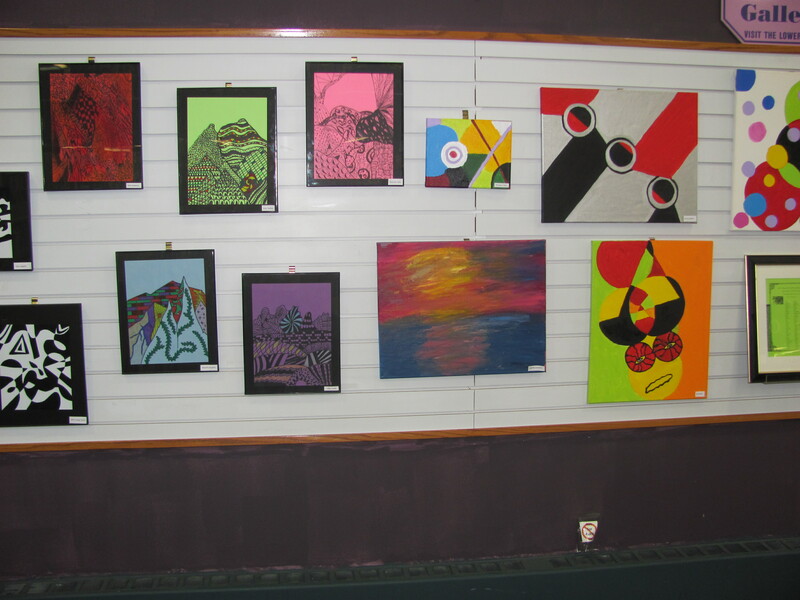 Ms. Fernandez’s works are available for purchase; please come visit The Gallery while her exhibit is on display. The Gallery is open the normal business hours of the library, Monday through Thursday 9:00 a.m. to 9:00 p.m. and Friday and Saturday 9:00 a.m. to 5:00 p.m.
Chinese ink is incorporated on the very fragile rice paper. Sandra also uses special Chinese brushes which are made from goat, wolf and horse hair. Many of Ms. Fries pieces of art will be available for purchase. In addition to being an accomplished artist, Sandra has many other interests that include volunteering with organizations special to her, enjoying her many hobbies and spending time her husband Joe and large family. 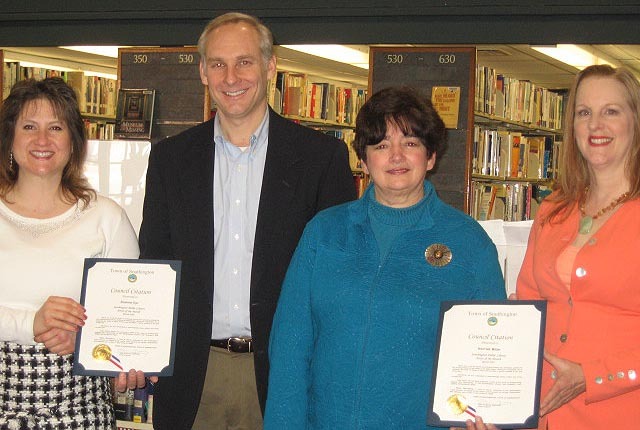 Rose Walsh, Libby Richardson, Rob Macfarlan, Deborah Ruzzi, President CCCC, Marjorie Muzyczka, received the Town Council Artist Citation from Albert Natelli, Southington Town Councilman. Other CCCC members who have their photographs on exhibit include, Wendy Manciagli, James Dionne, Jayde Tomczuk and Harold Sisken. 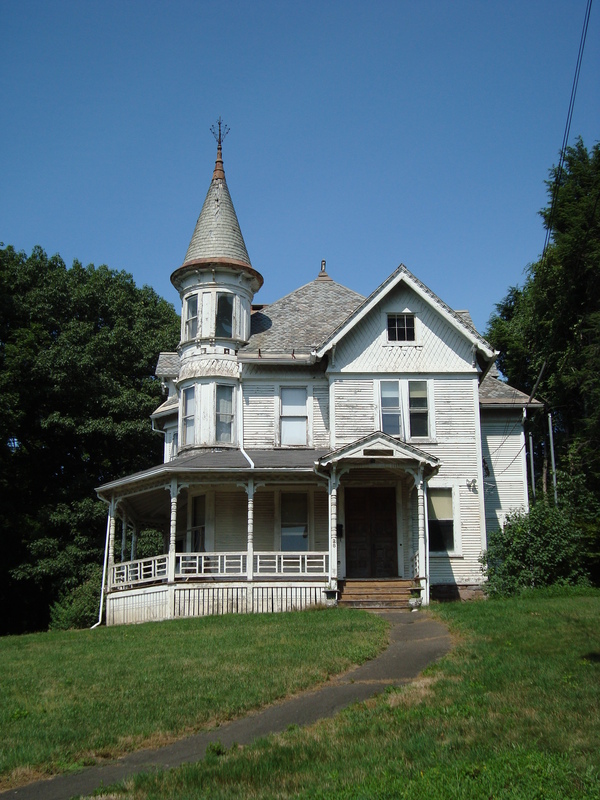 The CASTLE CRAIG CAMERA CLUB was founded in 1955 as a result of a course in photography which was sponsored by the YMCA of Meriden. Mr. & Mrs. Willis Cone were instrumental in obtaining the services of an instructor for the course and the enthusiasm of the students resulted in an active and ongoing camera club. 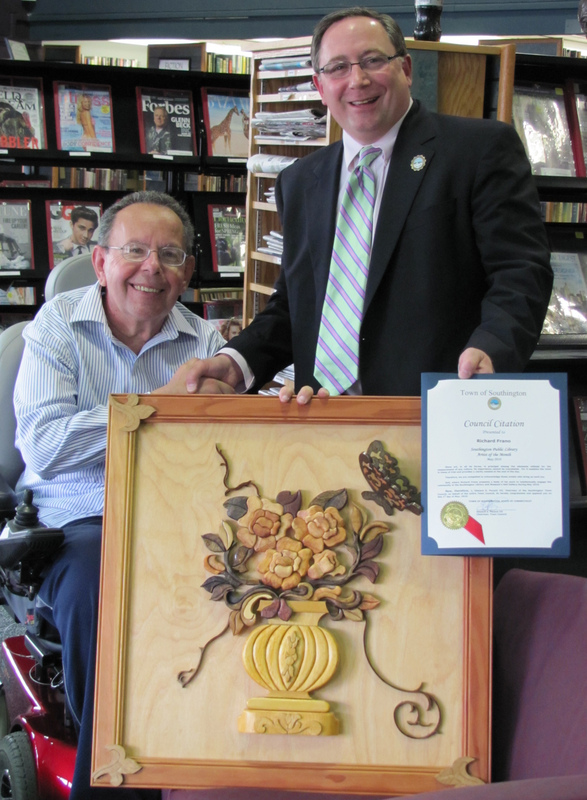 Southington Town Councilman Albert Natelli presented Godfrey Caleb with the Artist of the Month citation honoring Godfrey as the September Artist of the Month at the Southington Library. Indian born artist, Godfrey Caleb moved to the United States from Canada after retiring from Architecture. He now devotes his time to art. On a good day, armed with a flask of coffee, he can be found painting… painting with coffee! He remarks, “There is nothing like sipping and painting with it, mind you many a times the brush has been dipped in the wrong mug!” It all started when Godfrey accidentally spilled coffee on a card paper, hence he created his first coffee painting. Godfrey also paints with oil, watercolor and sketches with a ball-point pen. Only after his discovery of coffee and encouraged by his wife Linda, has he found fame! He now teaches in Connecticut and Florida. His website http://www.coffeepaintings.com has attracted clients locally and as far away as California. James Gaffney, native of Southington, an artist and a graduate this past May with a BS in Studio Art. 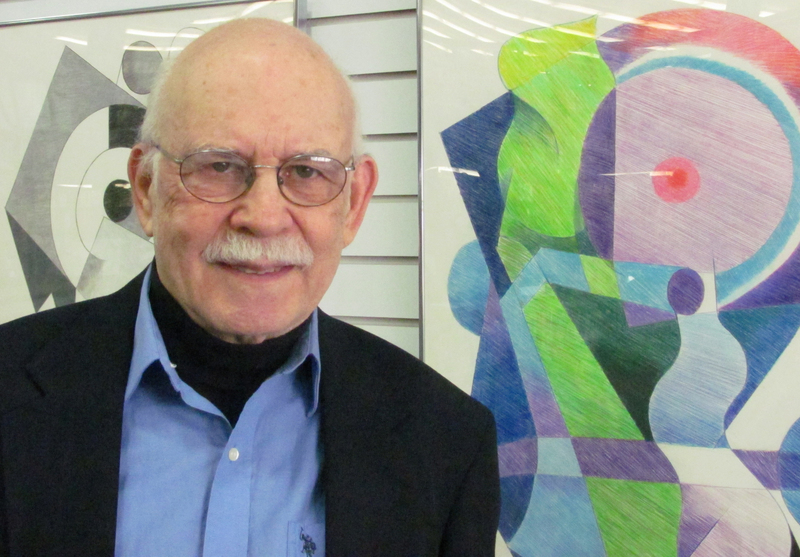 Mr. Gaffney works in oils and pastels has exhibited his art around the state most recently his work was at SCSU and will be in exhibits around the state. Mr. Gaffney’s work is a direct reflection of his personal quest to self-identity. James is blue-green colorblind and the colors produced are indicative of how he views the colors of the world around him. Using a variety of references from early childhood up to present day, James layers paints and pastels to create deeply personal works of art. 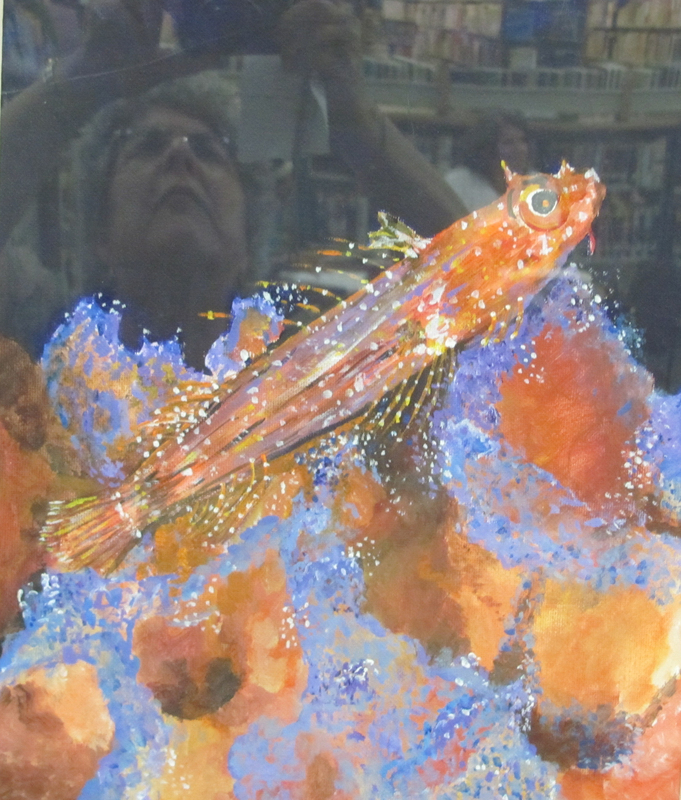 Mr. Gaffney’s work will be on exhibit through the month of August at The Gallery at the Library. His work is also viewable on facebook.com as well as other online forums. 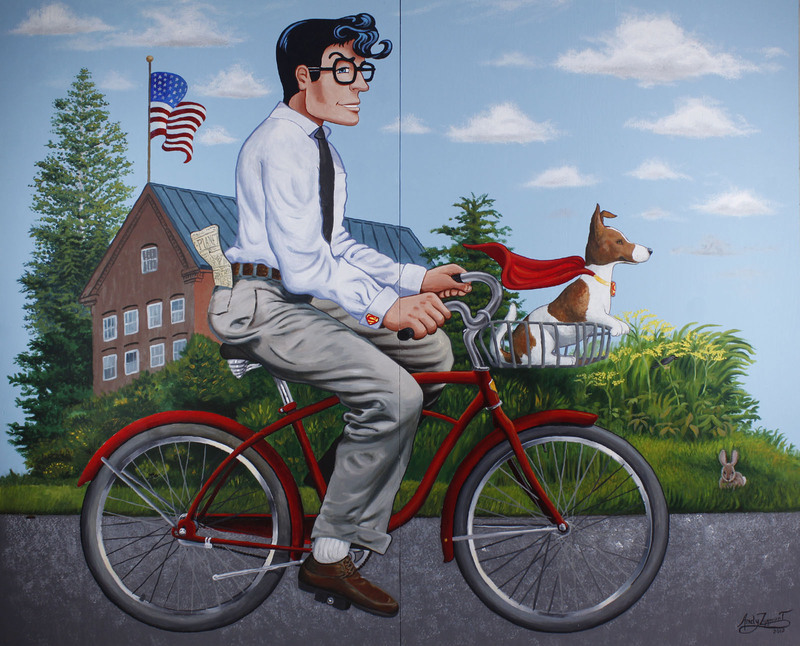 A reception date to meet Mr. Gaffney is August 18, 2010 at 7:00 p.m.
During the month of July Southington Library and Museum showcases Michael Albert Modern Pop American Artist. 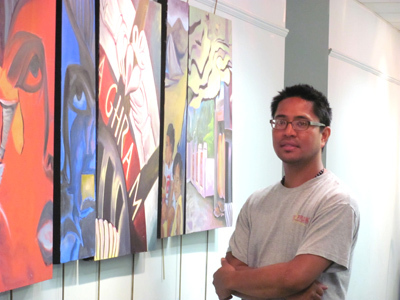 Albert presents his Modern Pop Art Show, ‘Sir Real’ ‘Cerealism’ and “Epic Works’ in the Gallery at the Library. Michael Albert has been making art since his college days at NYU, where he studied business (BPA, 1988). He became interested in art after visiting many of the great museums of New York and began his own serious artistic pursuits. Due to his reluctance to throw away a Frosted Flakes cereal box, Albert created his first ‘Modern Pop Artwork‘, a collage he titled, ‘Portrait of an American Classic’. This was in fact “The Birth of Cerealism. 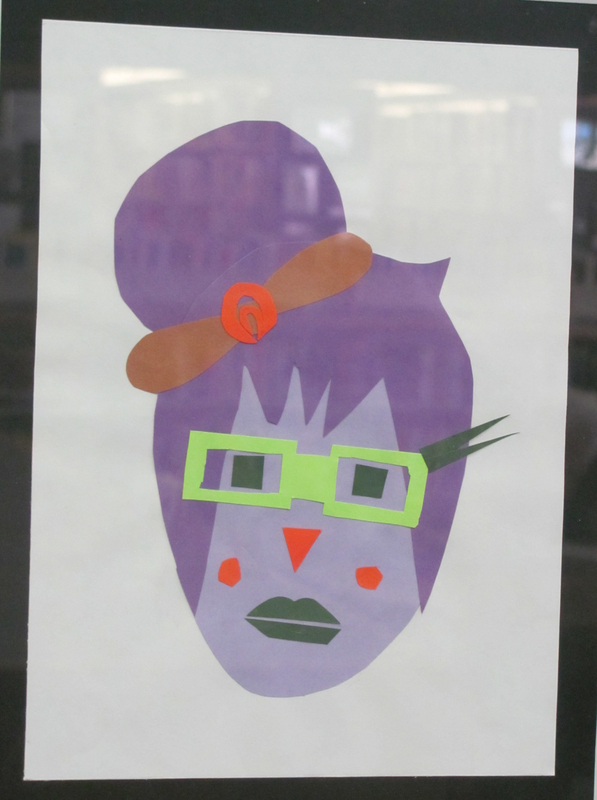 Albert created two free collage workshops at the library. Everyone in attendance created their own cereal box collage and received a free copy of one of Albert’s collages. 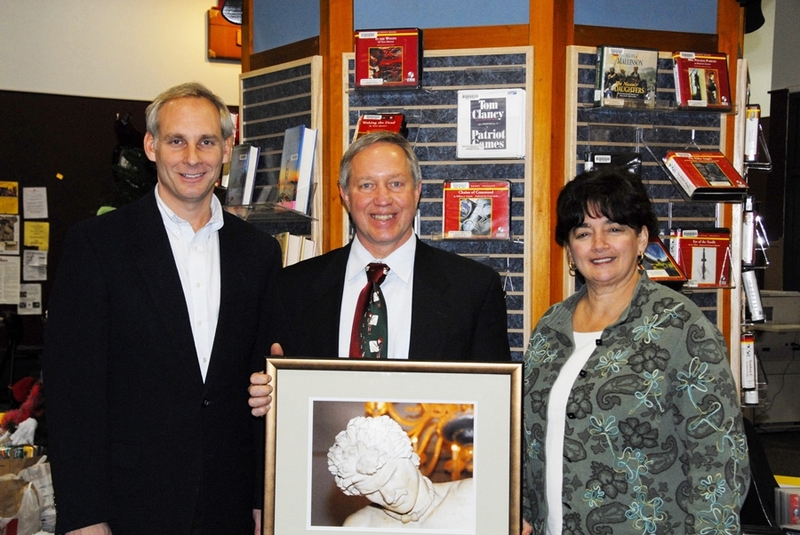 Michael presented the library with an original collage for Southington Library. 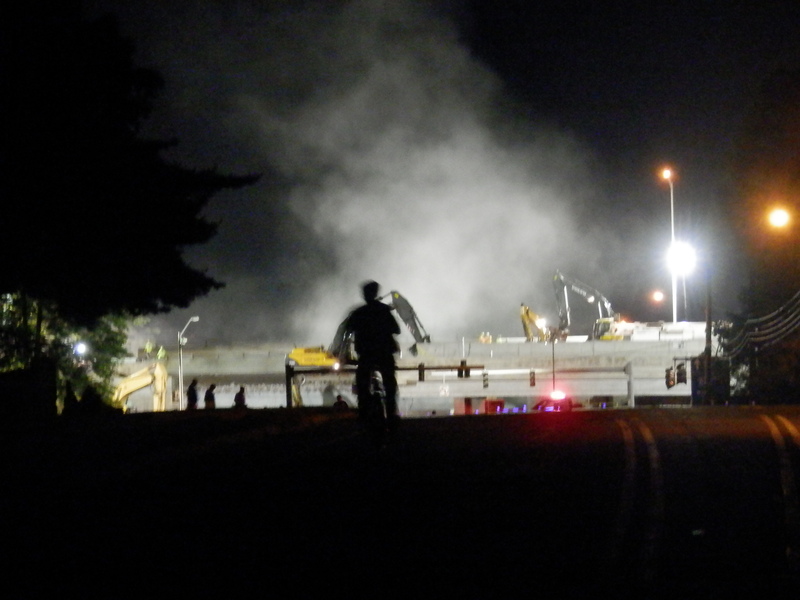 The Southington Arts and Crvts Association. 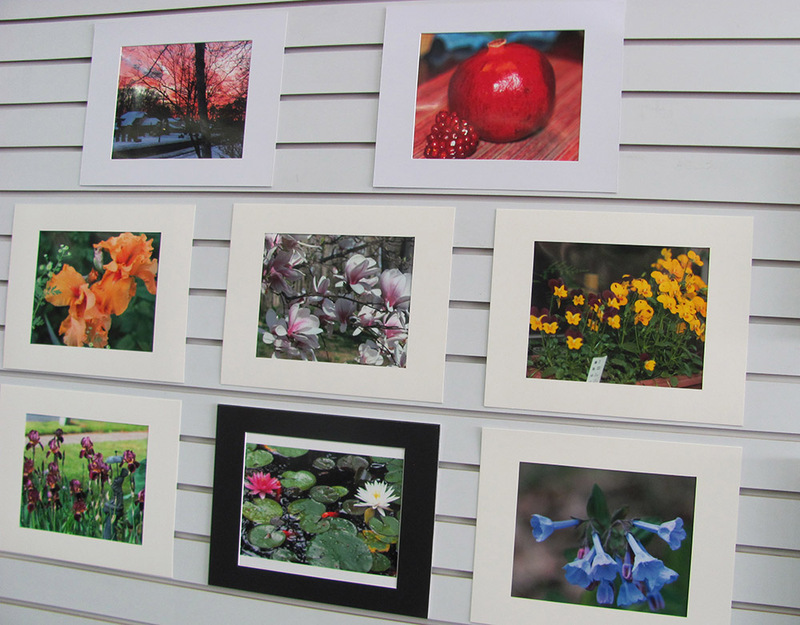 The Southington Arts Council invited the town middle schools to nominate students to take part in a photography grant. 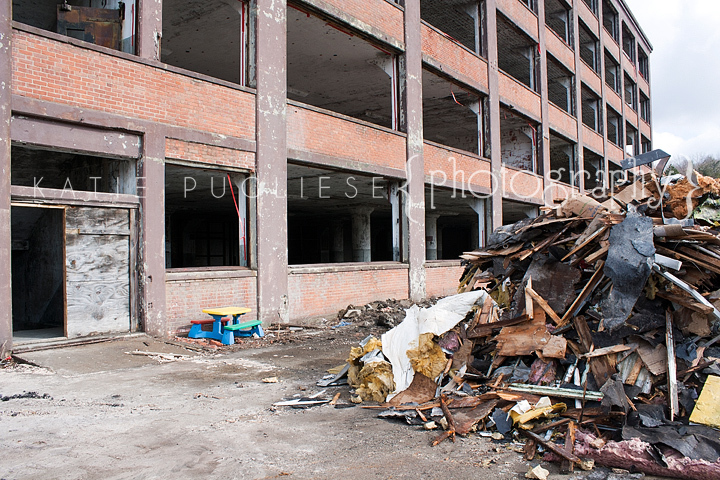 The students had the opportunity to learn about picture taking and how to tell a story with their photograph. 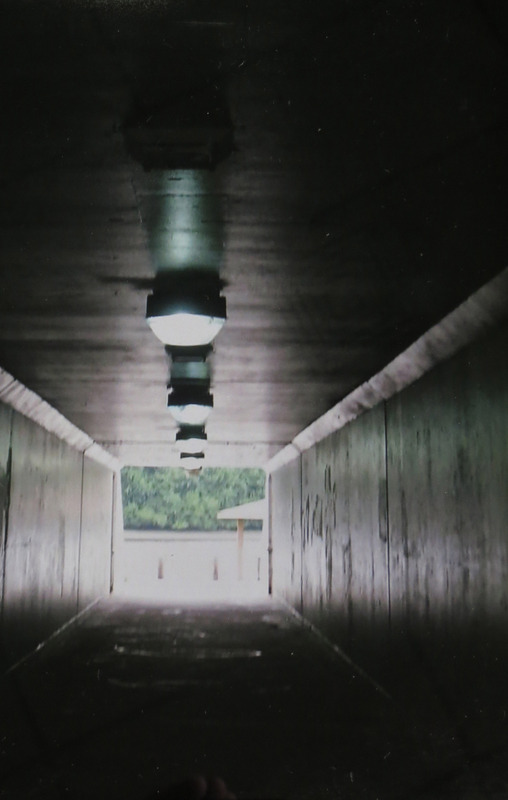 The project titled ‘What Matters to Me’ is a digital photography project and a continuation of a book published by The Southington Arts Council, Inc. in 2005 that contained essays and short stories written by Middle School students. The project was the idea of SAC member Karen Cirincione and made possible through a grant from The Greater New Britain Arts Alliance. 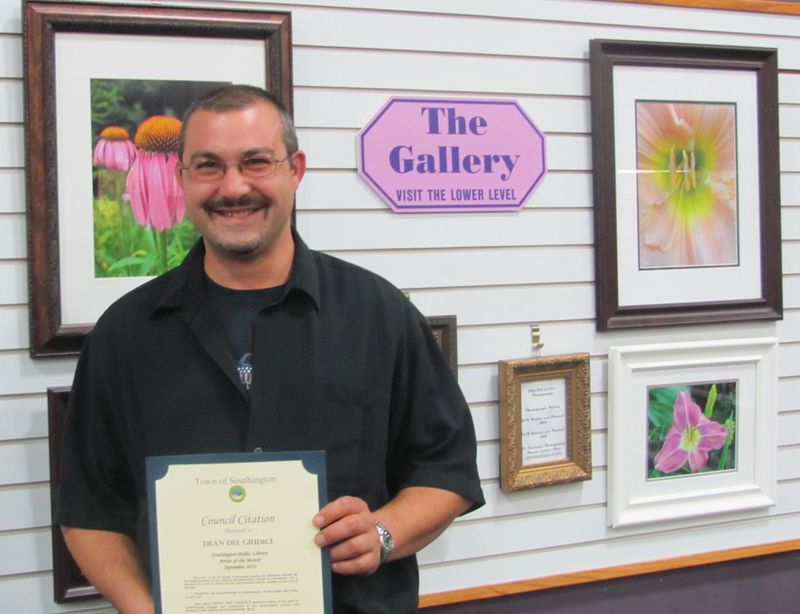 Meet the Artist Reception Saturday March 5th 1:00 p.m. – 3:00 p.m.
Mr. Masserman received the Town Council Artist Citation Saturday at the Southington Library. The Council Citation is presented to the artist or photographer in recognition for the joy their work brings to the community. Ben is a recent graduate of the College of Liberal Arts and Sciences at UConn, his interests lie in literature and the arts. Though mostly self-taught, Ben studied photography in both high school and college. Post-graduation, the photographer participated in ULive, a photographic documentary of university life. 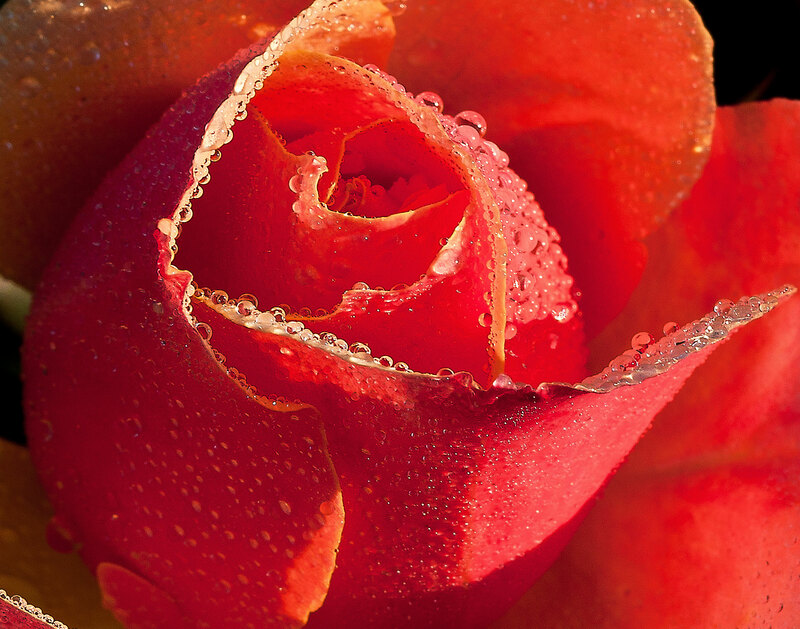 Over the years, photography has become his passion, combining technical skill with artistic vision. It is this passion, and his view of the world, that he wishes to share through his photography. Meet the Artist, Ben Masserman Saturday March 5th from 1-3 PM in the lower level reception room at the Southington Library. His photography of his experiences out west enjoying nature will be on exhibit in the Gallery at the Library on the lower level and main level. 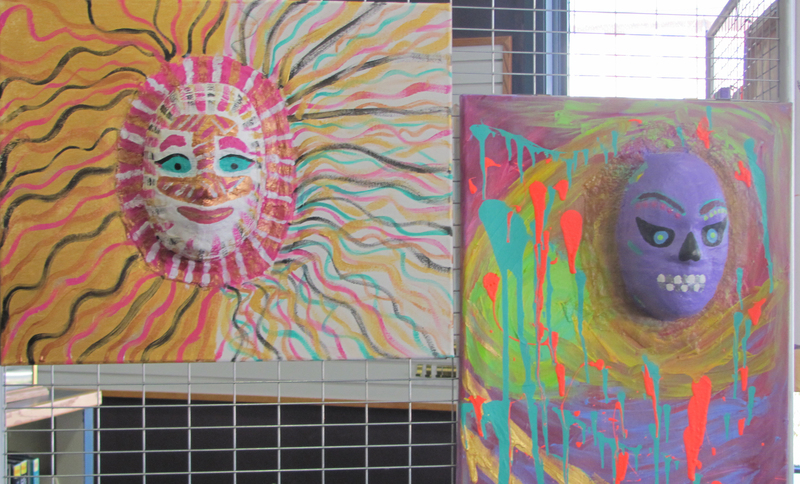 The month of May brings two different artists to The Gallery at the Library. 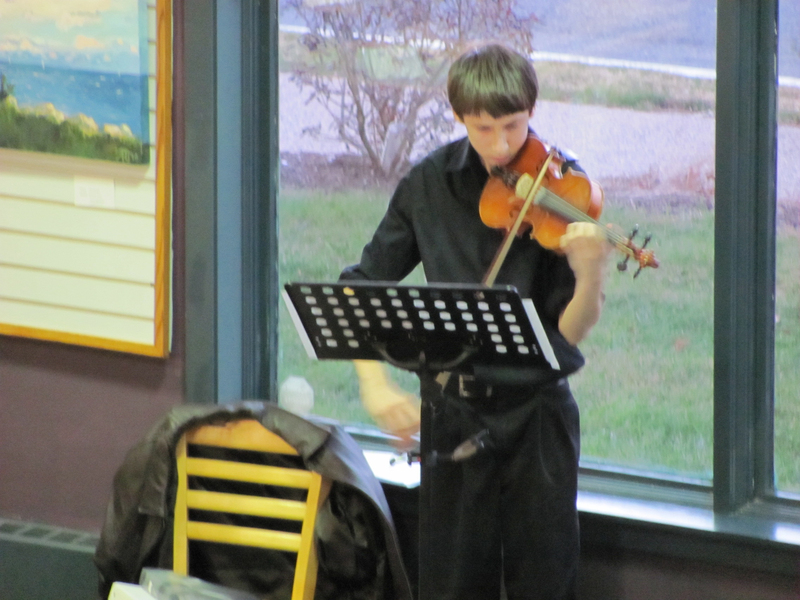 The Southington Town Council in cooperation with Southington Library honors the talented people from our community. 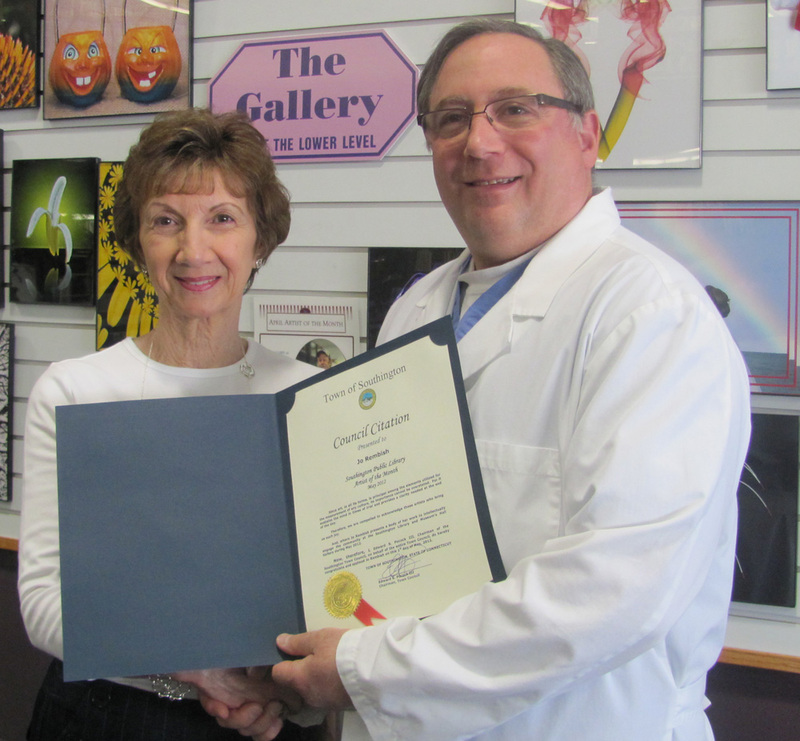 On April 21st, Town Councilor Albert Natelli presented, Renee Descoutures and Richard Frano with a Council Citation in recognition for their talent and thanked them for sharing their art with the community. The main level Gallery Wall exhibit will be of Mr. Frano’s unique wall hanging pictures carved from wood. 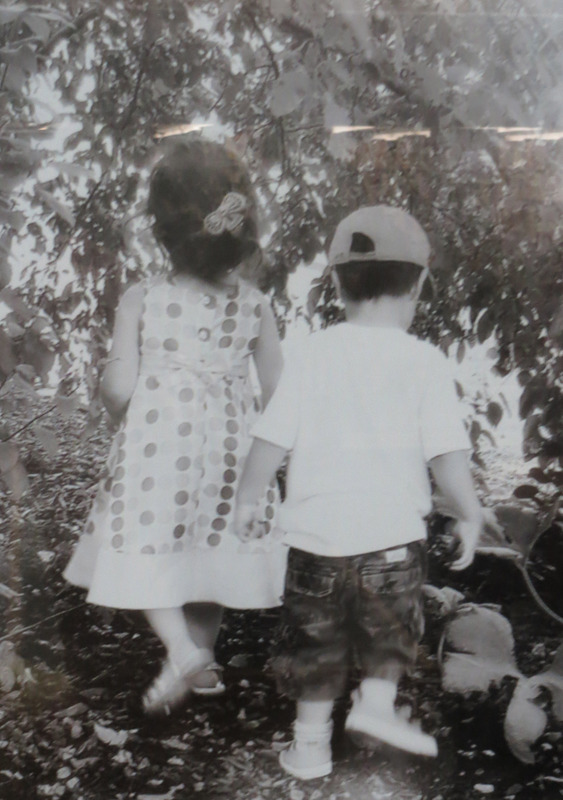 The lower level Gallery Hall exhibit will be portrait photographs created by Ms. Descoutures. 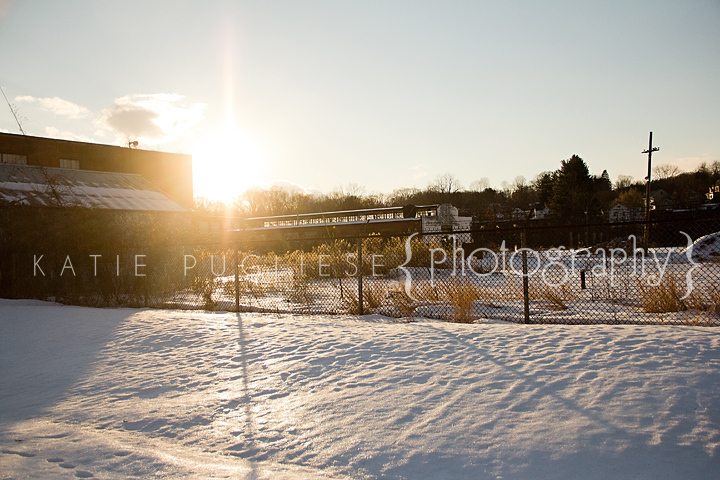 Renee Descoutures Visual Artist/Photographer resides in Southington with her young family. Art, in its many mediums, has been a longtime interest and hobby for Renee. She has studied art at the university and community level including a year abroad in France. However, it wasn’t until after the birth of her first child that she decided to make a career based on her artistic talent. This is a very exciting time for her and she is thrilled to see what the future holds. 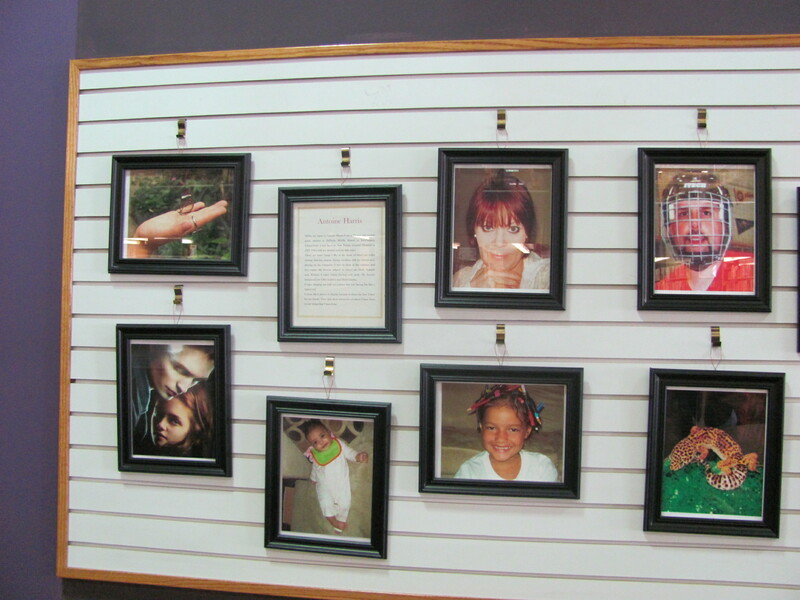 Renee’s exhibit includes custom portraits of individuals and families. 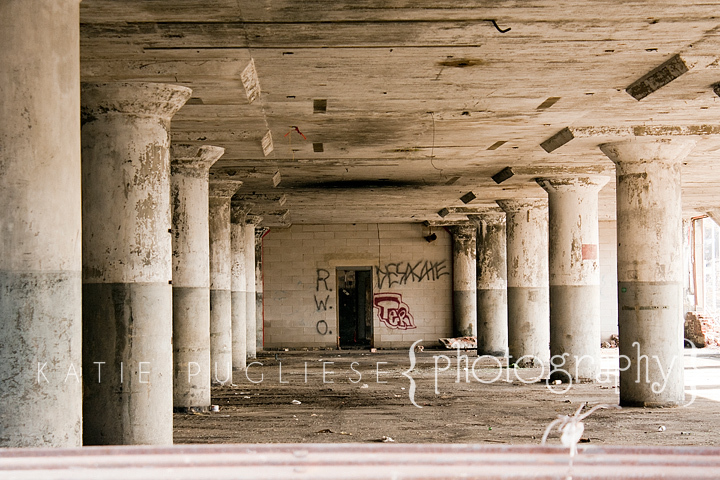 Please visit www.reneedphotography.com for more information and to see more of her work. Southington resident Richard Frano a handicapped veteran confined to a wheelchair enjoys woodworking a hobby undertaken to assist with this therapy. Using different types of woods and stains he has created unique three dimensional wall hanging ‘pictures’ of different subjects. Richard’s work includes both formal presentations and whimsical. 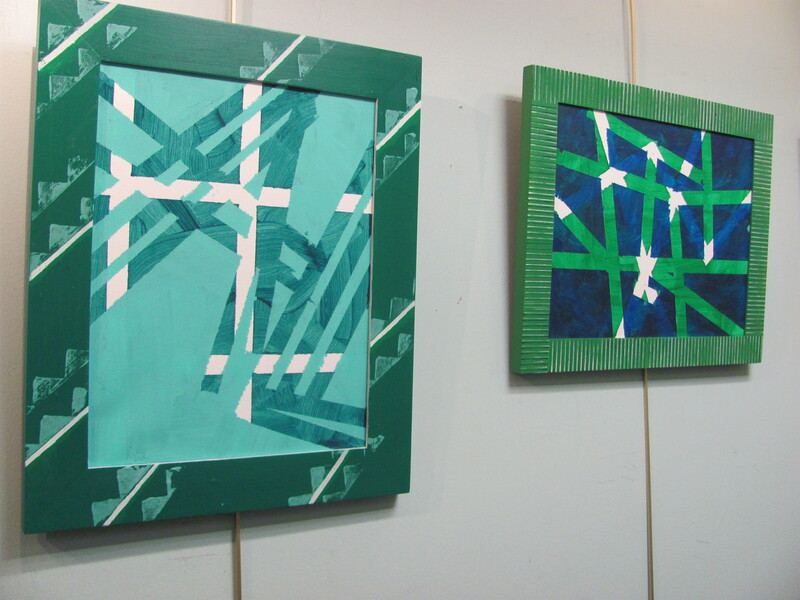 His canvas is wood and his tools include saws and chisels creating fretworkan interlaced decorative design. The relief carvings presented represents low relief on a solid background, or cut out with a fretsaw. 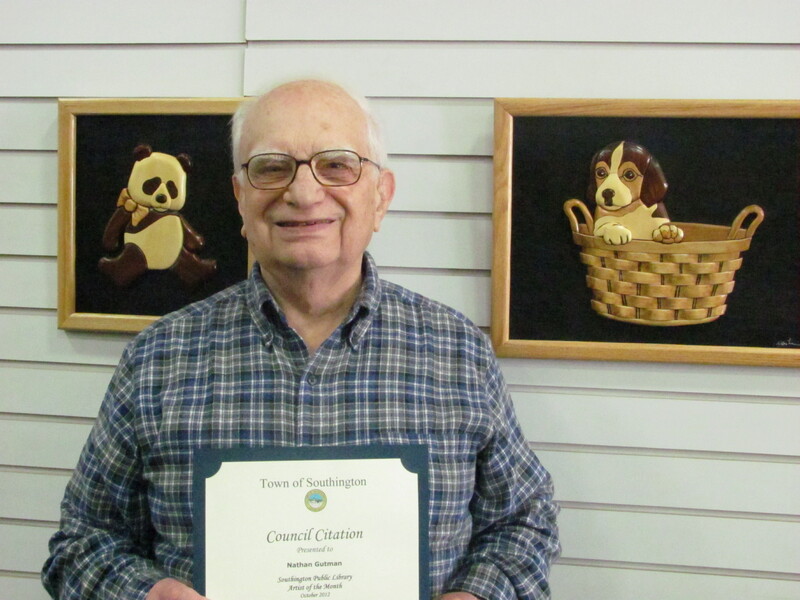 Mr. Zygmunt recently was honored with the Southington Town Council Artist of the Month citation for his artwork, Town Councilor John Dobbins presented the citation at the library. 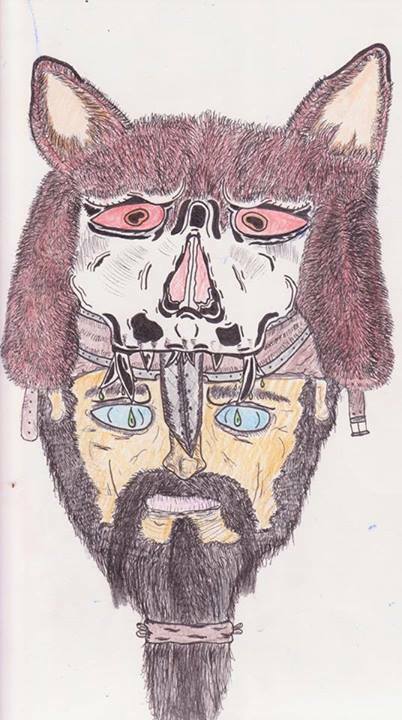 Mr. Zygmunt enjoys creating faces, and characters, preferably in fantasy and science fiction settings. 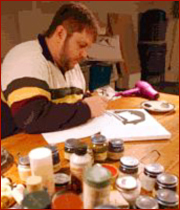 He has exhibited at the Lunacon, and Philcon Science Fiction Conventions and has been the recipient of the Lunacon Directors Choice and Best Amateur Artist awards. 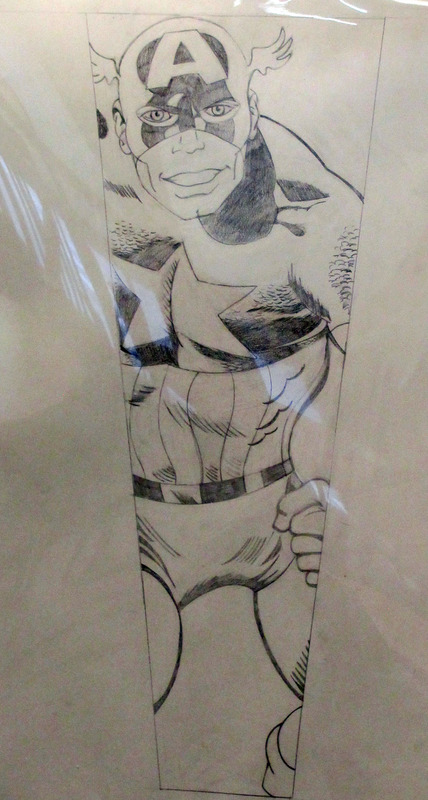 Andy also does commissioned artwork. 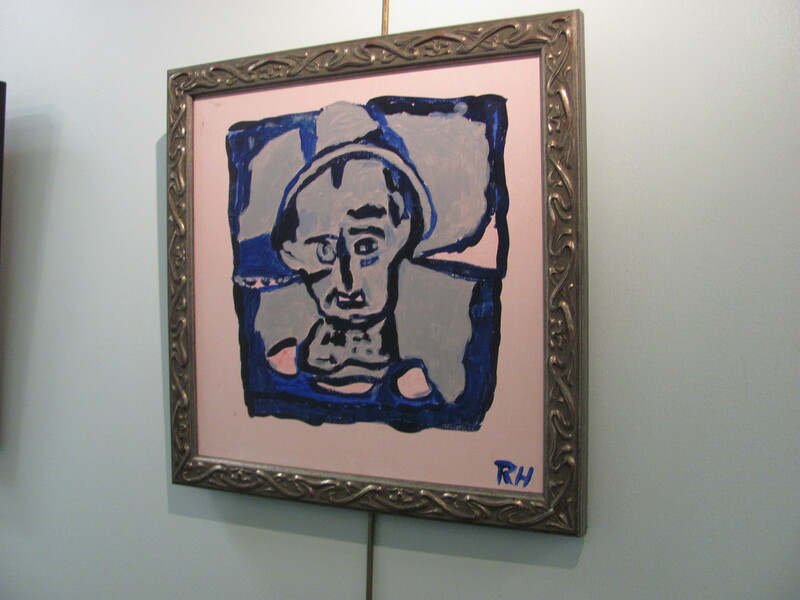 Mr. Zygmunt’s work will be on exhibit for the month of April in The Gallery at the Library. 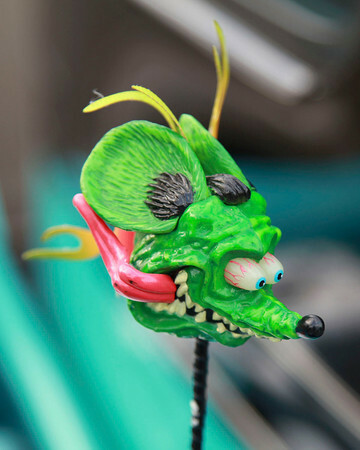 Visit Andy’s web site at http://www.petshark.com for samples of his work. Ms. Kopcha grew up in Southington, Connecticut. She is inspired by the many people, animals, and places around her. As a child, she collected toads around her yard; Katie would keep them for a day, play with them, and let them go at night. Animals hold a dear place in her heart. Ms. Kopcha graduated from University of Connecticut with a BFA in Illustration. She is currently attending graduate school for a Masters in Art Therapy. Katie has spent a semester abroad in Florence, Italy and experienced fresco painting while seeing many historical Renaissance paintings. (And of course eating their wonderful Italian cuisines) “Leaping Through the Year”, a book Katie wrote about a frog going through every month of the year. 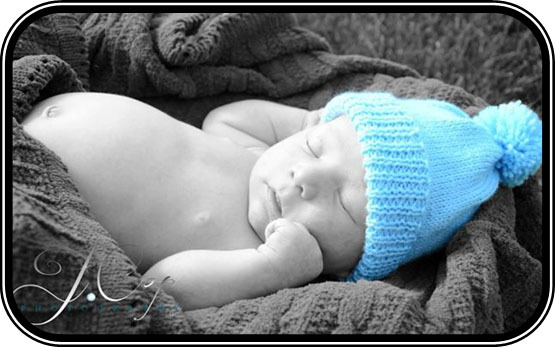 January 9, 2010 2:00 p.m. to 4:00 p.m. 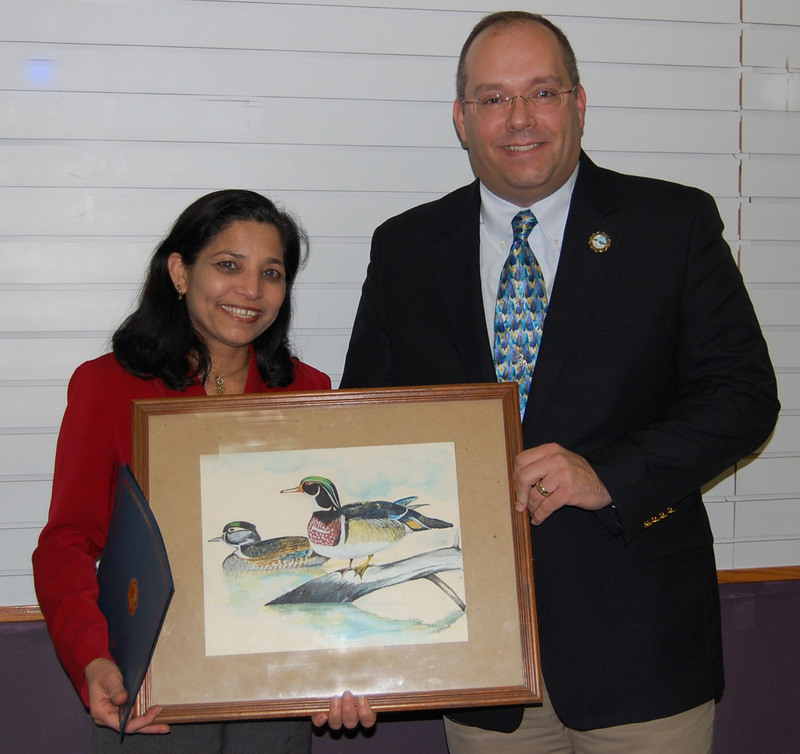 The January Artist of the Month, Kalyani Baxi is pictured receiving the Southington Town Council Artist Citation from Town Council Chairman Edward S. Pocock III. Kalyani has been a resident of Southington for nine years. At a very young age she showed interest in drawings and paintings which led to a career in architecture. She is a registered architect with the state as well as has LEED certification, and is currently employed by the U.S. Navy. She enjoys drawing, sketching, and painting as one of her hobbies. 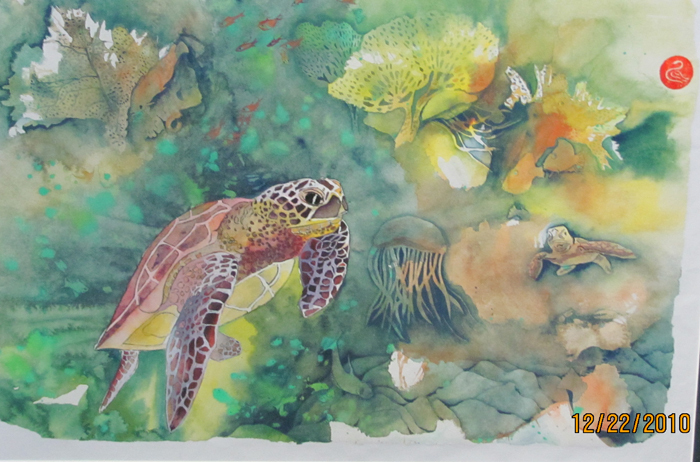 Her love for ‘nature’ and ‘wild life’ inspires her to draw upon her love to create water color and acrylic paintings which depict nature as she sees it. Her love for nature and the environment has led to her developing a new interest in environmental preservation and energy conservation. She has recently been appointed to the Clean Energy Committee for the town of Southington. She also likes figure drawings to capture ‘human’ emotions. Besides drawing and painting, other hobbies Kalyani enjoys are gardening, music, and sewing. Recently she developed a new love for community service and has been a volunteer at Southington Care Center. 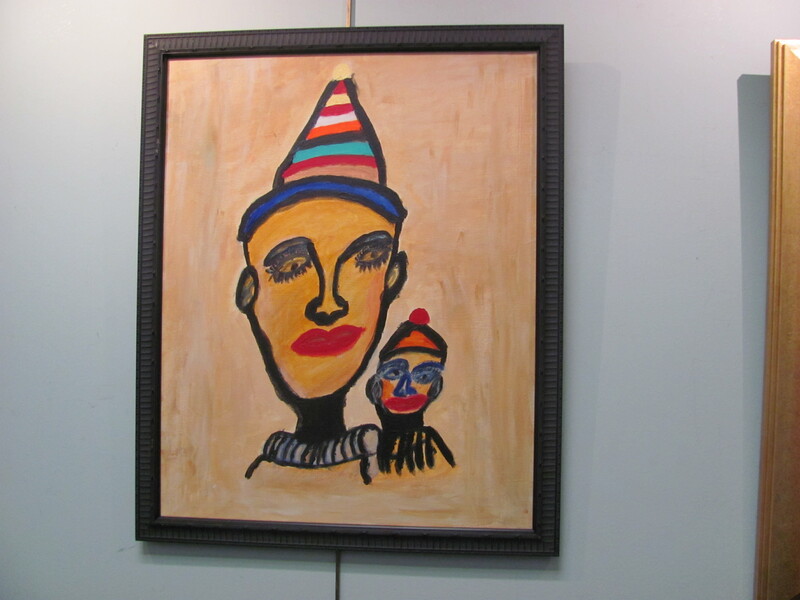 Her drawings and paintings have been on display at Waterbury and Cheshire Public Libraries, and at the Oktoberfest in Waterbury. 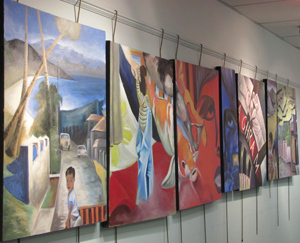 Ms. Baxi invites the community to an open free reception, January 9, 2010 2:00 p.m. to 4:00 p.m. in the Lower Level Program Room of the Southington Library to enjoy free refreshments and meet other art enthusiasts. 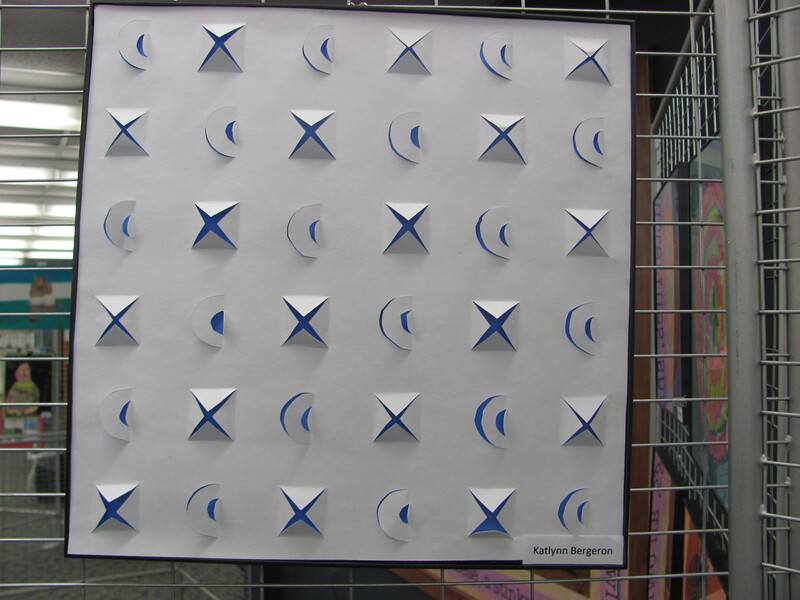 Kalyani’s artwork will be on display for the month of January. Artist of the Month December 2009 Marjorie Low . 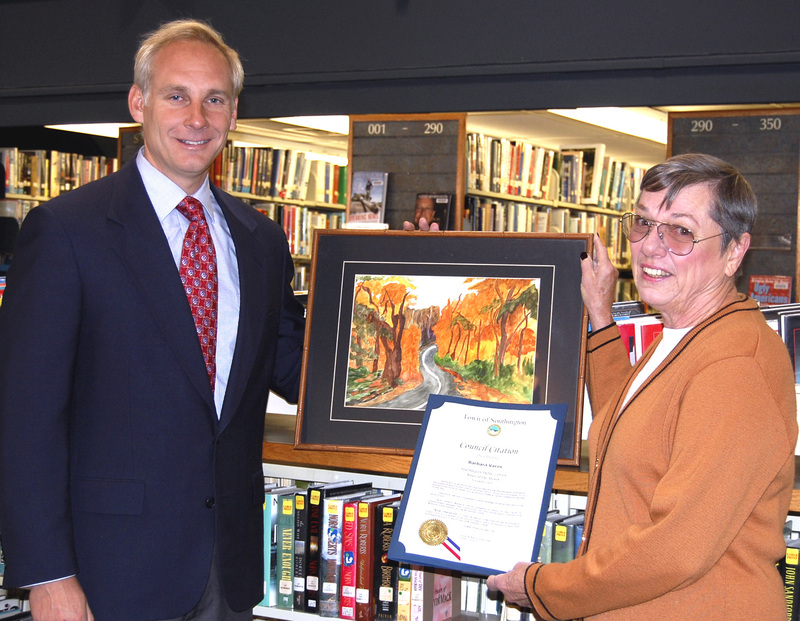 Town Council Chairman Edward S. Pocock, III presents Marjorie Low with the December Artist of the Month Citation for her work of art that will engage the community at the Southington Library and Museum’s Gallery. Saturday 9:00 am to 5:00 pm. The library is closed Saturday during July and August. 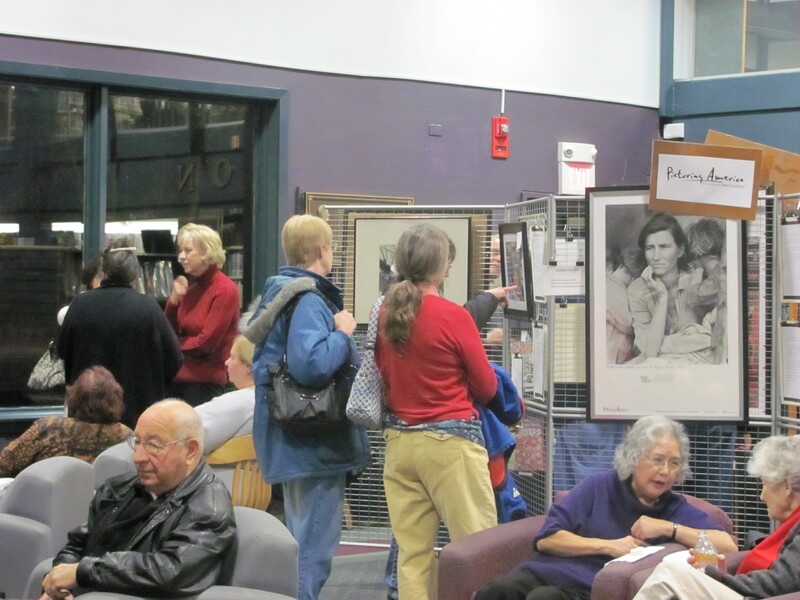 The Southington Library’s second annual “Celebrate ART” reception was overflowing November 16 with artists, town officials and supportive residents to recognize local artists. 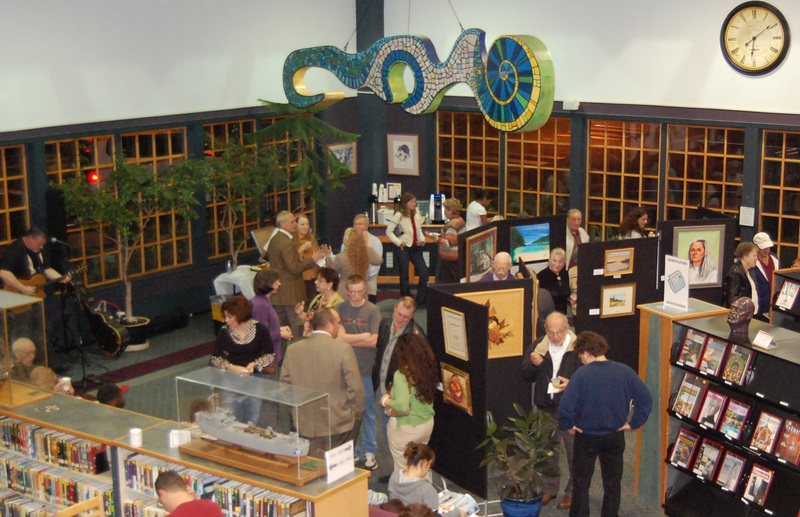 This year’s reception brought together the 2009 “Artists of the Month” who exhibited in The Gallery at the Library, “Harvest the Arts” muralists and numerous other local artists. 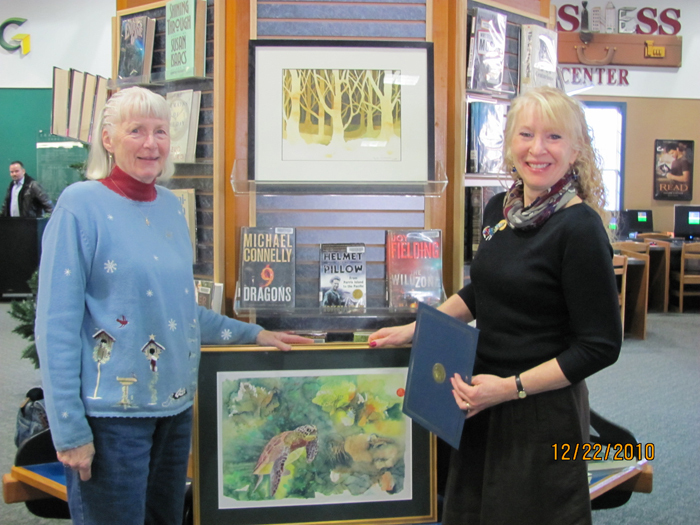 The Southington Library in cooperation with the Town Council monthly recognizes local artists who are “Artist of Month” in The Gallery at the Library with a Town Council Citation. The evening of the reception Town Council Chairman, Edward Pocock along with former Chairman, John Barry, councilmen Christopher Palmieriand Albert Natelli, Jr. recognized the many artists who have enriched and inspired us with their talent. 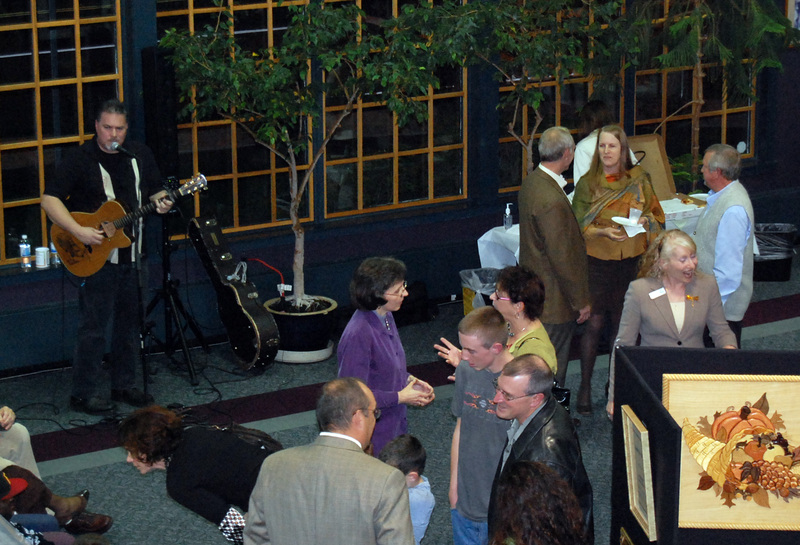 Also attending were members of the Southington Arts Council and Southington Arts and Crafts, co-sponsors of the event. 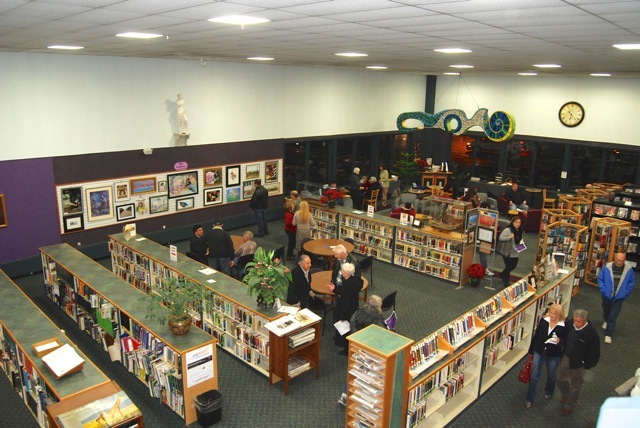 The Gallery at the Library was created to provide a venue for local residents to share their artistic talents and to foster a better understanding and appreciation of visual art. 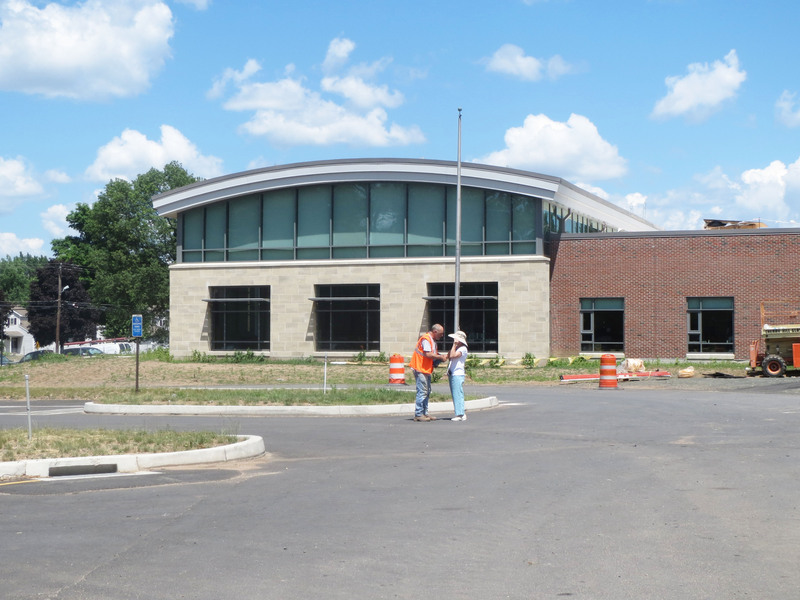 The Library is Southington’s community center and premier resource for information, life-long learning and cultural enrichment, and is committed to providing numerous opportunities for residents to experience the full range of artistic expression. 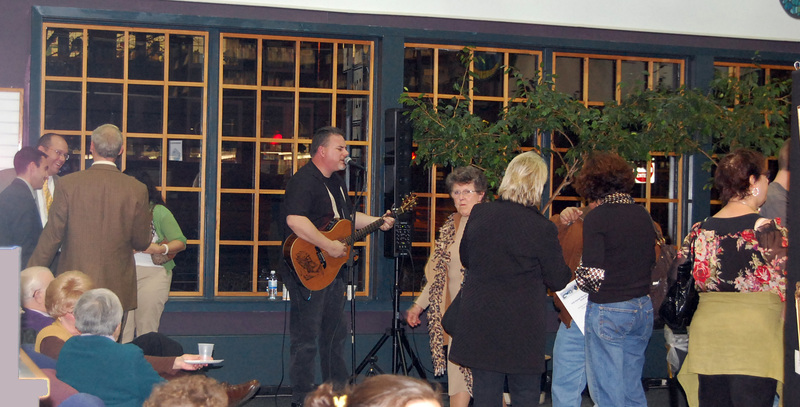 We offer free programs to Southington residents including concerts, dance programs and art classes. Our new slogan: “Create! Explore! 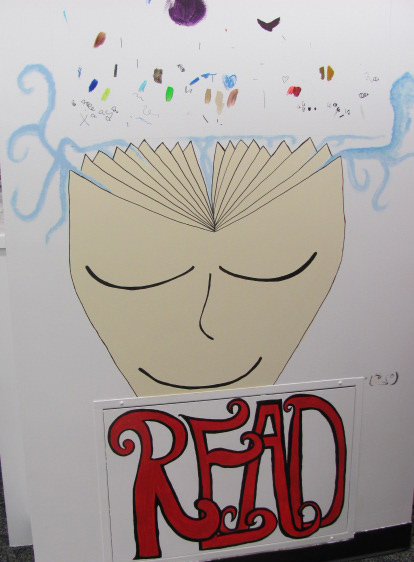 Engage!” reflects the philosophy that the Library is where art, music and ideas come together under one roof. 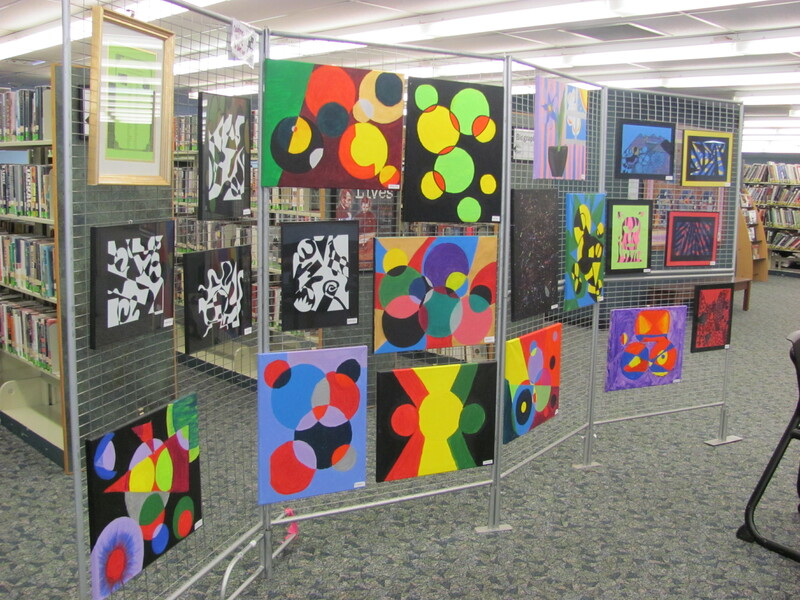 Visit the Gallery at the Library on the main and lower levels during normal library hours, Monday through Thursday 9:00 a.m. to 9:00 p.m. and Friday and Saturday 9:00 a.m. to 5:00 p.m. for more information please contact the Adult Program Coordinator at 860-628-0947 x113. Mr. Driscoll a Southington resident now in his eighties attended the Whitney School of Art in New Haven in 1948 -1949 but could not complete his schooling due to a family tragedy. 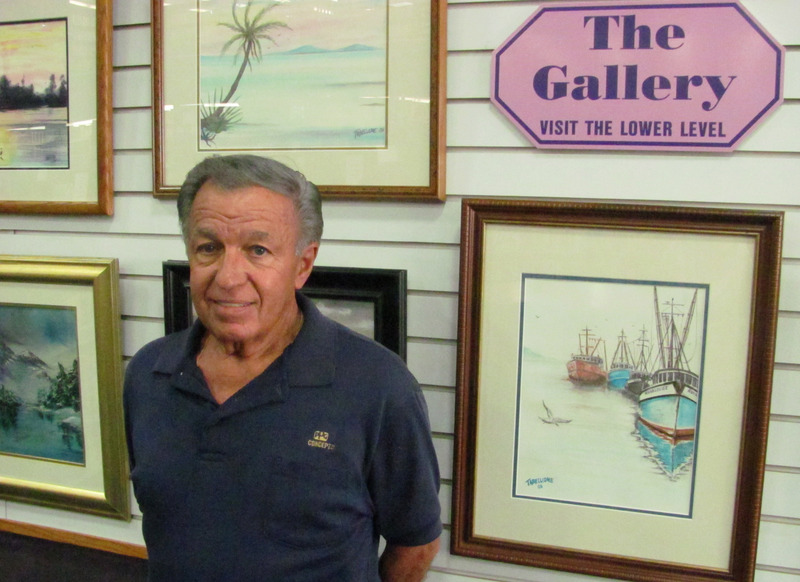 Fifty years later he started painting again, using the bright, vivid colors of from his second home, Florida. 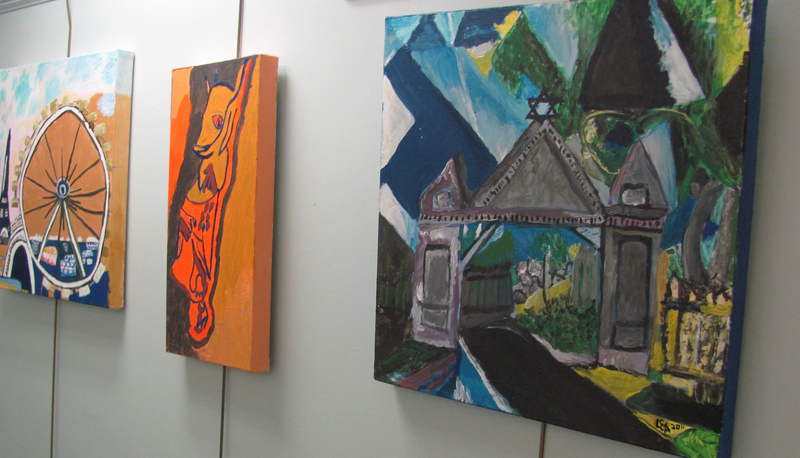 Mr. Driscoll has shown his work in Sebring Florida and the Hospital of Special Care in New Britain. 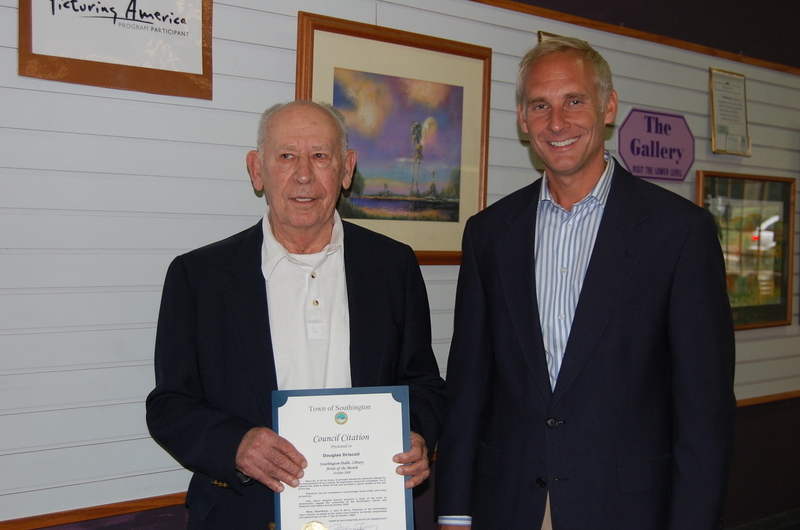 As Artist of Month at the Gallery in the Library, Town Council Chairman John Barry presented Mr. Driscoll recently with the Town Council Citation which acknowledges the joy and appreciation art, in all its forms, brings to society. 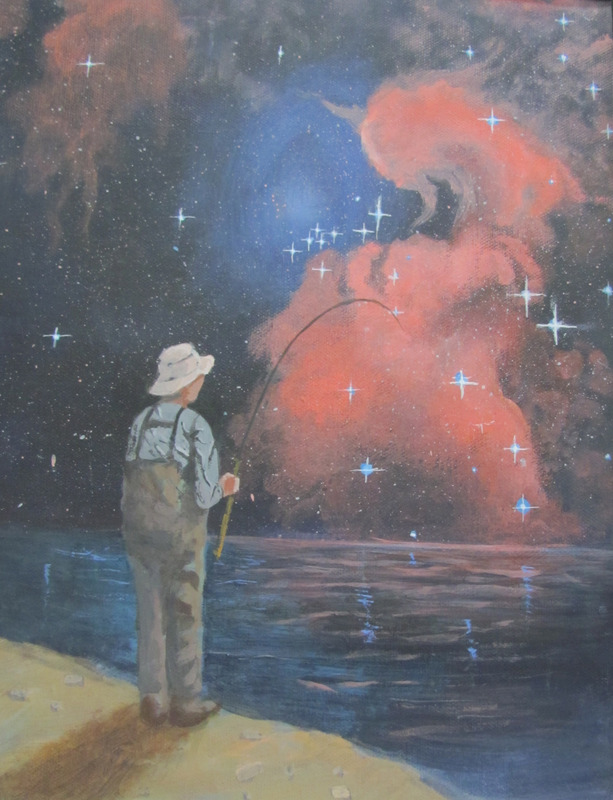 Mr. Driscoll has been told by several art critics his work resembles that of the “Florida Highwaymen”. The Highwaymen were the beginning of Florida’s contemporary art tradition. Their individual styles depict Florida’s natural beauty. In the early 1950’s through the 1980’s a group of twenty-six African-American artists known as the “Florida Highwaymen” used vivid and bright colors to display the beautiful untouched Florida landscape. The Florida Highwaymen painted wind-bent palm trees, serene sunsets, churning oceans and bright red Poinciana trees. They painted from their garages and back yards on inexpensive Upson board and then on the weekends they would travel and sell their Highwaymen paintings to hotels, offices, businesses and individuals who appreciated the artwork for around $25 a piece. Visit http://www.floridahighwaymenpaintings.com/ for more information. 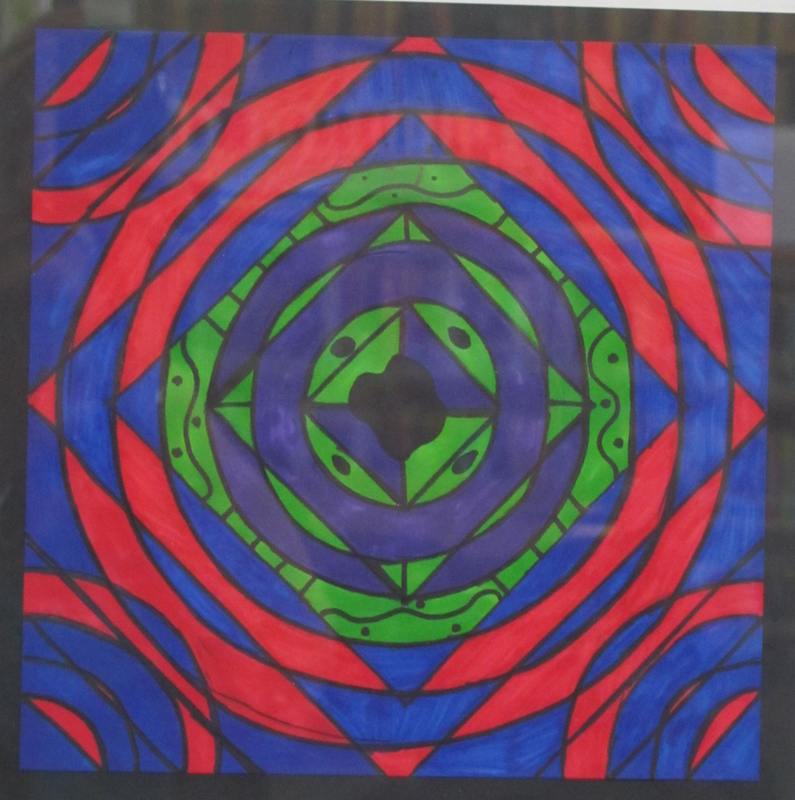 Ms. Varos will have several art pieces on display on the main level Gallery Wall, with her remaining pieces on display in the Gallery Hall on the lower level of the library. 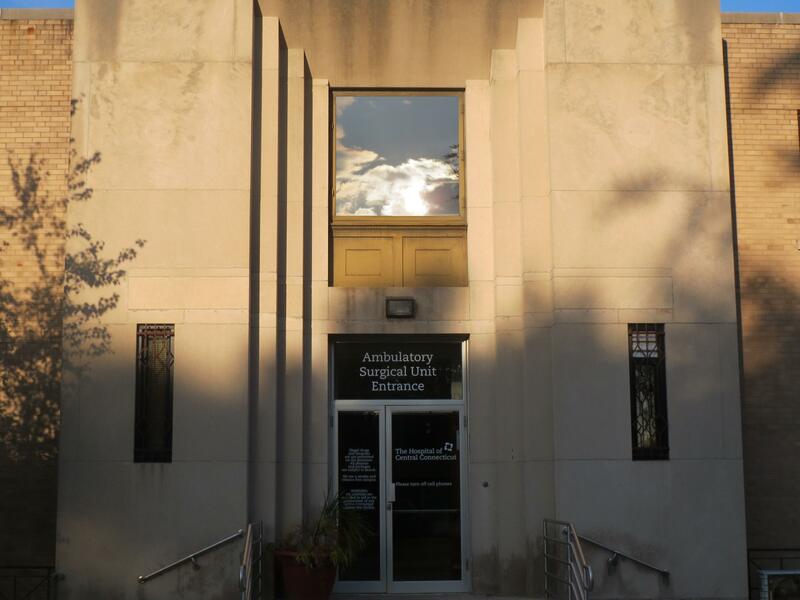 The Gallery is open to the public during normal library business hours, Monday through Thursday 9:00 am to 9:00 pm and Friday and Saturday 9:00 am to 5:00 pm. The library will closed September 5 for the Labor Day holiday. 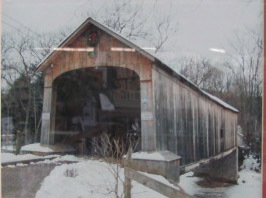 Barbara was introduced to artistic pastels, and watercolors at the “Arts Alive Studio” in Cheshire. Barbara has been busy since her last exhibit creating new pieces for this exhibit. 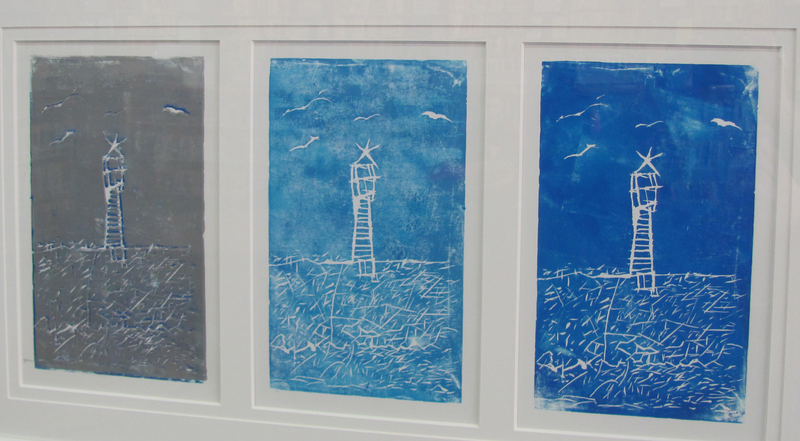 Barbara has shown her works through the Cheshire Art League in many locations around the area. In addition, her participation in the Mount Carmel Art Show in Hamden resulted in a much appreciated award for one of her pastel paintings. 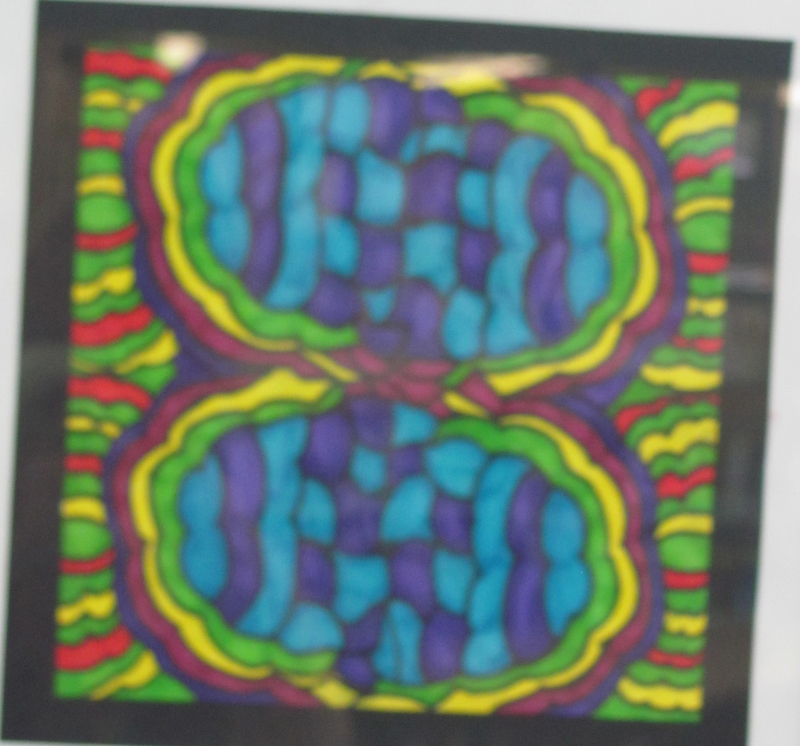 Ms.Varos continued her art lessons and exhibiting her work while living in Florida. Upon returning to the area a few years ago, Barbara proceeded to expand her work into acrylics. She is a member of the Southington Arts and Crafts Association, and attends classes at the Arts Place School in Cheshire. Many of the artist’s works will be available for purchase. Stop in and enjoy. 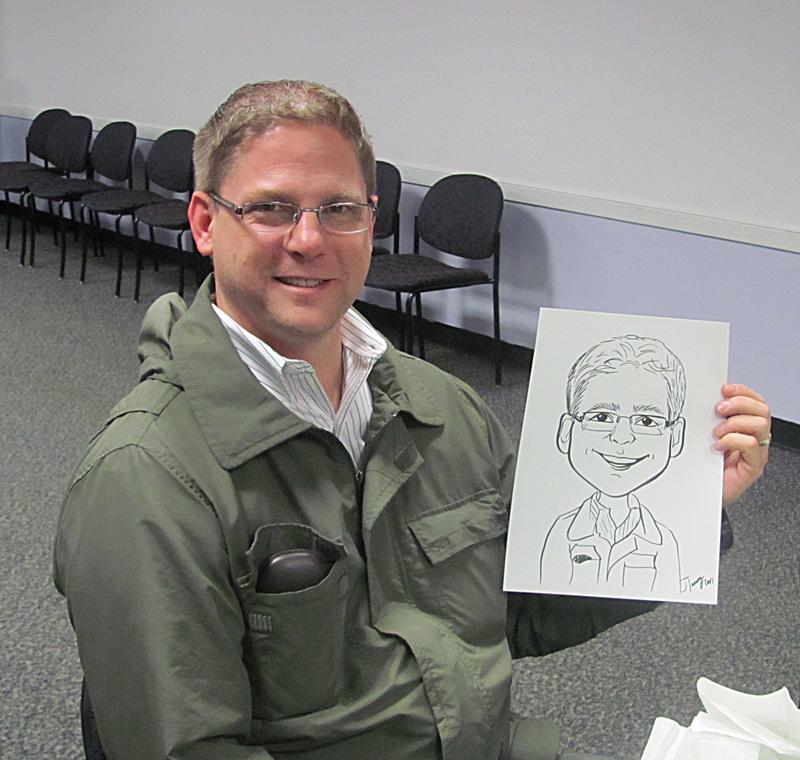 Mr. Aguayo is a self-taught artist. 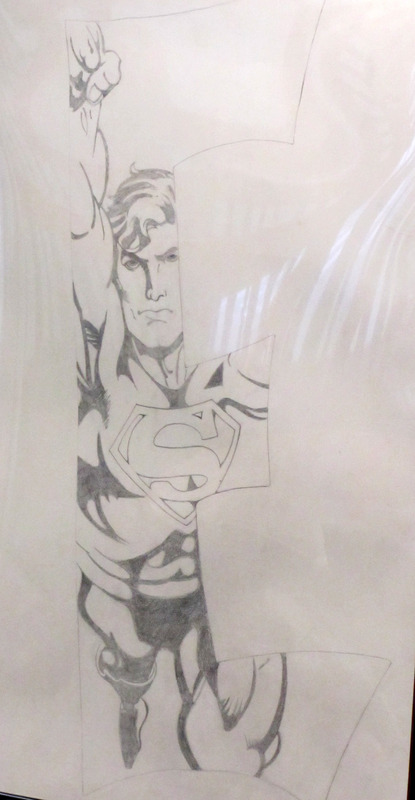 Born in Caguas Puerto Rico, J.C. began drawing at an early age beginning with anything from cartoons to fictional characters. It was during his service time with the United States Army that J.C. rediscovered art. Aguayo remembers thinking; he was homesick being far away from home and began transferring his memories of his beloved island into paintings. 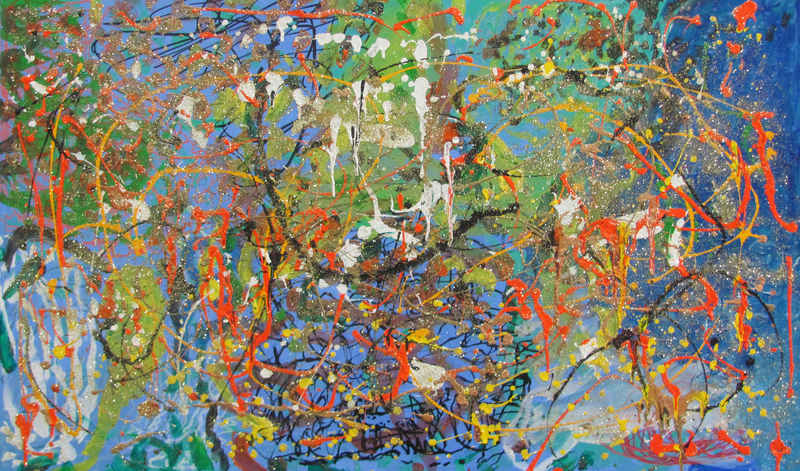 J.C. works with a variety of mediums bringing his colorful memories to life on canvas. Mr. Aquayo works in Hartford as a Social Worker and lives with his family in Southington. Meet Mr. Aguayo at a reception August 6, 2009 in the Program Room at the Library, 6:00 p.m. to 8:00 p.m.
Barbara Varos was introduced to artistic pastels, and watercolors at the “Arts Alive Studio” in Cheshire. Her instructors there taught the students with infinite patience and imagination utilizing their vast artistic knowledge. Barbara’s progression in the art field allowed her to show her works through the Cheshire Art League in many locations around the area. In addition, her participation in the Mount Carmel Art Show in Hamden resulted in a much appreciated award for one of her pastel paintings. Moving to Florida for a number of years Ms. Varos continued her art lessons and exhibiting her work. Upon returning to the area a few years ago, Barbara proceeded to expand her work into acrylics. She is a member of the Southington Arts and Crafts Association, and attends classes at the Arts Place School in Cheshire providing Barbara with ongoing relationships with other students working in various mediums. Saturday, May 16 from 1:00 p.m. – 3:00 p.m. 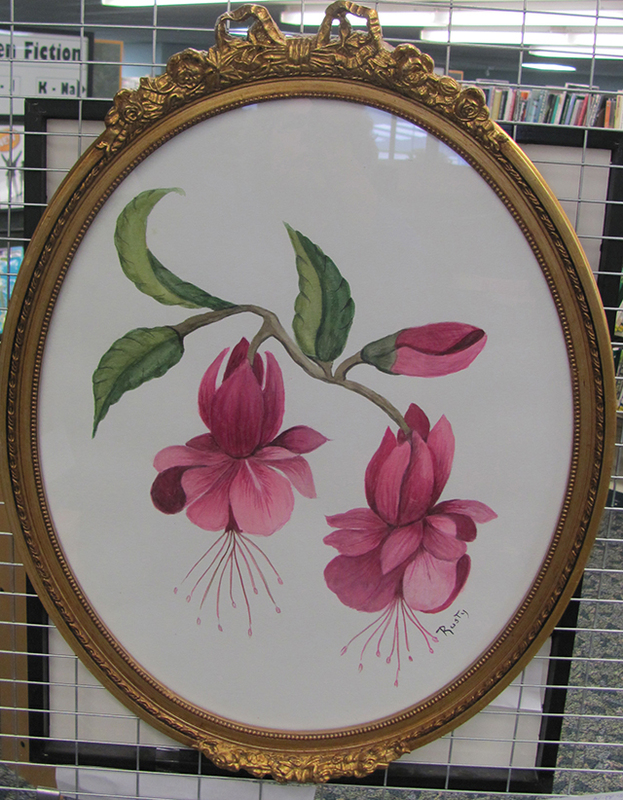 Enjoy Ms. Scott’s artwork during the month of May in the The Gallery at the Library. Barbara will welcome guests at a Meet the Artist Reception, Saturday, May 16 from 1:00 p.m. – 3:00 p.m.
in the Library Program Room. Ms. Scott’s experiences traveling abroad give her the inspirations to create most of her paintings. Barbara enjoys painting with oils, trying to capture the things she enjoys observing, such as; a colorful landscape, peaceful waters, loving pets and family. 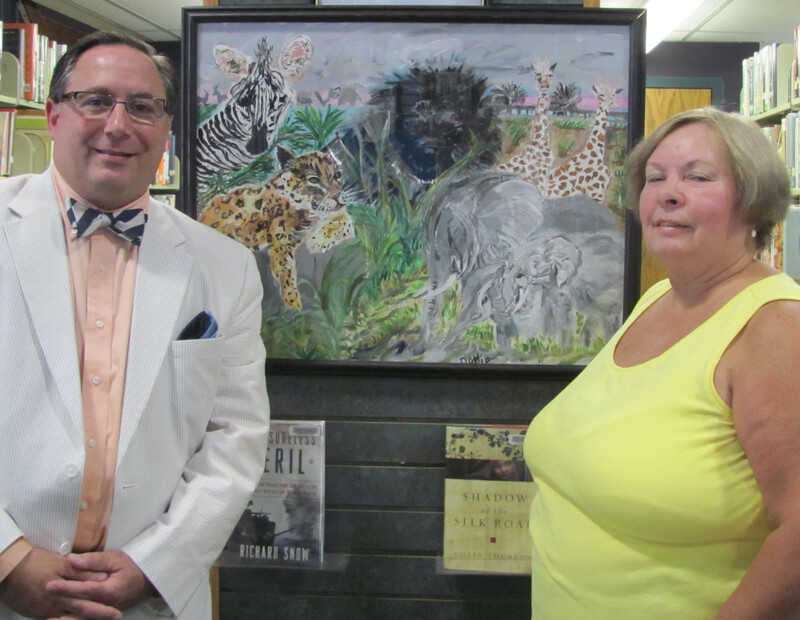 Friends Thomas Kearney and James Stagon present their latest artwork at the Southington Library. This is their first joint exhibit both have presented solo exhibits in the past. Mr. Kearney has studied with Bruce Raven of the Meriden Arts and Crafts Association and has been in numerous group and individual shows. He has received several juried awards and has taught art in Meriden. Mr. Kearney received his degree in Architectural Drafting from Porter and Chester Institute and studied philosophy at Trinity College, Dublin, Ireland. Mr. Stagon has enjoyed painting over the last twelve years as a hobby and has been taking basic painting for the past six years. James describes his art as fundamental realism with some creativeness. The exhibit is on display at two locations within the library, the Main Level Reference Gallery and the Lower Level Gallery and may be viewed the entire month of March during the normal business hours of the library. 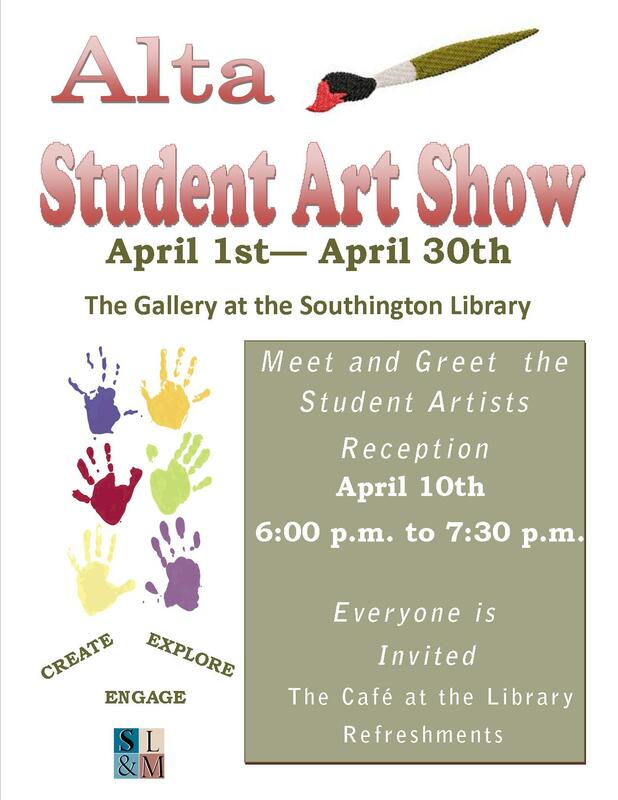 The public is invited to view the cartoons, collages, photographs, paintings and ink drawings by the many talented Southington artists of all ages and to enjoy light refreshments at the Meet the Artists Reception, March 26 at 6:00 p.m.- 7:30 p.m. Please register at the Reference Desk 860-628-0947 x5 to attend the reception. Contact Jeanne Chmielewski, Library Publicist, 860-628-0947 x113 for more information. Nicolette Theriault has a diverse background in art, she has studied at the Art Institute of Boston in Massachusettes , and with AIFS in Florence, Italy and received her bachelor’s degree in public relations and fine art from Quinnipiac University in 2006. Currently, she is the program director for Hartford Hillel at the University of Hartford, and also does freelance photography. This past year she added a wedding to her resume and has completed multiple ‘documentary style’ portrait sessions. 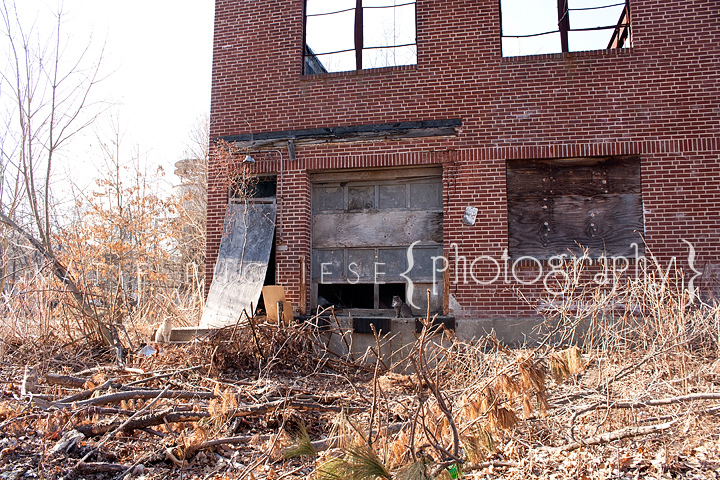 Please contact her for more information about her work at 203-907-7530 or at nicolettephoto6@gmail.com. 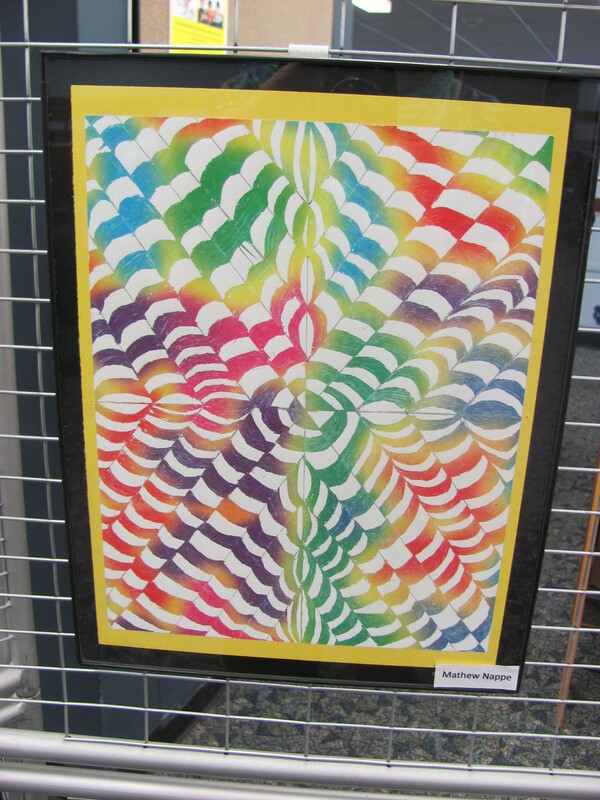 Ms. DeFeo believes from an early age, she has always had an interest in art and design. She feels producing and creating art work is therapeutic, natural and relaxing. To create something so unique and original is very extraordinary. Jinee is Southington resident and local graduate. Saturday December 13, 2008 1:00 p.m. to 3:00 p.m. The Southington Arts and Crafts Association members are accomplished artists; many have received individual recognition for their art at prestigious shows and exhibits in the area. As members of SACA they are committed to maintaining the SACA organization by offering quality fine art and craft programs to persons of all ages. Gail Bannock – Watercolors have been the media of choice for Gail Bannock ever since she first tried them many years ago. She has painted thousands of paintings, participated in many juried art shows, solo and group art exhibits, art fairs and has been selected for numerous awards. Gail is active on the board of directors at Southington Arts and Crafts Association and is also a member of several area art associations. She has been teaching watercolor painting for over fifteen years through both Southington Arts and Crafts Association and the Southington Adult Education program. 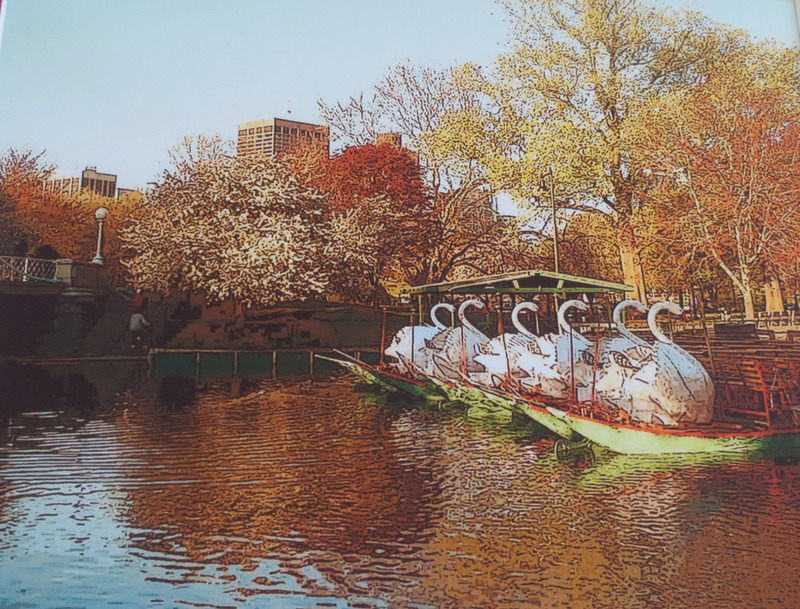 Johanne Beerbaum – Active in exhibiting her work throughout CT, Johanna has received multiple awards for first place and best in show from Cheshire, Bethlehem and Berlin fairs and several juried art shows. 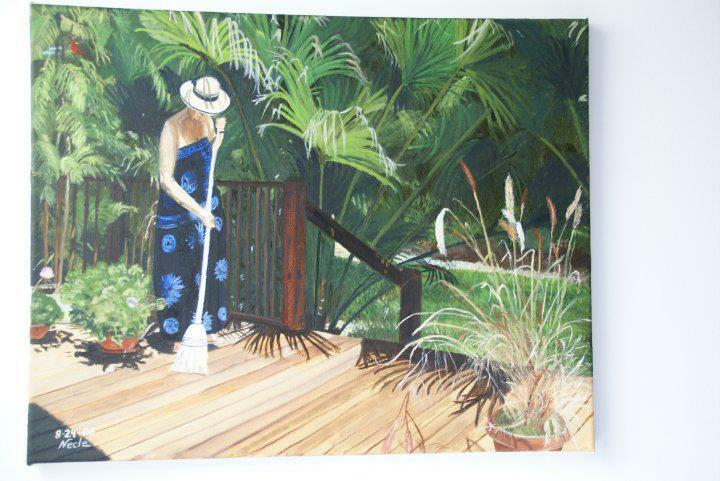 Linda DeLuca – A decorative artist of furniture, wall murals and a painter of realistic images. Linda is active on the board of directors at Southington Arts and Crafts Association and is also a member of several area art associations. She has taught her painting technique at Southington Arts and Crafts Association classes. Toni Height – Is an active volunteer within the community. Toni has expanded her painting techniques through classes at the Calendar House. Domenica Johns – A self taught artist who works in several medium. 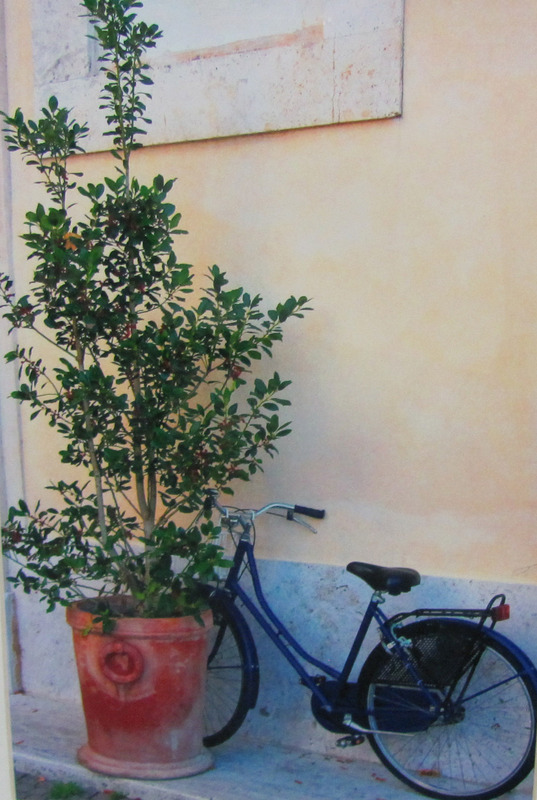 Domenica started painting 20 years ago, inspired by her travel experiences and personal photos. Recently her work was displayed with the Nutmeg Artists of Terryville and she is currently member of the Farmington Valley Art School. 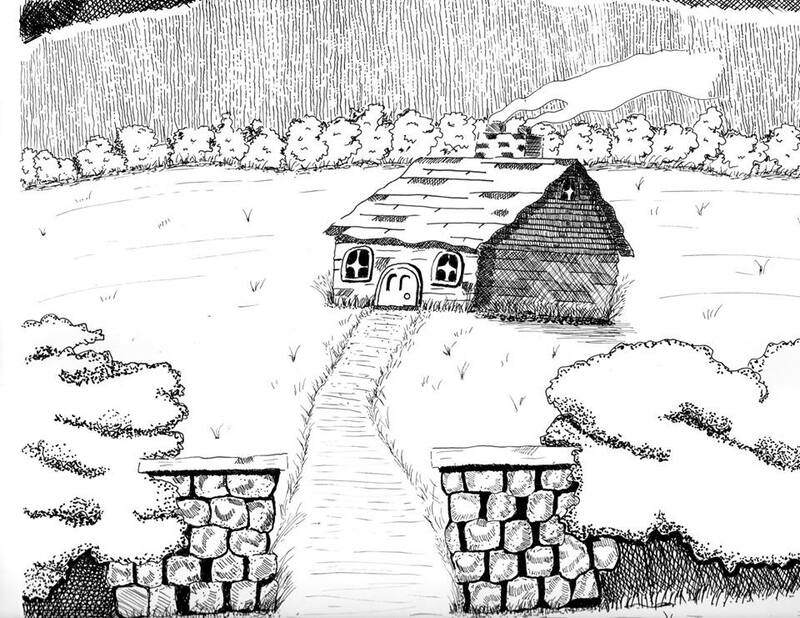 She uses her creativity to write short stories for children’s magazines. Thomas Mayer – Tom is a plein-aire painter and an active member of the board of directors at Southington Arts and Crafts Association and is also a member of several area art associations. He has taught many classes at Southington Arts and Crafts Association and currently teaches part-time in Meriden, Cheshire and Wallingford after retiring from his public school art teacher position. Cathy Michanczyk – Cathy is a member of the New Britain Museum of American Art. She has participated in many SACA art exhibits and was a featured as Artist of the Month at Southington Library, Southington Care Center and the Farmington Art Guild. Cathy enjoys creating her still life and landscape works in acrylic and oils. Rae Robinson – Rae has formal education and training from the former Art School of Fashion and Design, Hartford, Fine Arts at Central Connecticut State, Paier Art School and privately with Sr. Mary Magdeline of New Britain. 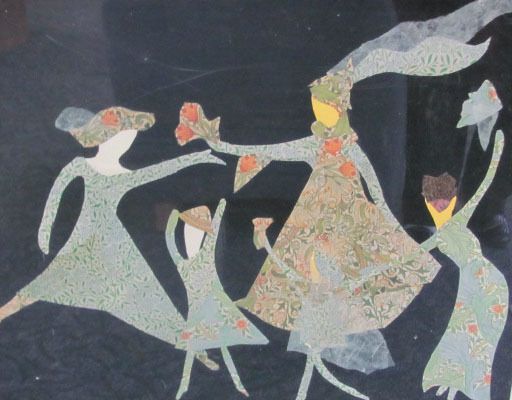 Barbara Scott – Most of Barbara’s paintings were created from her travels here and abroad. Barbara enjoys painting in oils, trying to capture a mood, the beauty of a colorful landscape or the peaceful effects of water. She enjoys working in pastels when doing pets or flowers. Paul Tourtilotte – Mr. Tourtillotte started painting when he retired to Florida with his wife. While there he attended classes at Duke University’s Institute for Learning in Retirement and joined the painting group the Paletteers. Paul is an active member of the New Britain Museum of American Art and his works have been accepted in their annual juried art shows. 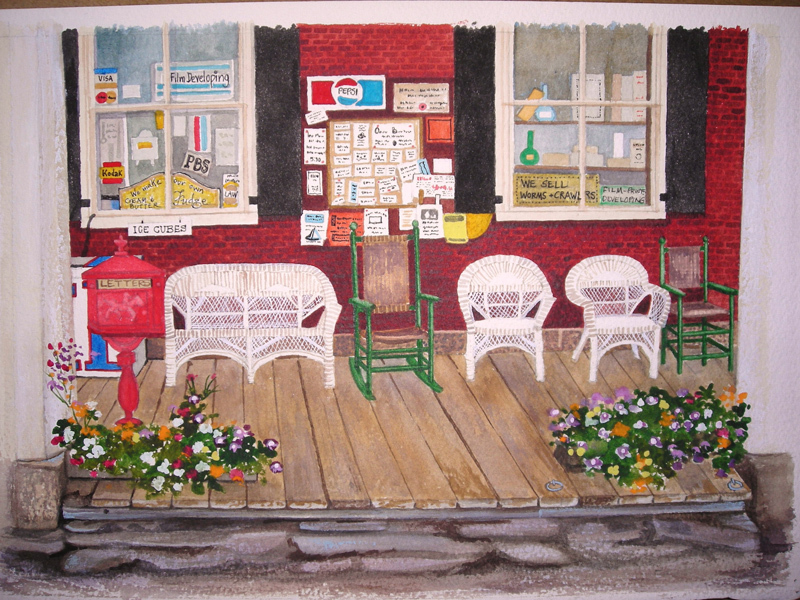 Jane White – Specializes in painting House Portraits in watercolor. Ms. White alternates painting with watercolors or pastels, sometimes in combination. 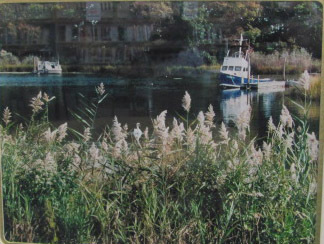 Jane has shown many of her paintings at the Art Associations and Society’s in Connecticut often receiving awards for her artwork. 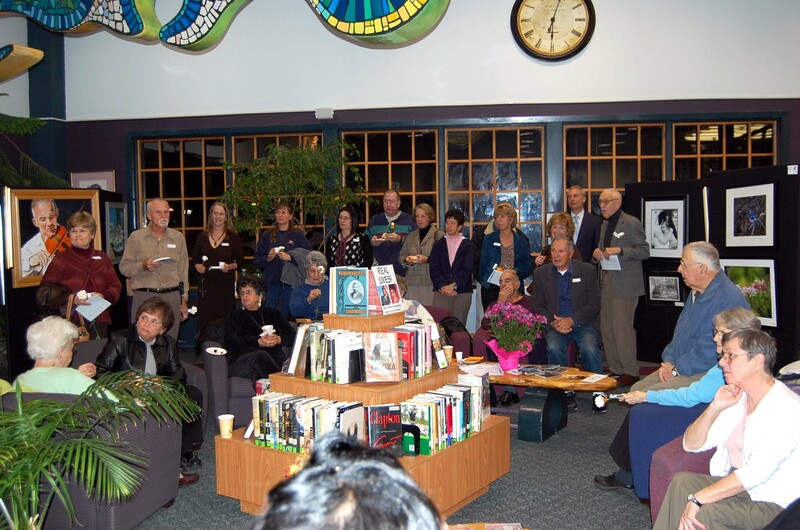 The community was invited to Celebrate ART, at a Reception to Honor the Gallery at the Library Artists of the Month, November 12, 2008 in the Café Area. 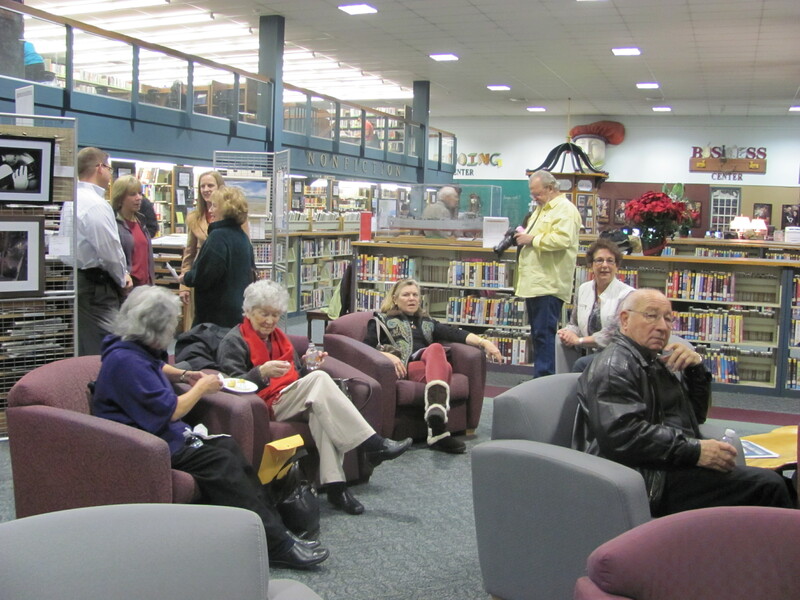 Light refreshments and entertainment were provided. 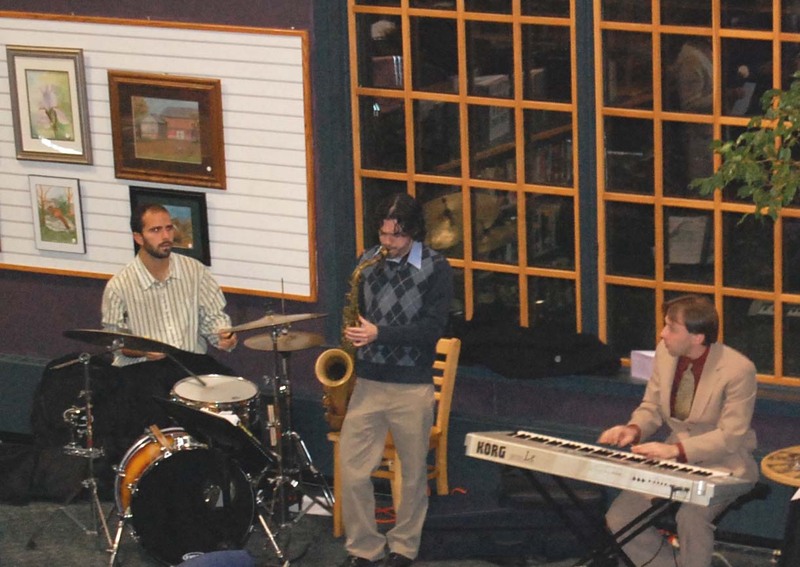 All in attendance enjoyed the sounds of The Isaac Young Trio, sponsored by the Southington Arts Council. 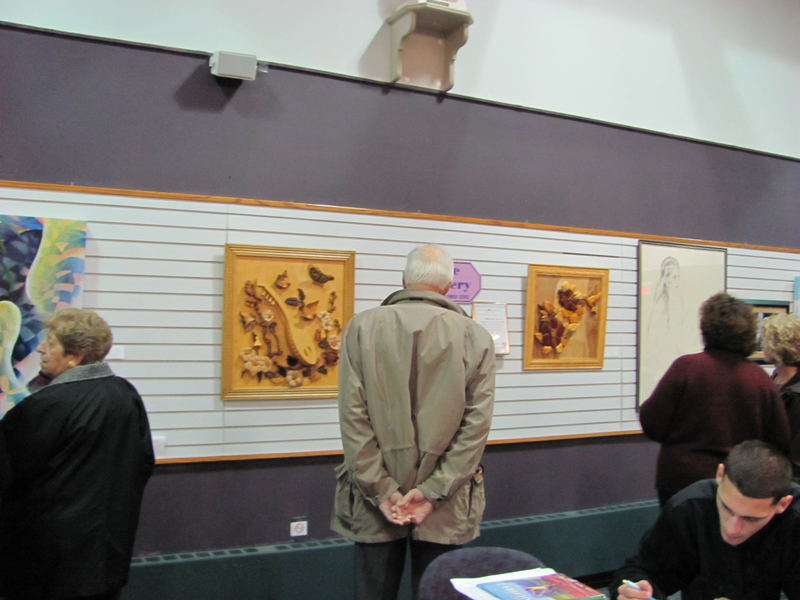 John Barry, Town Council Chairman and Library Director Susan Smayda acknowledged the over sixty (60) artists who have exhibited their art on The Gallery walls. Both Mr. Barry and Ms. Smayda emphasized the importance and joy Art brings into everyone lives. 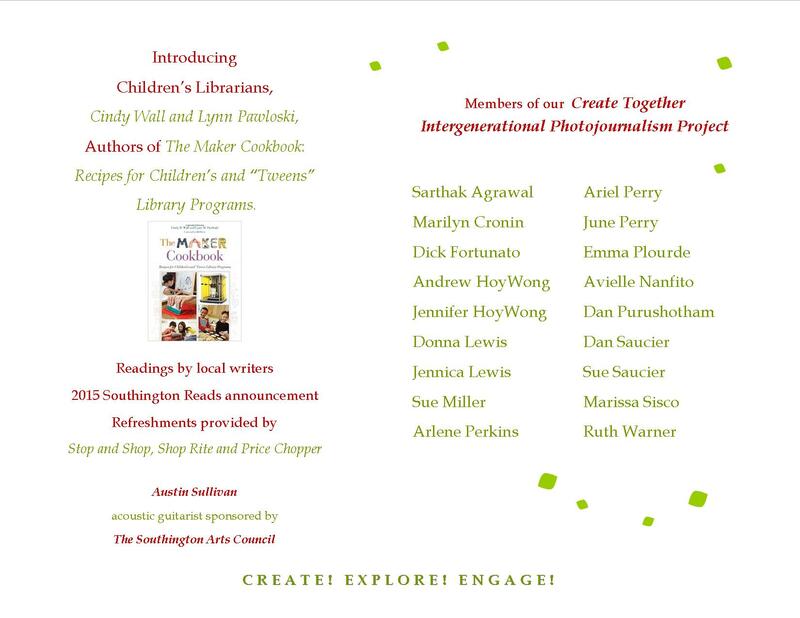 Co-sponsors of the event are The Southington Arts Council and Southington Library. 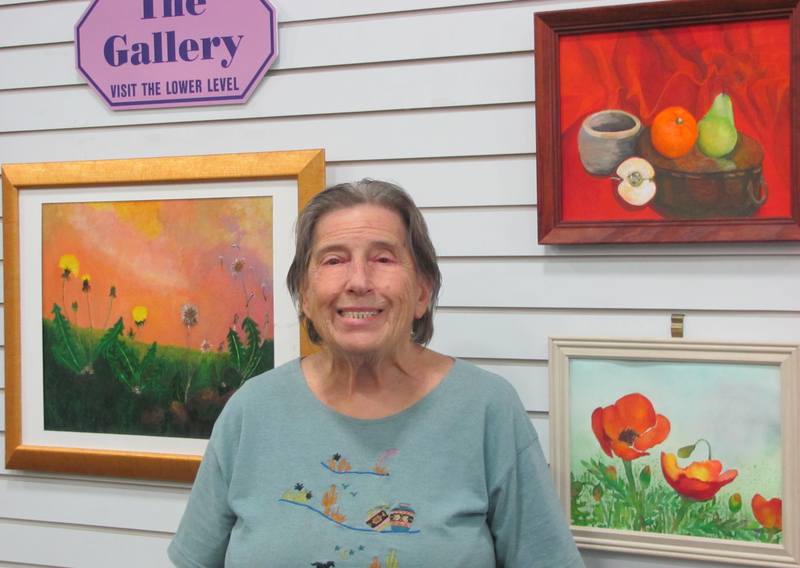 November Artist of the Month Barbara Varos Barbara Varos was introduced to artistic pastels, and watercolors at the “Arts Alive Studio” in Cheshire. Her instructors there taught the students with infinite patience and imagination utilizing their vast artistic knowledge. Barbara’s progression in the art field allowed her to show her works through the Cheshire Art League in many locations around the area. In addition, her participation in the Mount Carmel Art Show in Hamden resulted in a much appreciated award for one of her pastel paintings. Moving to Florida for a number of years Ms. Varos continued her art lessons and exhibiting her work. Upon returning to the area a few years ago, Barbara proceeded to expand her work into acrylics. 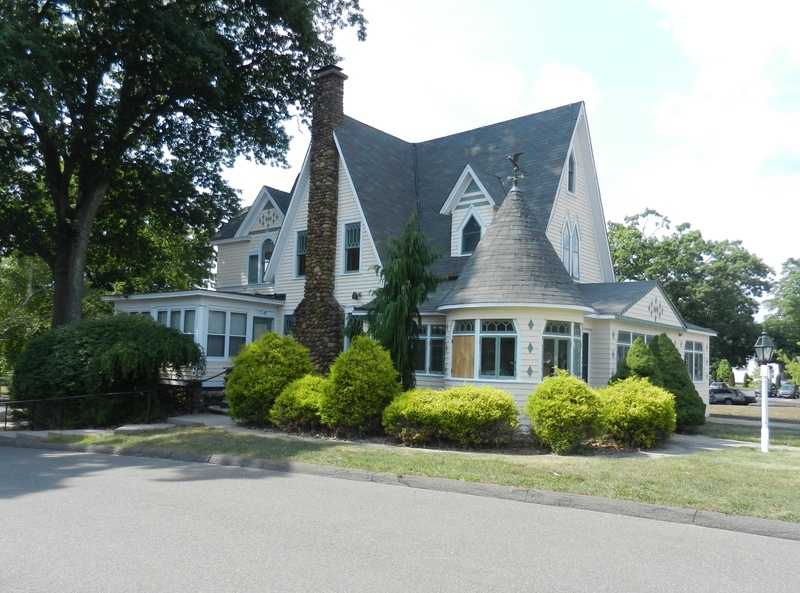 She is a member of the Southington Arts and Crafts Association, and attends classes at the Arts Place School in Cheshire providing Barbara with ongoing relationships with other students working in various mediums. 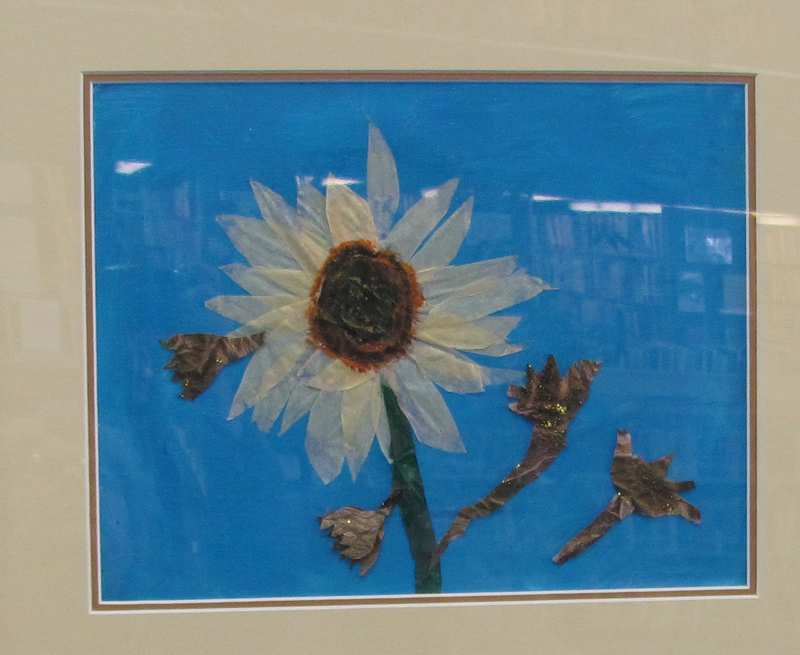 This year Ms. Varos was January artist of the month at the Cheshire Library. 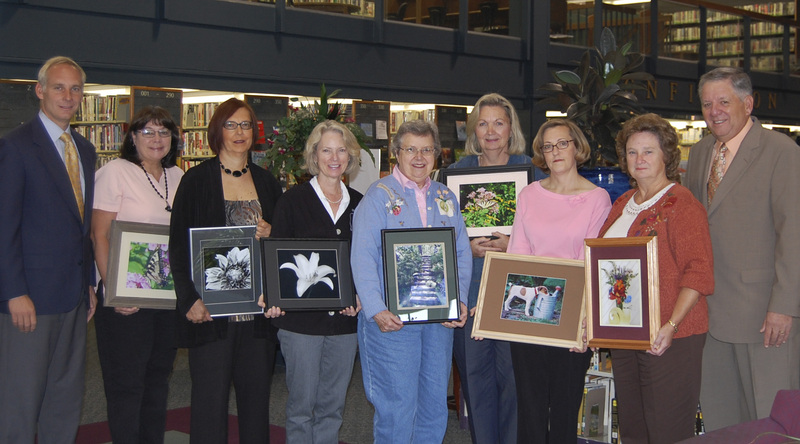 The Orchard Valley Garden Club of Southington presents, BLOOMERS, a photo show featuring healthy soil, healthy plants, healthy people and pets, gardens, landscapes, and nature at the Southington Library. Join the club October 28, 2008 at 10:00 am in the lower level program room of the library for the garden club photography awards and reception. 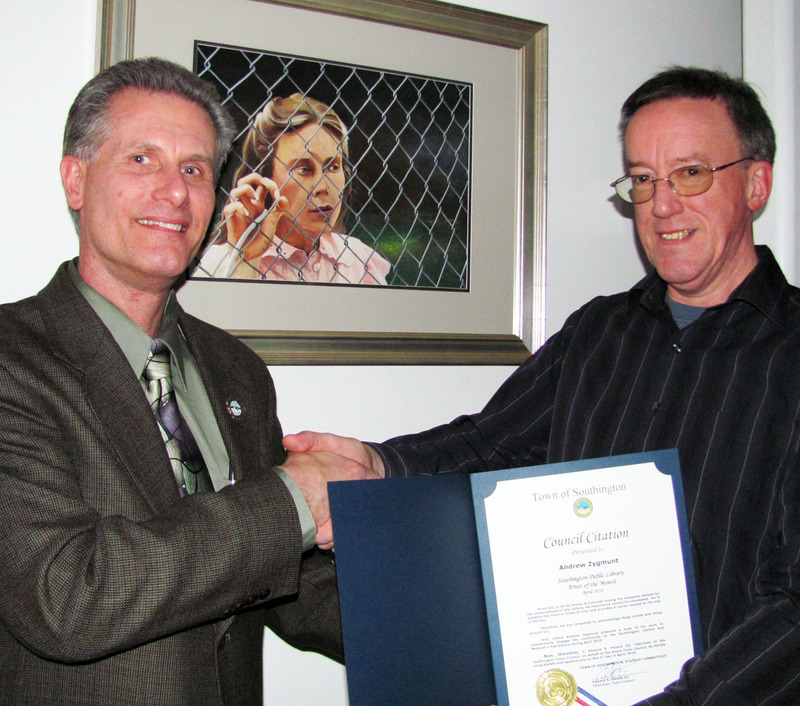 Judging will by Mr. Tom Hearn, photographer, graphic artist from The Picture Framer, Cheshire CT.
John Barry, Town Council Chairman and David Monti Library Board member presented members of the OVGC with Artists of the month citations for their photographic presentations of nature. Local artist Tina Angelillo recently greeted the public at the opening of her art exhibit “The Places I’ve Been” in The Gallery at Southington Library. Ms. Angelillo believes she has always had an eye for beauty and color. 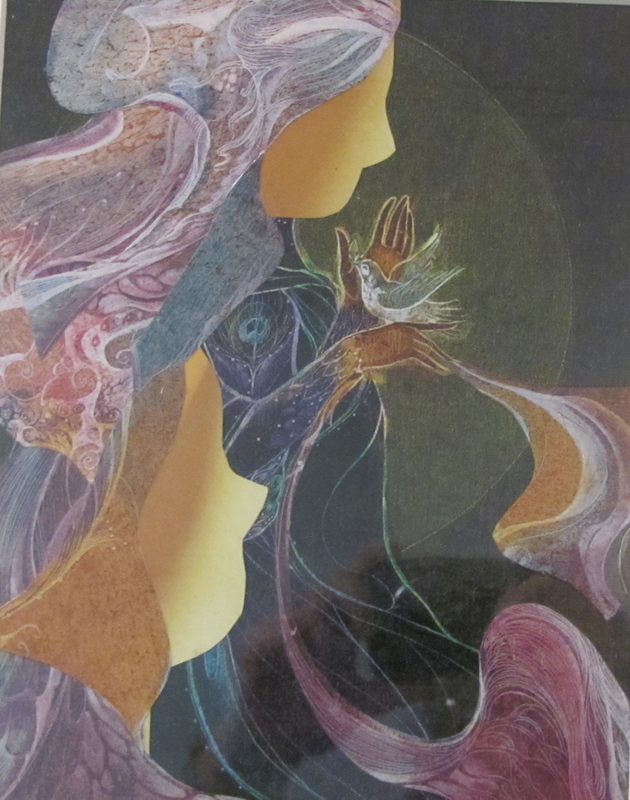 She is self-taught in many aspects of art appreciation, theory and the practices behind them. While attending college, she took several practicum’s in art history and photography; taking these courses developed her passion for art that she continues to enjoy today. 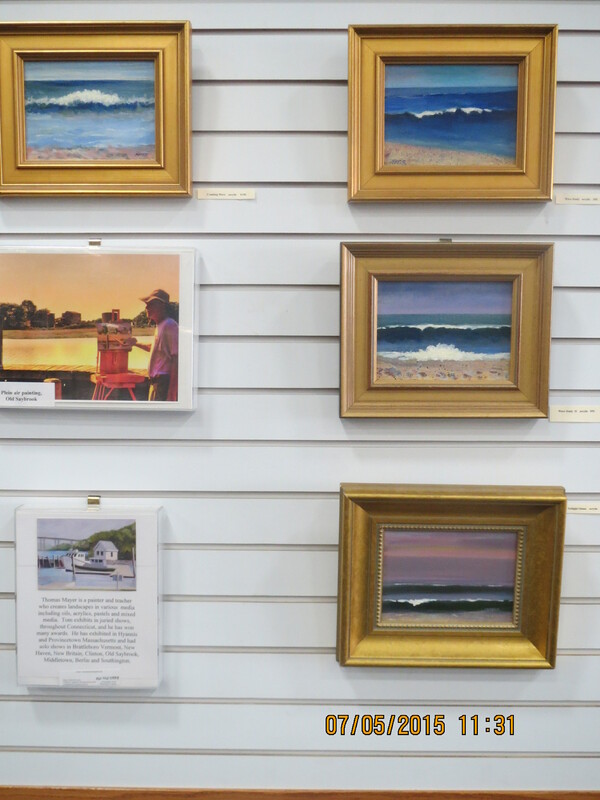 When she has time, Tina paints canvas and mat photographs and now is sharing her impressionist view of the world at her “The Places I’ve Been” exhibit. Where ever Ms. Angelillo may roam, she always has her Cannon with her because she wants others to be able to see for themselves, all of the beauty she has been lucky enough to experience. 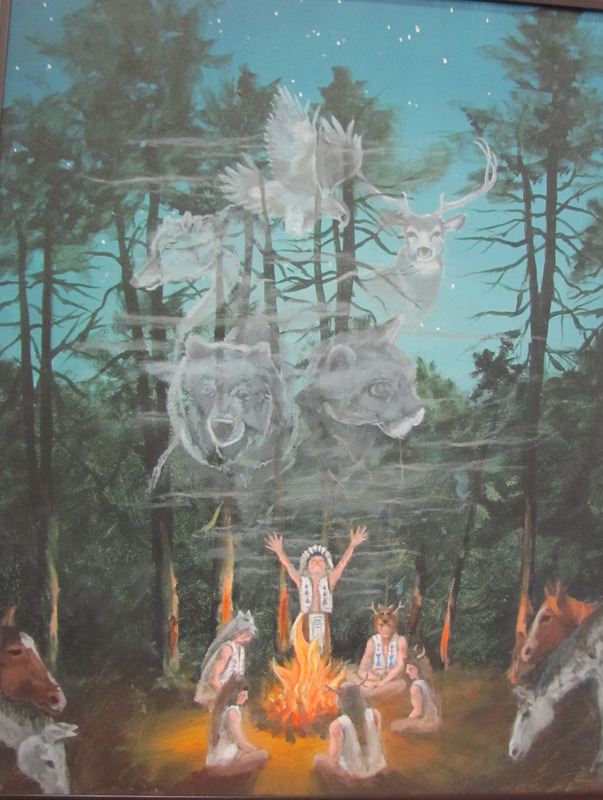 Stella Roman, returns as artist of the month for August to exhibit her paintings of Native Americans. Mrs. Roman attended an art university and worked in the art field in her native Poland. Stella has taken several instructional classes with several local artists most recently with the Calendar House Art Group. 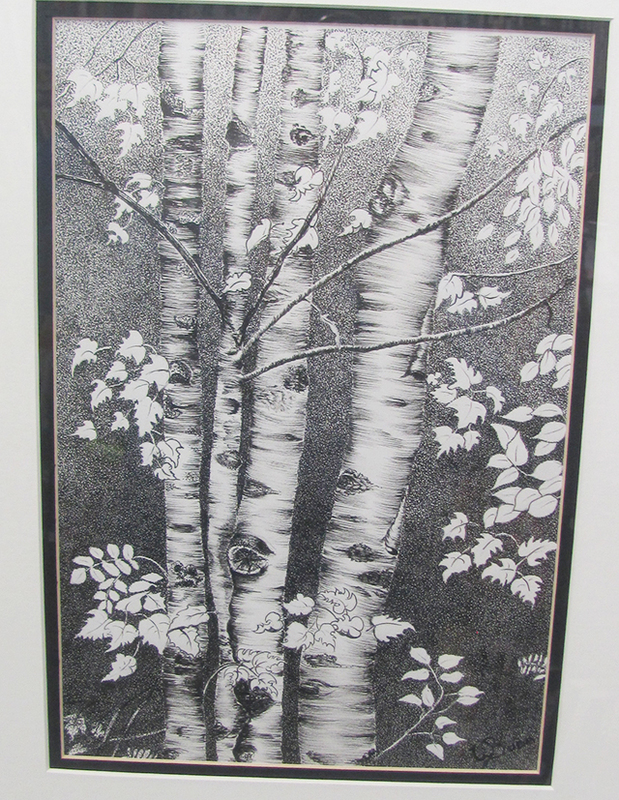 Mrs. Roman has exhibited her work at the Southington Arts and Crafts Juried Art Show and is enjoying her hobby in her retirement. Do you remember as a child looking at the dinosaur in the sky? Or, the pirate ship floating across the blue sky. Go back to that time to hear Ms. Scott discuss her work – The Weather Project:Shift. Stroll The Gallery at the Library as he presents a “snap shot” of the sky. Her discussion will be followed by a reception and her artwork will be on display the entire month of July. Scott has been exploring a body of work called “The Weather Project” since August 2006. 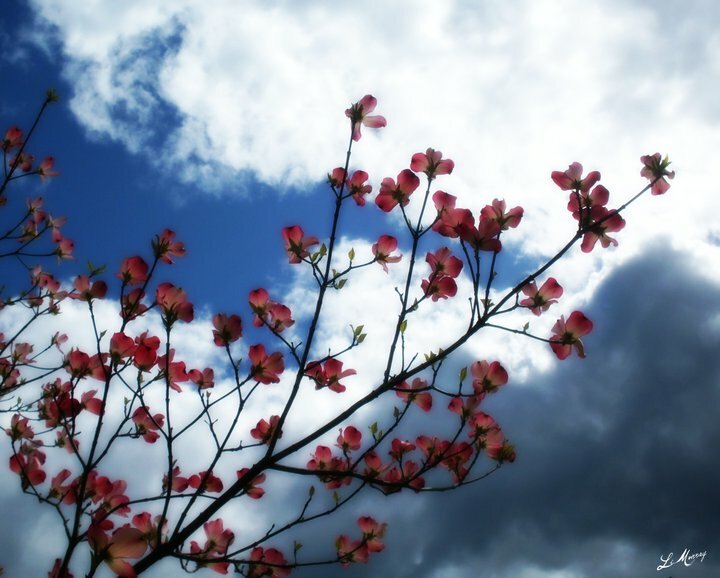 She uses photography and her experience of the day to render an image of the sky at a specific moment in time. 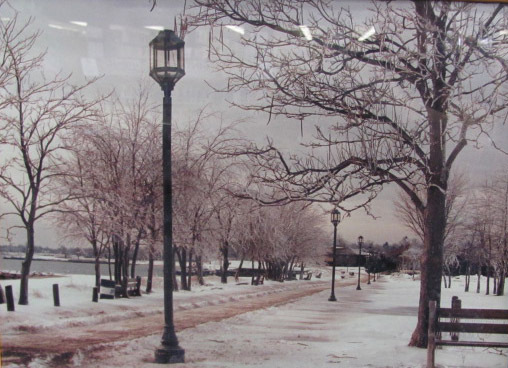 The first installment of the series, The Weather Project-September 2006, was exhibited in 2006 during New Haven’s City Wide Open Studio event in October. Scott recorded a daily “snap shot” of the sky to freeze a moment and then used photography, painting, collage and a compilation of headlines from local newspapers to pinpoint the day in “time”. This is a mixed media exhibit combining two of Ms. Fisher’s passions, photography and sewing. Some of the pieces are archival quality digital photographs, matted using a variety of different fabrics that enhance the image, and then framed. 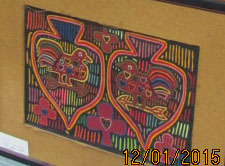 Other pieces were created by printing the photographs on fabric and then incorporating them into wall hangings, using a variety of needle work techniques, beads, cord and wire. 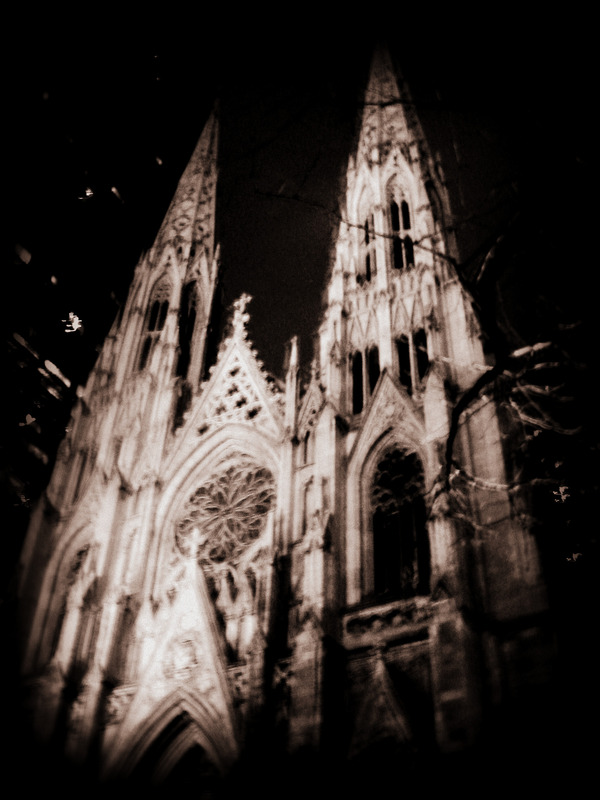 Lynn enjoys creating unusual effects, either with her photographic technique, or by manipulating her images digitally. 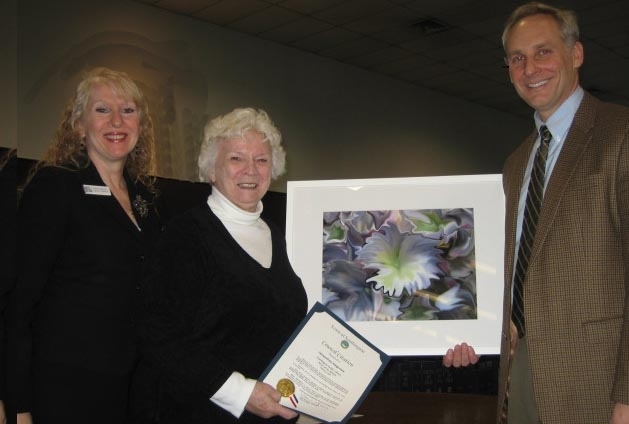 Lynn was recently acknowledged with the presentation of the Southington Town Council Artist Citation for her artwork which exhibits art in a different form. 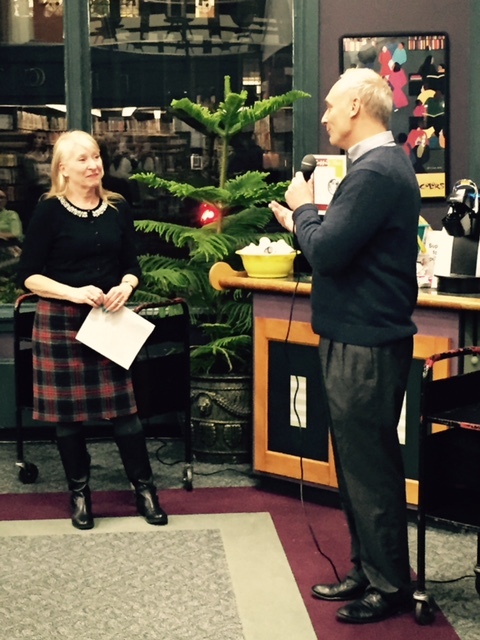 Town Council Chairman John Barry and Library Board member Marion Manware made the presentation at the library. Ms. Fisher has displayed her work regularly at Gallery 53 in Meriden, as well as having exhibits at the Meriden Public Library, Cheshire Library and Willoughby Wallace Library in Stony Creek. 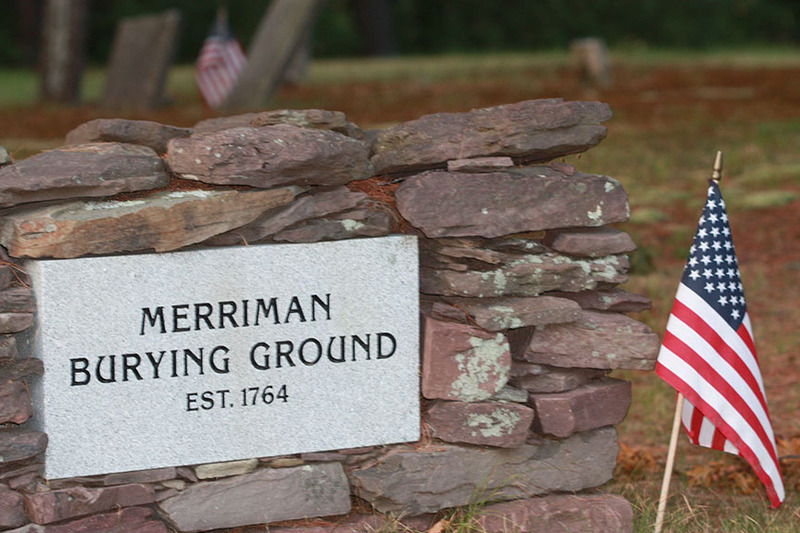 She is an active member of the Meriden Arts Council. Julie Goodwin is currently a student at Tunxis Community College and Middlesex Community College. 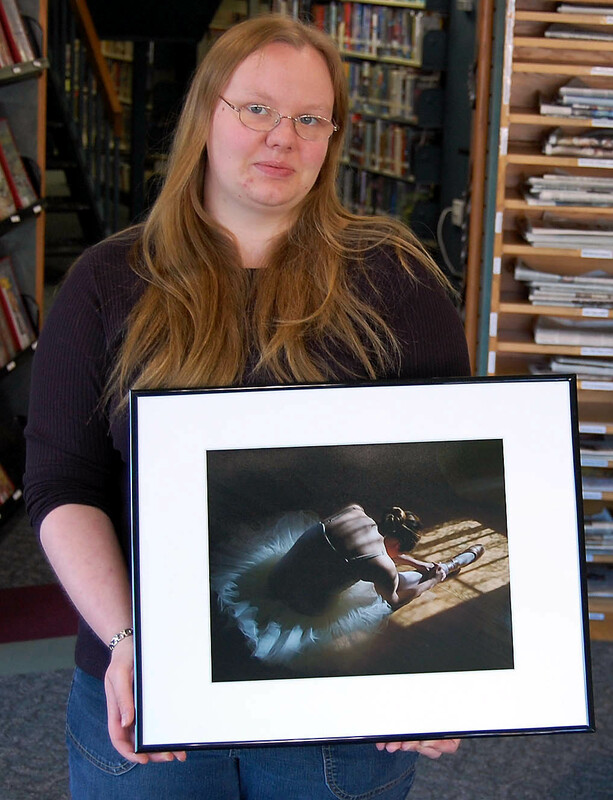 She will receive her second associate degree this spring in Photography from Tunxis. 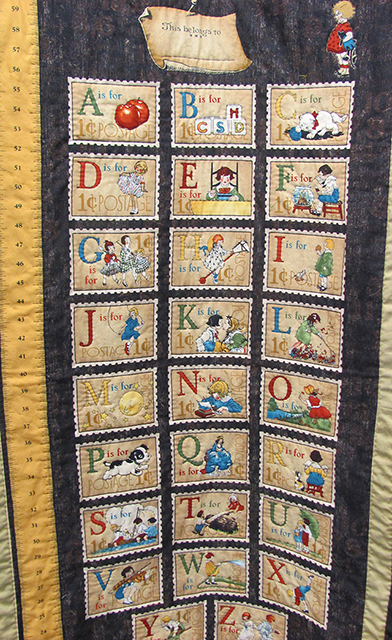 She has won many awards at local fairs and competitions including Best in Show at the Berlin CT Fair 07. Julie’s work has been published in Middlesex Community College’s Pegasus Volume 2: A Collection of Poetry, Fiction, Art and Design and Best of College Photography Annual 2008. Julie first became interested in photography during her junior year of high school while taking a basic black and white photography course. Her favorite subject to photograph is anything that relates to dance. She plans to transfer to a four year college next year to continue her photography studies. College. She enjoys portrait photography often setting the mood of her subjects in the romantic mood of the 1920’s. Ms. Anderson plans to further her education in photography at a four college in the future. 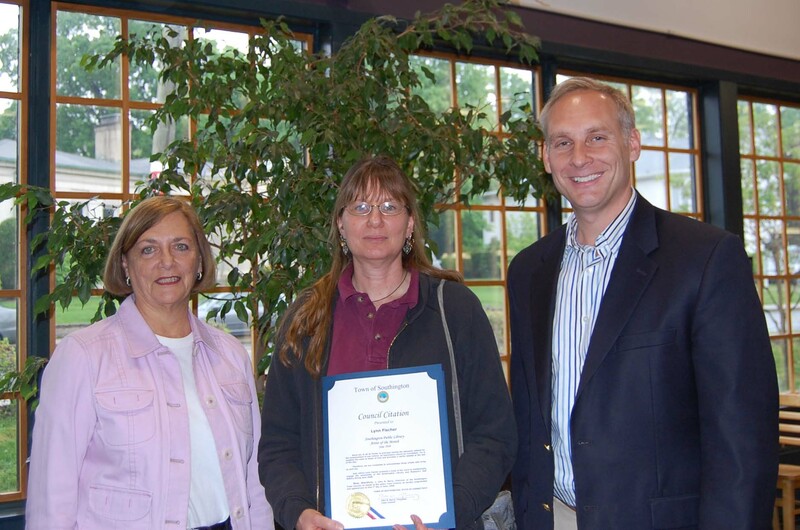 Town Council Chairman John Barry and Library Board Secretary Susan Reisman recently presented Ms. Anderson with the Town Council Citation for her photography. 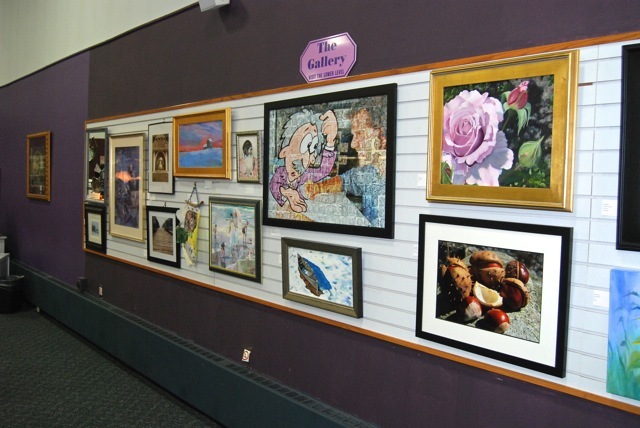 The Gallery at the Library is a venue for local artist to present visual art, bringing a measurement of culture and a view of the arts to the Southington community. 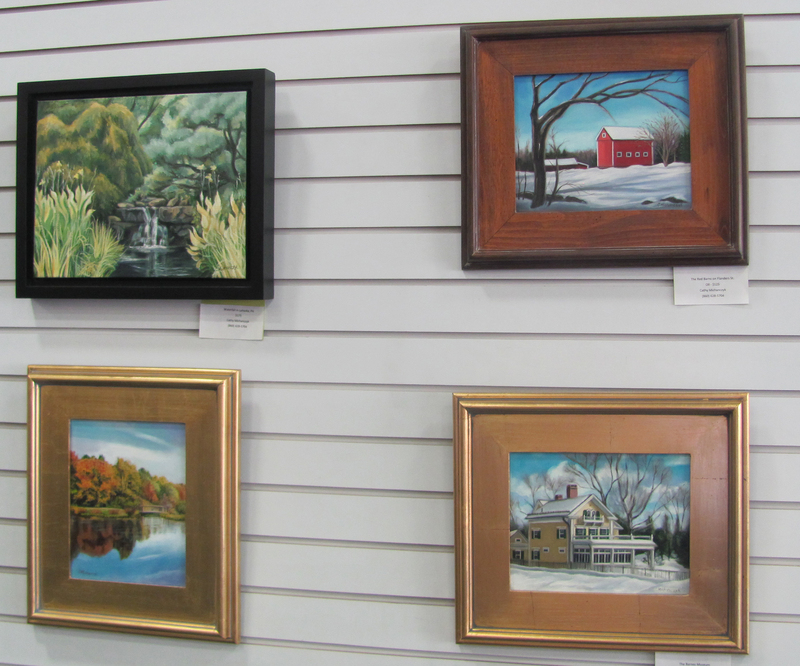 March Artist of the Month are Southington Artists, Harriet Bitar and Joanne Cyr. 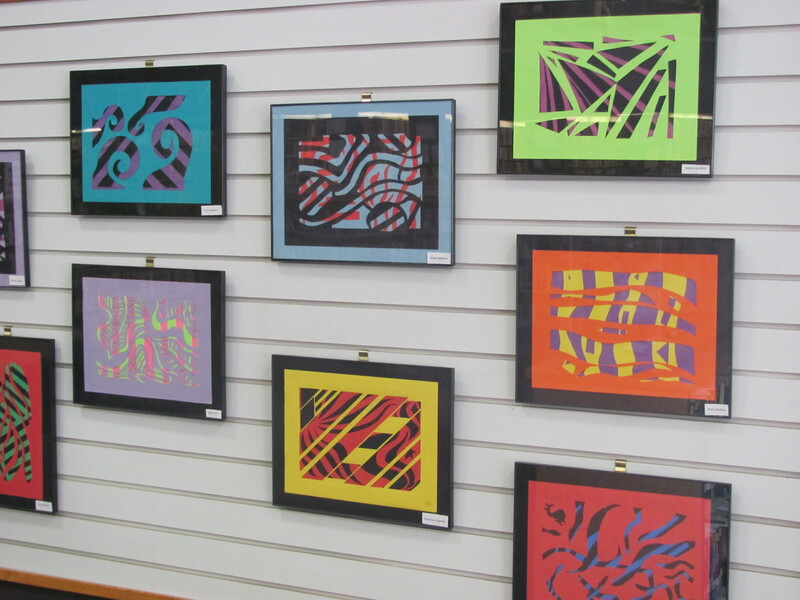 They will exhibit their artwork through the month of March in the Lower Level Gallery at the Library. The artist were presented with the “Artist of the Month” Citation by John Barry, Town Council Chairman with Theresa O’Connor Chairperson of the Library Board present. “Oil and Water” displays Joanne’s expressive talent in both watercolor and oil. 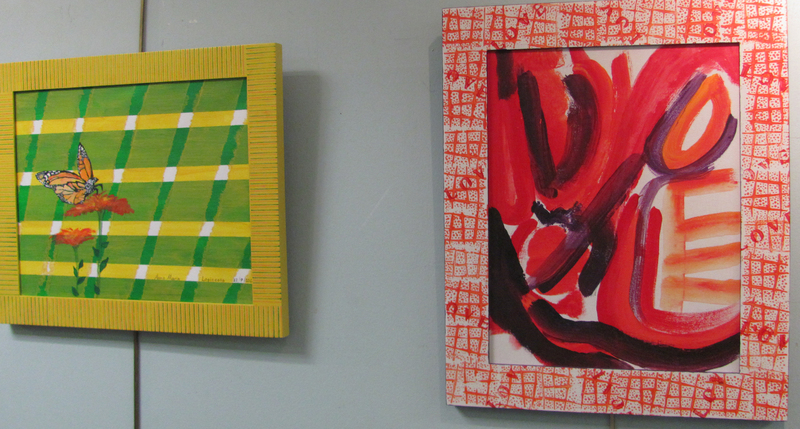 Ms. Cyr attends Paier College of Art in Hamden, realized at a young age the joy and fulfillment she felt when painting. 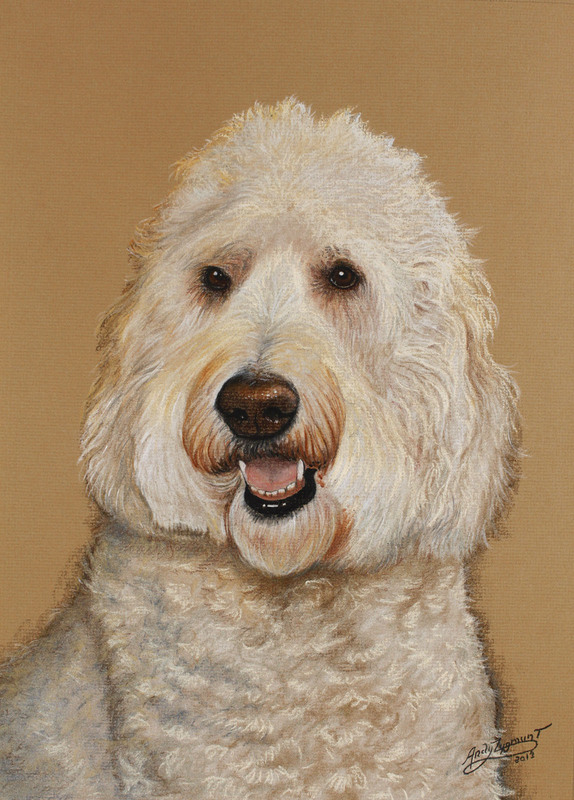 The subjects in many of Ms. Cyr’s works show that her main artistic interest focuses on people and animals. An avid animal lover even her landscapes tend to include some form of animal life. 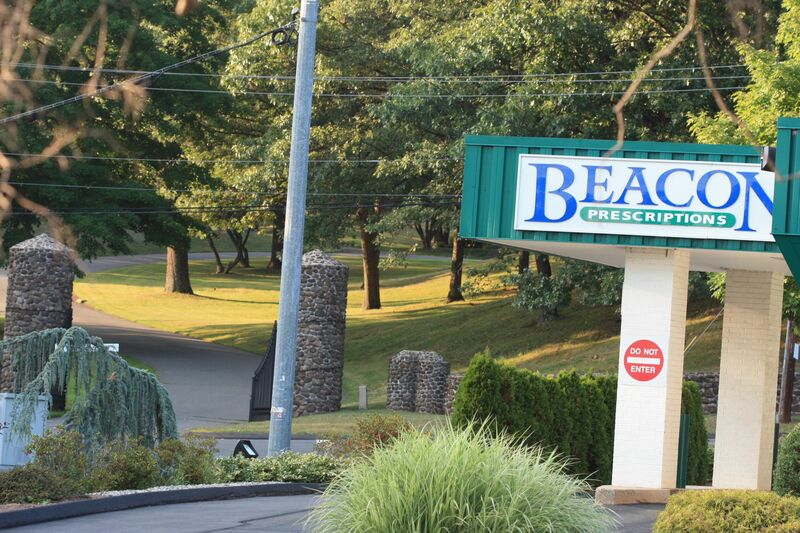 Ms. Dagenais grew up in Plainville, Connecticut and has been a resident of Bristol for 25 years and was the first employee to retire from Affinity, of The Hartford, in March 1997. She recently graduated from TunxisCommunity College with degree in Visual Fine Arts, having studied photography and art with Art professor William J. Kluba. 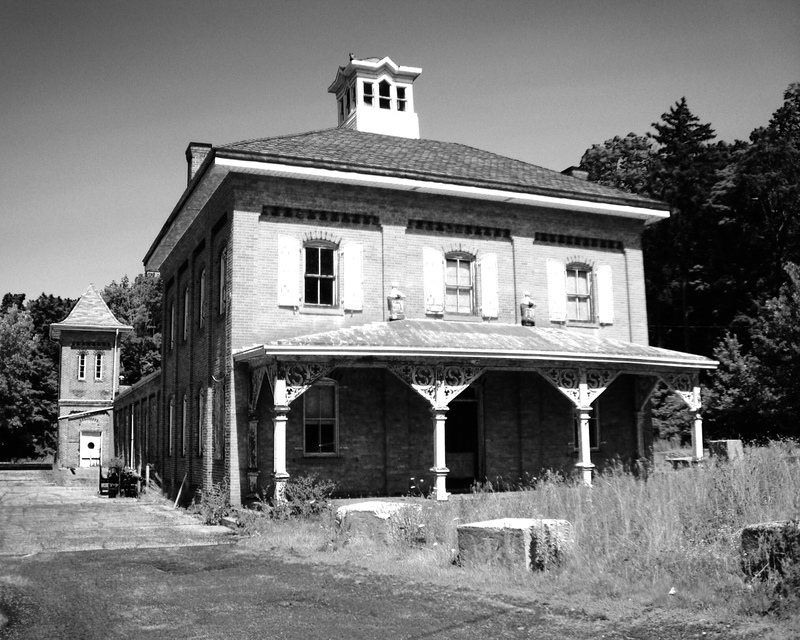 Dagenais is a member of the Southington Arts and Crafts Association and New Britain Museum of American Art. Recently she was awarded Best In Show at the Southington Arts and Crafts 2007 Art Show with her computer enhanced Dahlia. 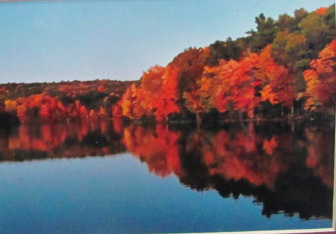 Ms. Dagenais has had the opportunity to publish several pieces in Photography Publications: Otto a Tunxis Art and Writing Publication, three computer-enhanced photos 2007 and the Plainville Citizen, Plainville, CT published a fall photo of Norton Park. 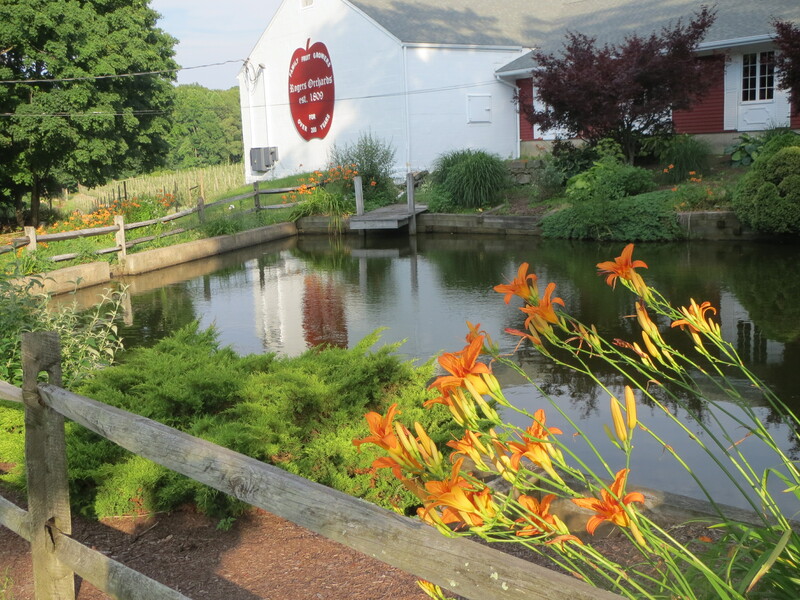 Jacqueline’s art works can be seen at ArtXCapes in Forestville, Connecticut and Angel’s Art and Framing in Southington, Connecticut. 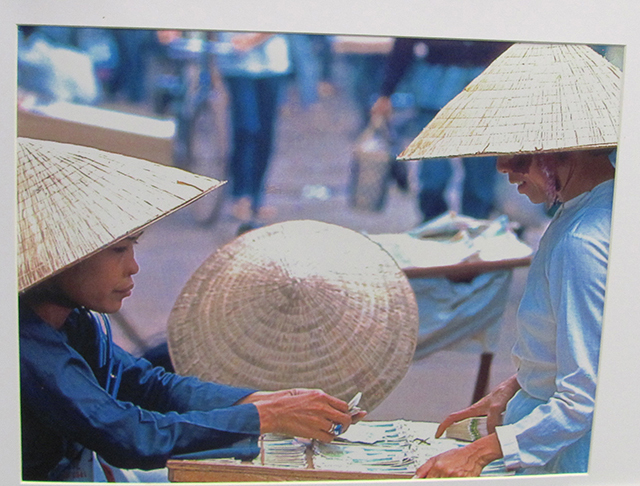 She has her business of note cards with original and computer enhanced photographs. 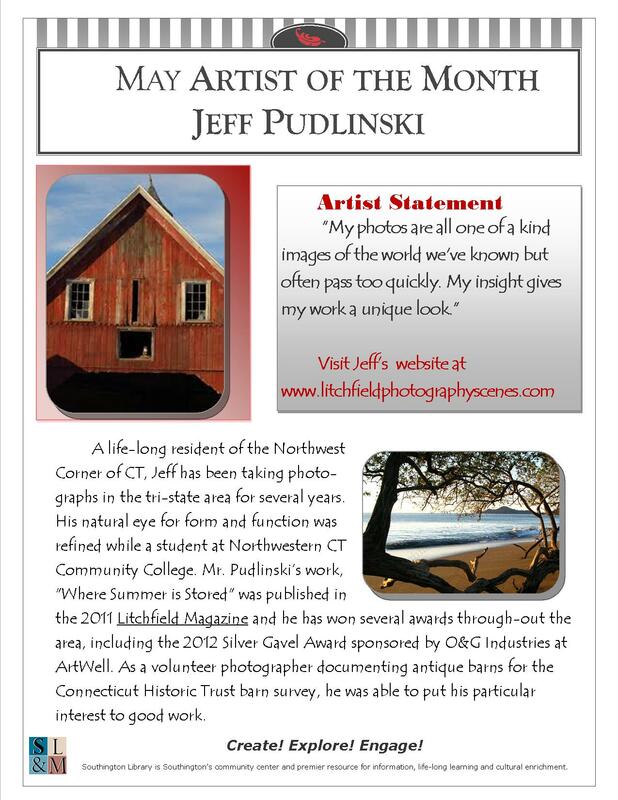 John Smayda, music teacher, photographer, clock enthusiast and Southington resident is the January 2008 Artist of the month. The public is invited to meet Mr. Smayda and view his photographs at his Opening Reception, Saturday January 5th from 2:00 pm to 4:00 pm. in the Gallery at the Library. John’s photographs will be on exhibit during the entire month of January.